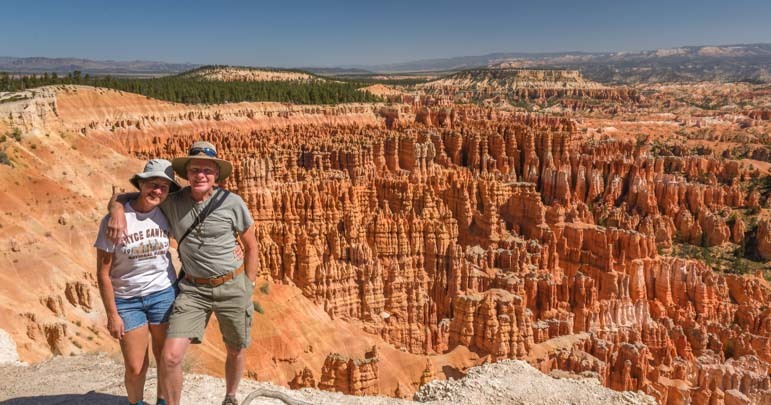 September 2016 – Bryce Canyon National Park is enchanting, and during our stay we were mesmerized by the beauty at Inspiration Point at sunrise, along the Rim Trail at the peak of midday, and descending into the Canyon along the Fairyland Trail in the early hours of the morning. 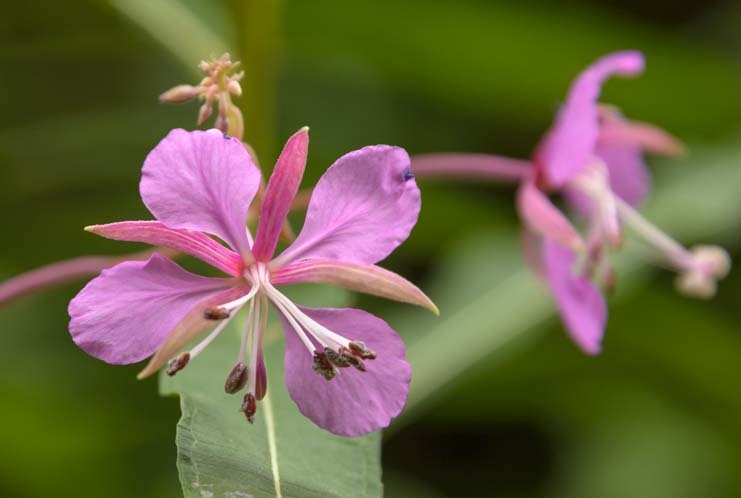 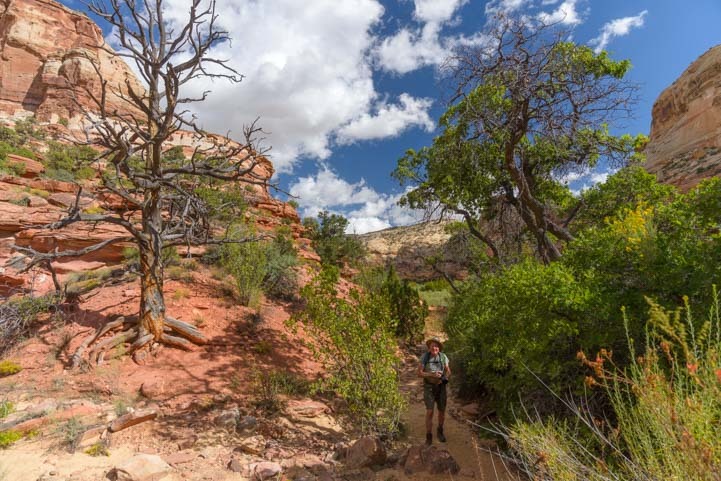 We had lovely sunny weather for these excursions, but suddenly the skies went dark and storms threatened. 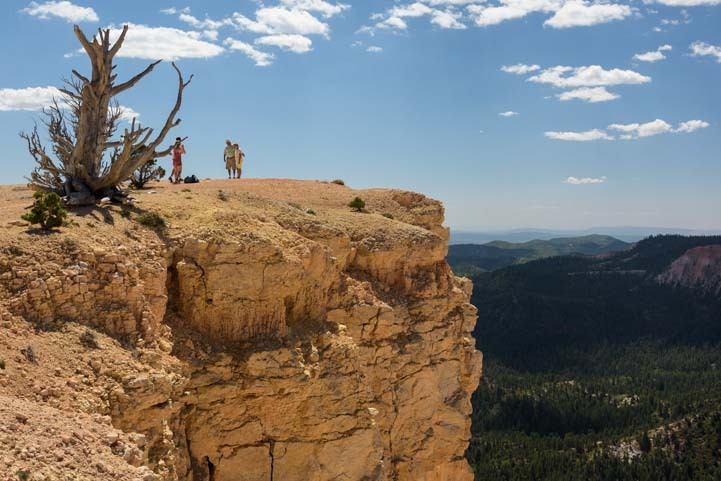 Watching a storm develop in Bryce Canyon National Park is a thrill, and they are regular afternoon occurrences in late summer. 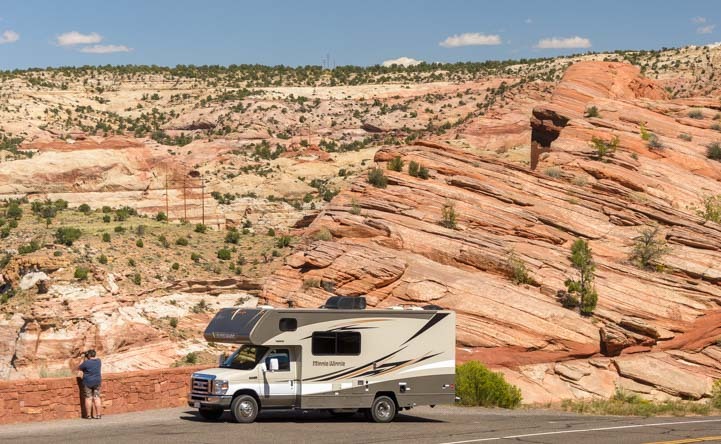 A storm brews over the red rocks. 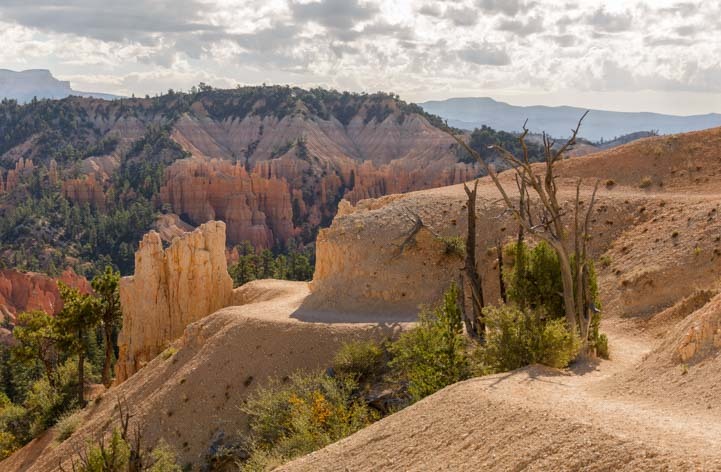 We had some all day rains, and on one of these days we drove down towards the south end of the Park. 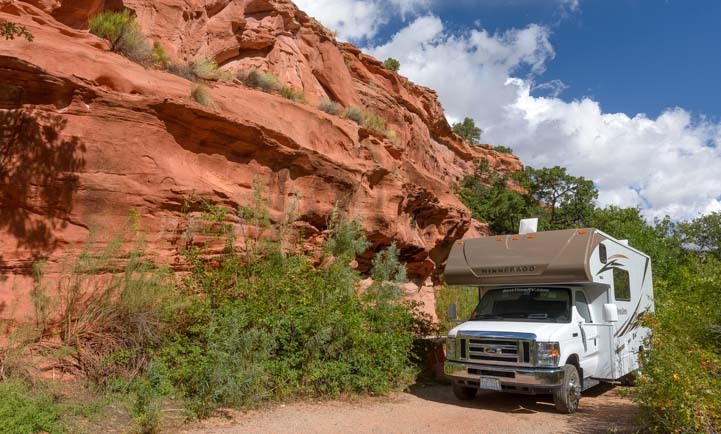 On the way, we stopped at Agua Canyon. 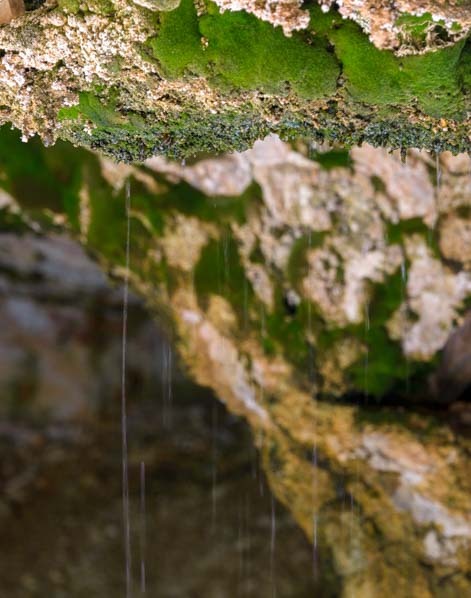 Looking down into the depths of Agua Canyon. 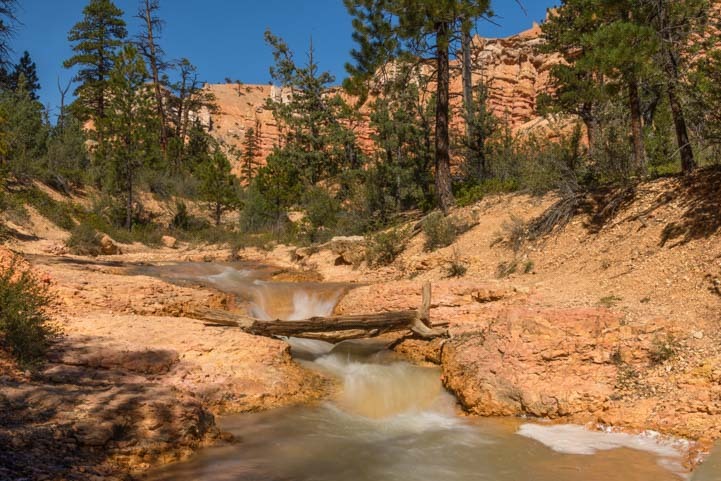 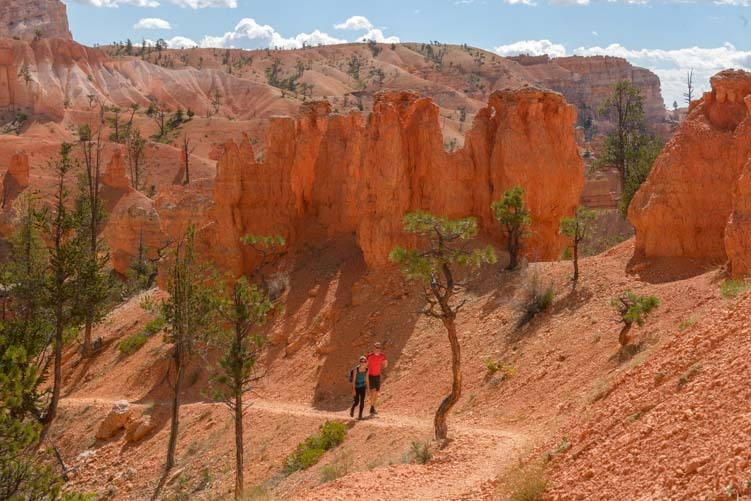 This is a beautiful part of Bryce Canyon in any weather, but as we climbed the trail that rises above Agua Canyon on its north side, we were blown away by how the colors of the soaking wet red rocks came alive. 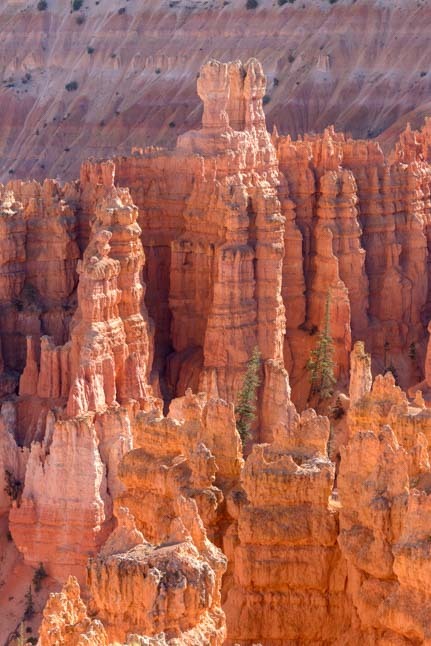 With no shadows to define each vivid red and white pinnacle, the shapes blended together in fantastic patterns. 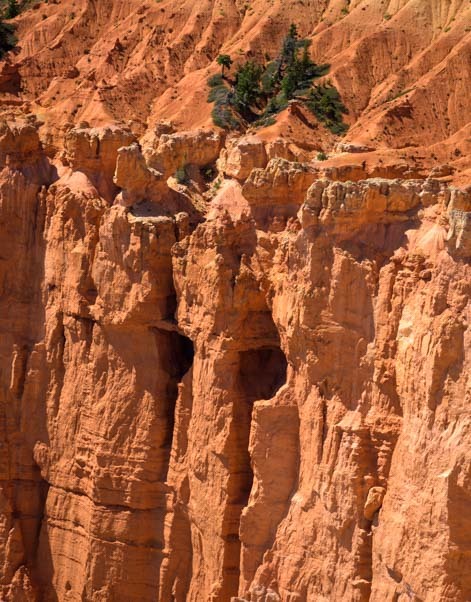 A woman stepped out on a precipice to take a photo, and her tiny blue figure looked like a mere speck against this vibrant backdrop. 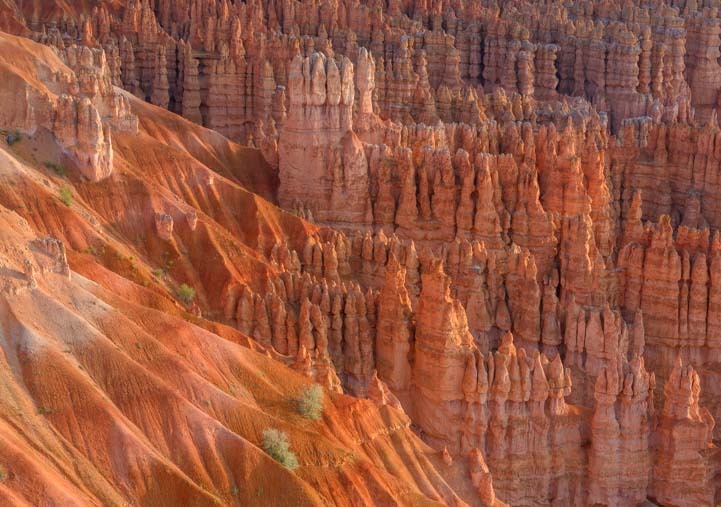 A woman is engulfed by the radiant red rock landscape. 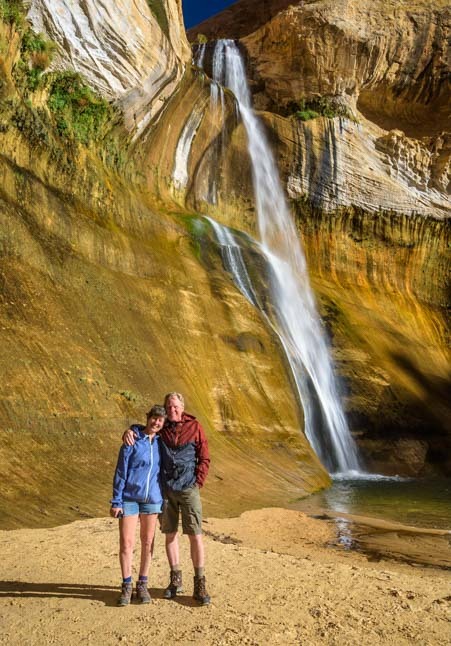 We hiked higher and higher above Agua Canyon, smitten with the beauty of this canyon in these wet and miserable conditions. 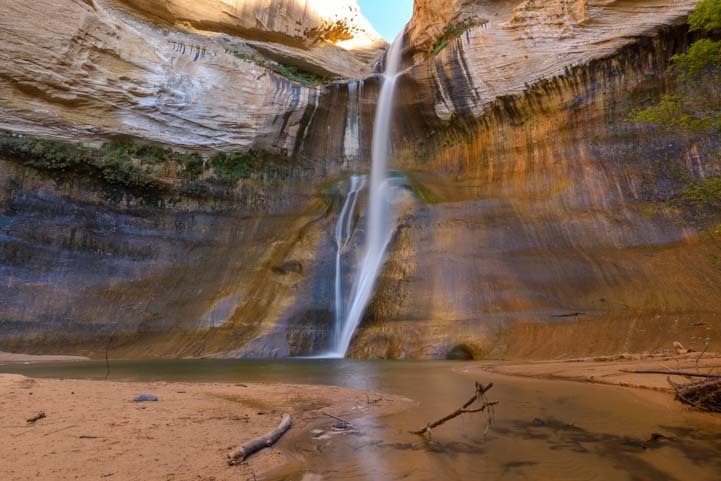 What luck to have discovered this spot on just such a day. 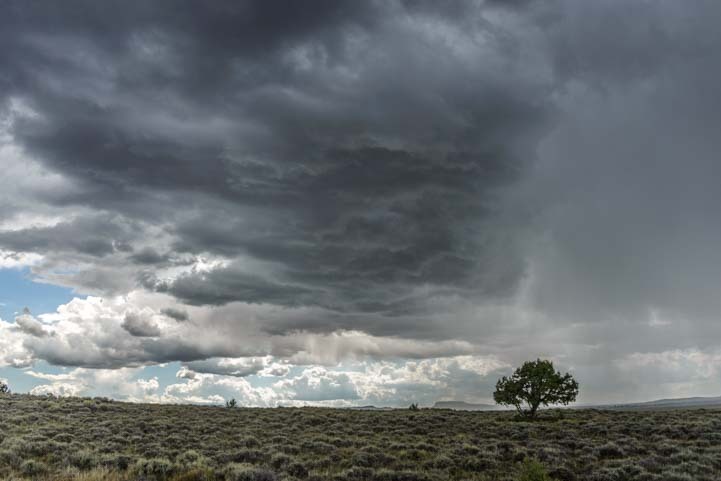 They always say, “Bad weather makes for great photography,” and how true that was on this rainy day! 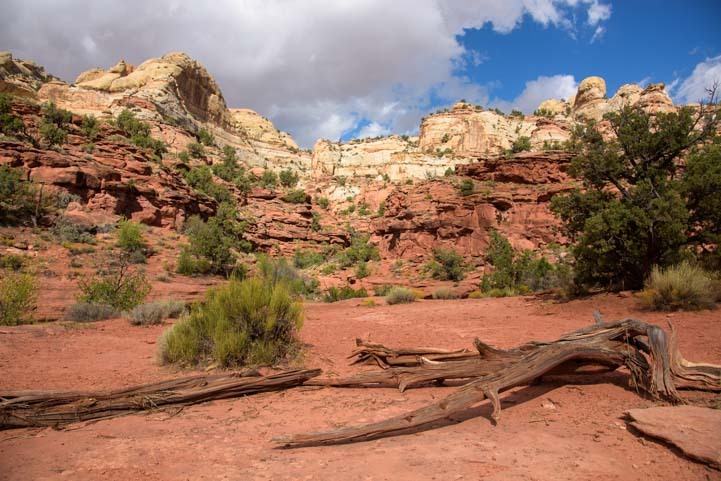 At the far south end of the park at Rainbow Point, lots of tourists were huddled under a shade ramada, bundled up to the hilt. 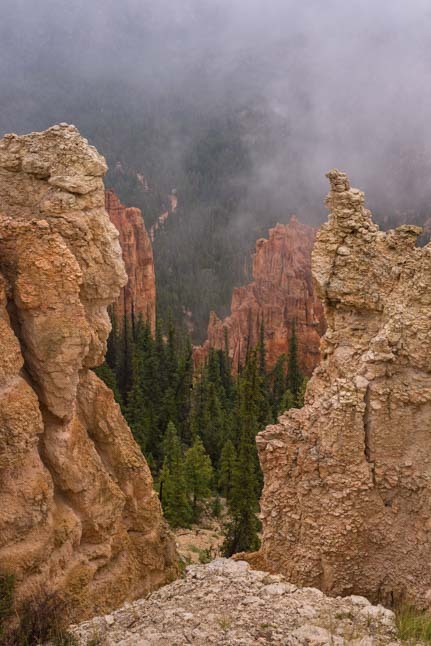 The usually stunning vistas were invisible because of the mist and fog, but we found a spot where the fog lifted just enough to peer through. 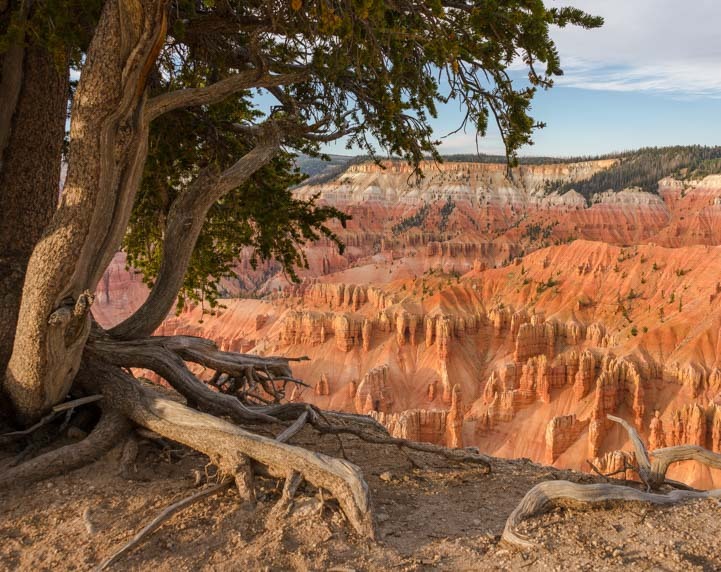 The mist clears for a moment at Rainbow Point. 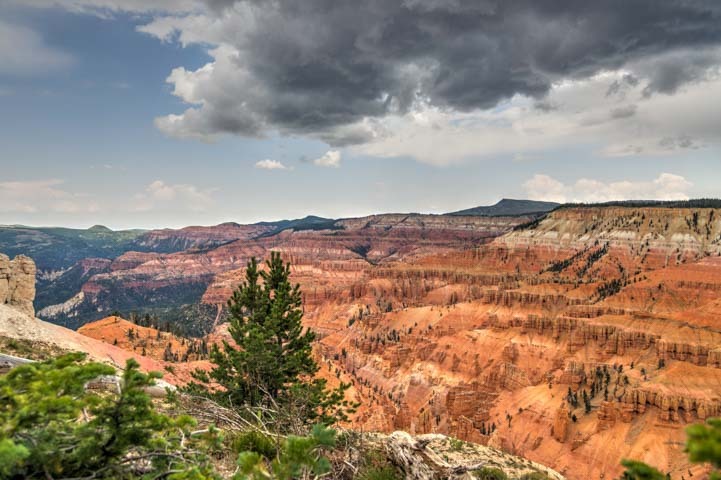 Out on the ranch lands around the edges of Bryce Canyon National Park, we saw some incredible storm clouds brooding in the sky. 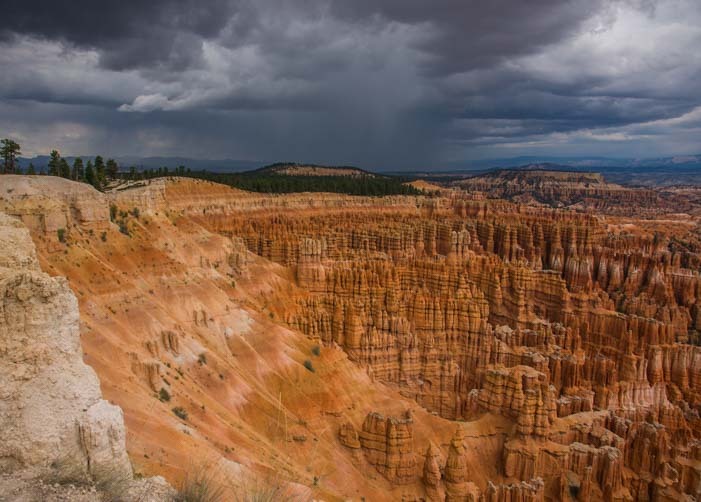 A storm sweeps across the plateau near Bryce Canyon. 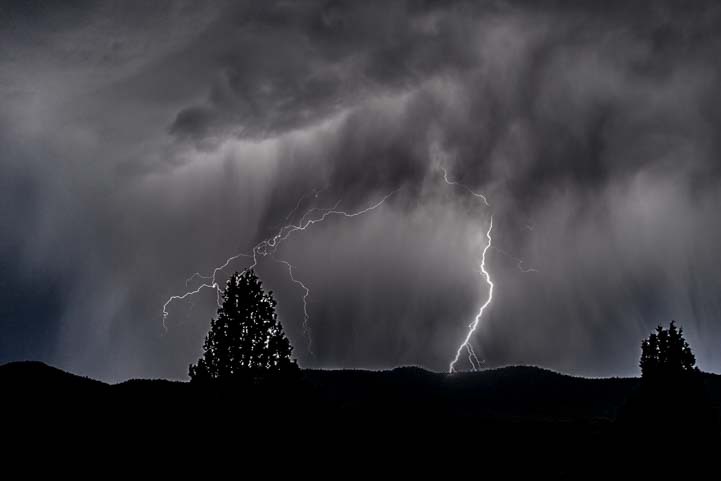 Suddenly a bolt of lightning split the heavens above us. 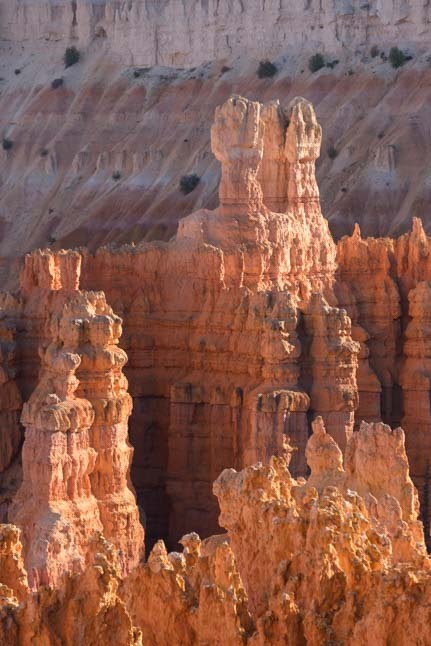 The gods let loose their fury! 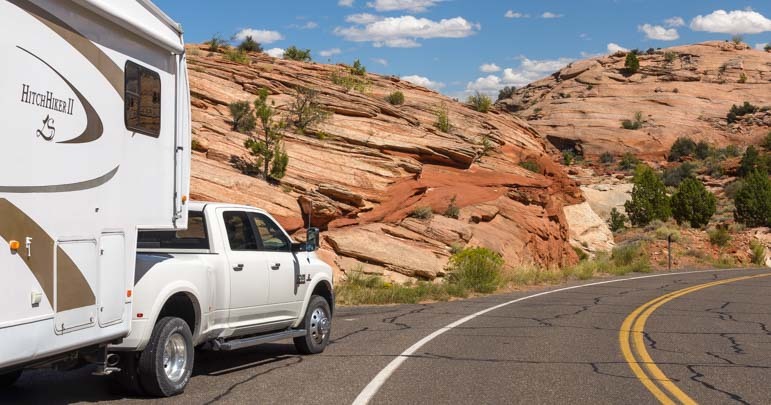 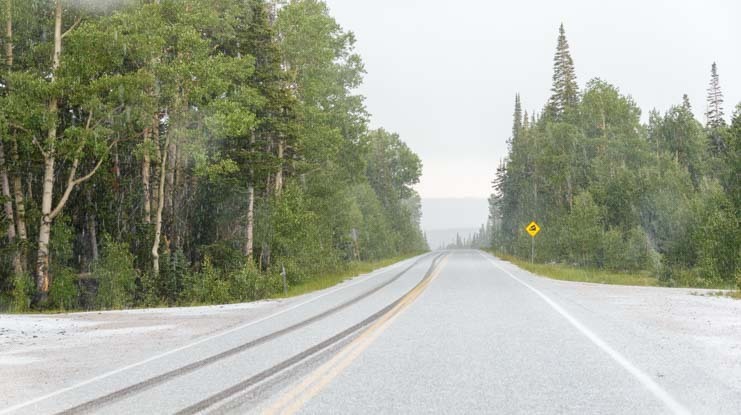 We hopped in the truck to go do some errands in nearby Panguitch, and in no time we heard the unmistakable sound of hail pelting the truck’s roof. 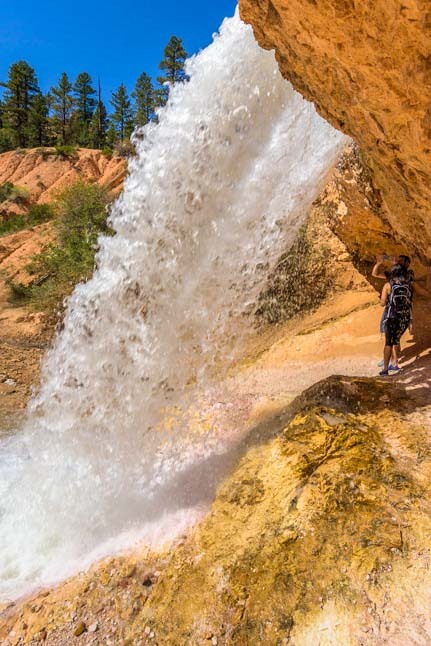 This was crazy! 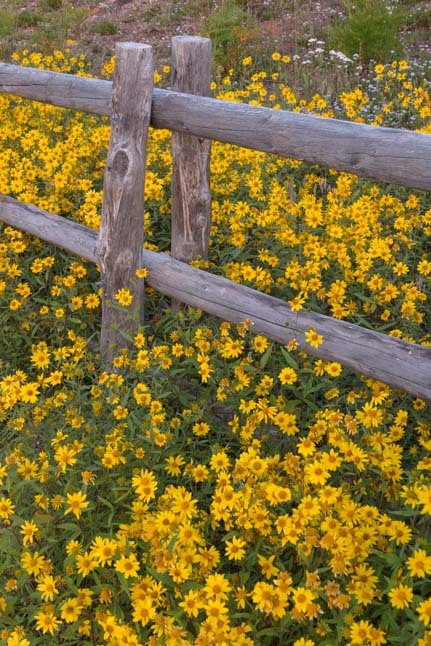 We were barely into the first week of September! 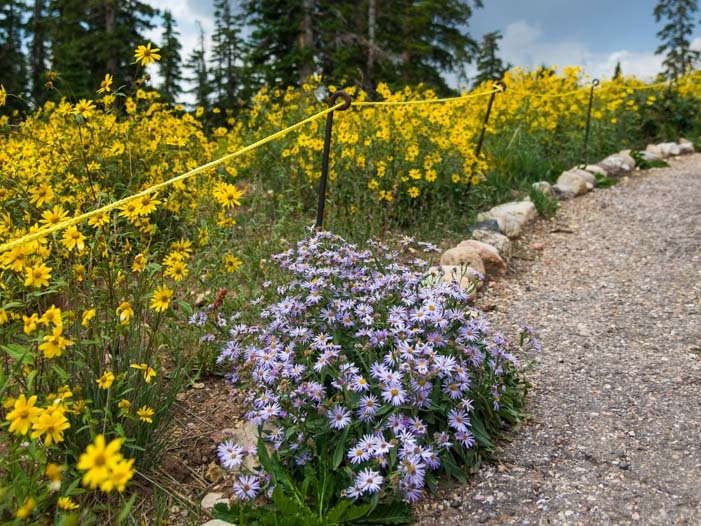 The hail piled up and made a wonderful contrast to the wildflowers that were blooming by the curb. 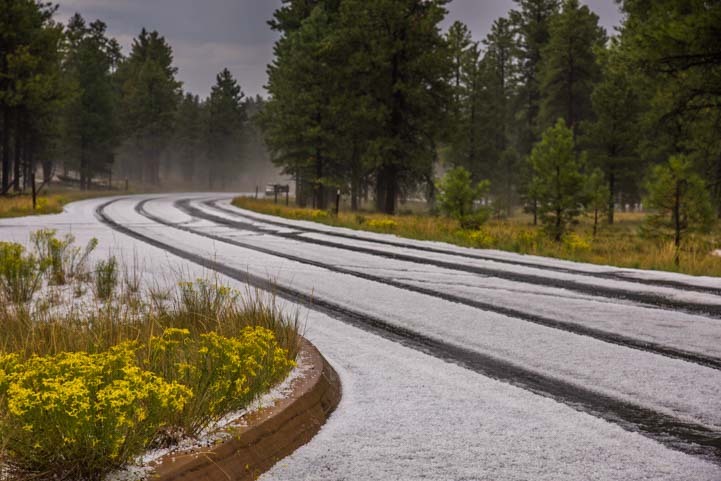 The roads between the wildflowers turned white with hail pellets! 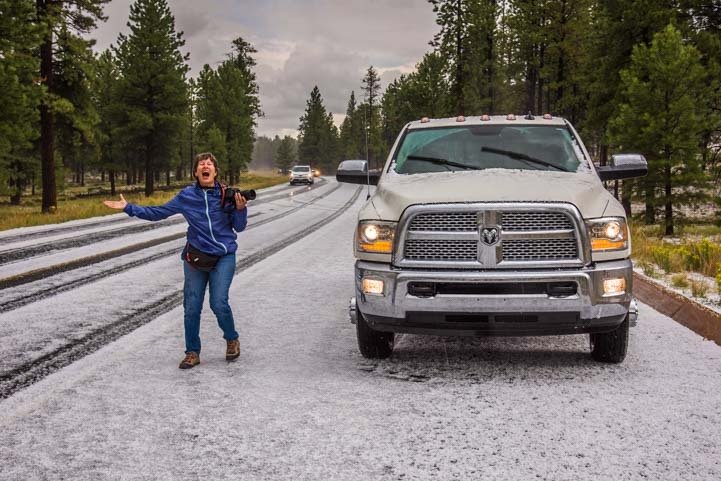 The hail was pea sized, but it made an incredible racket as it struck our truck’s roof. 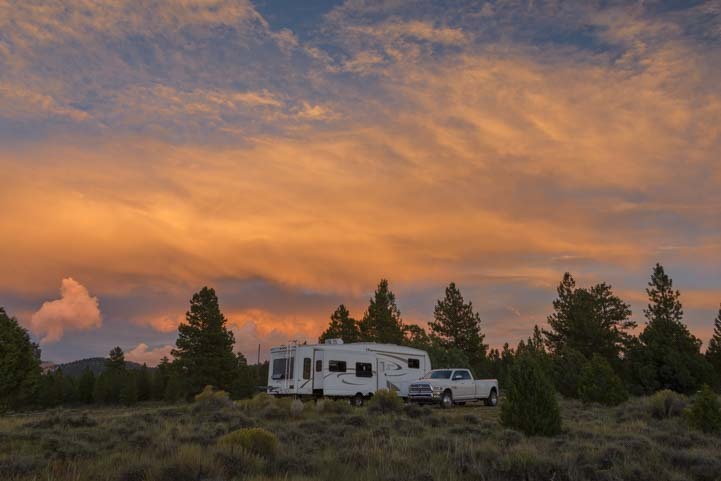 When we got back to the trailer, we were relieved that nothing had broken or been dented on our RV roof!! 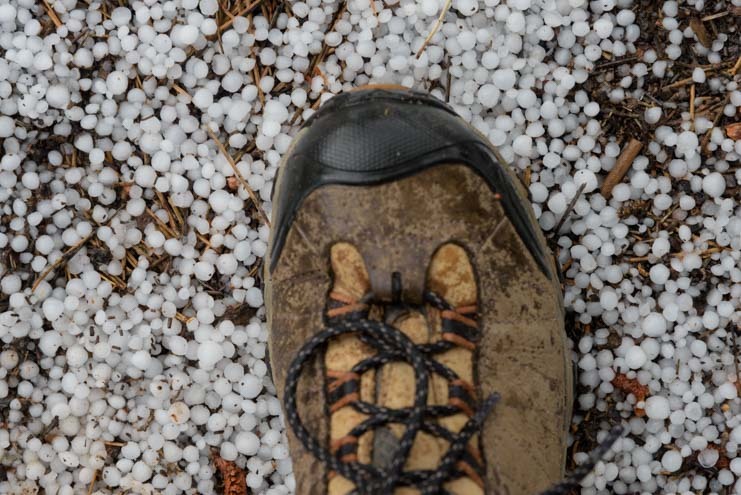 Yup, that is definitely hail! 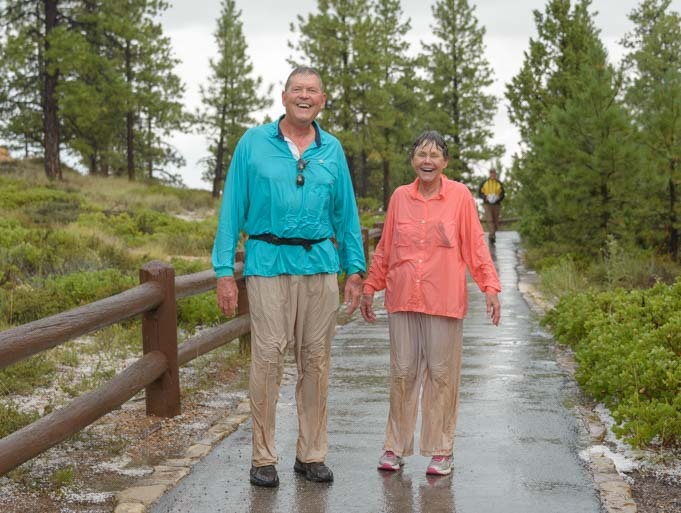 Wild thunderstorms and hailstorms brushed across the landscape more than once during our stay in Bryce Canyon, and at Inspiration Point one afternoon, we met a very soggy pair of hikers who had been hiking on the Peek-a-boo Trail for the last hour while we enjoyed the storm from the comfort of inside our heated truck! 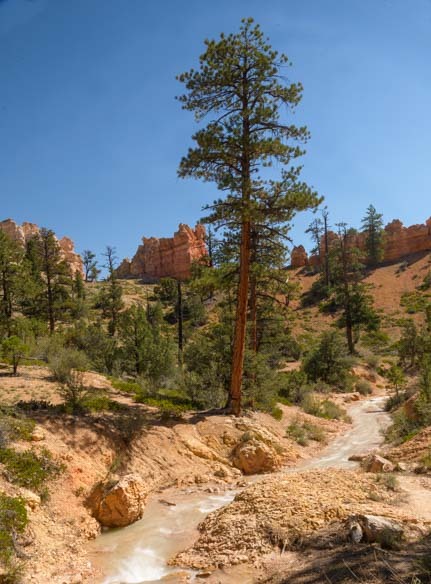 Getting caught in an afternoon storm turned out to be pretty common in Bryce Canyon at this time of year. 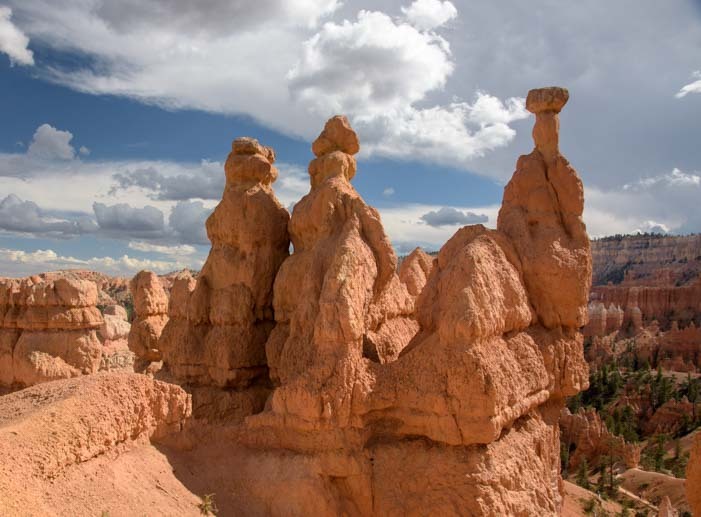 During our visit we became accustomed to the gathering clouds and eventual torrents that took place every afternoon, but they caught lots of hikers and visitors by surprise. 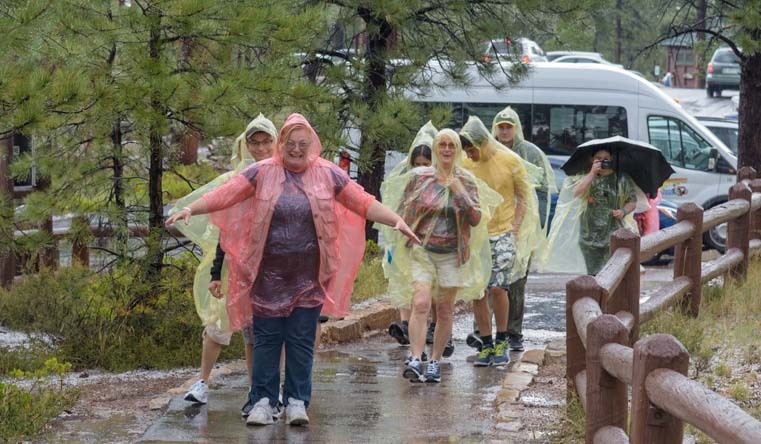 The show must go on, however, and a wet group of tourists on a guided tour passed us as we arrived at Sunset Point, and each was adorned in rain poncho of a different color. 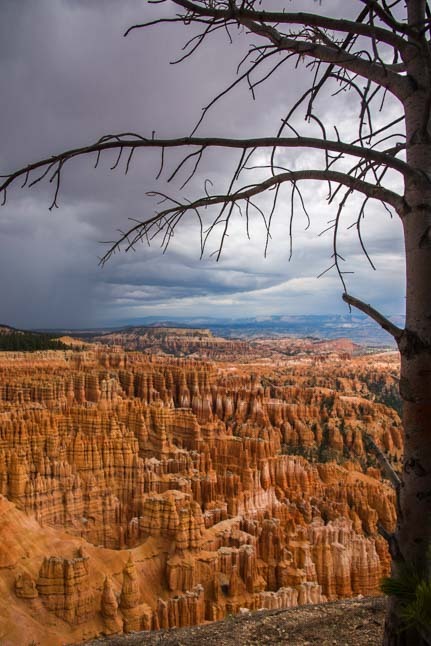 The gods took pity on all of us drenched visitors, however, and one afternoon as we drove along the wet scenic drive through the park we could see the sun shining beyond the black clouds. 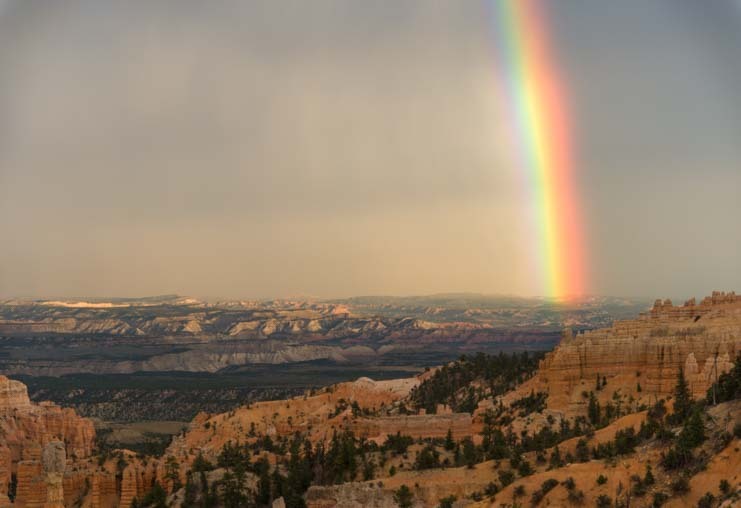 We whipped our heads around looking for the rainbow that had to be shimmering somewhere, and saw it was hanging over the canyon. 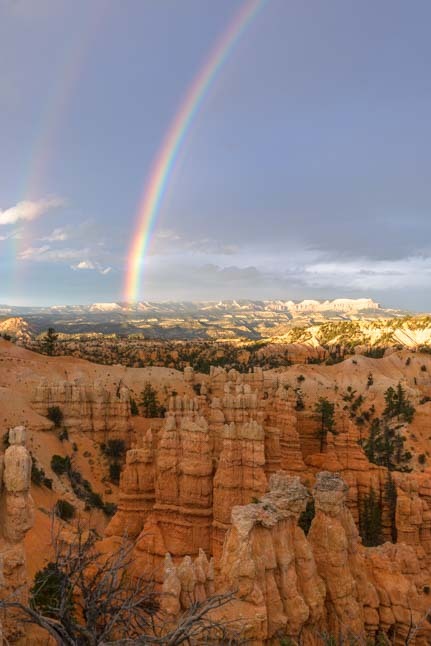 We flew out to Fairyland Point, the closest part of the rim we could reach, and there was the rainbow, in all its glory, spanning the canyon. 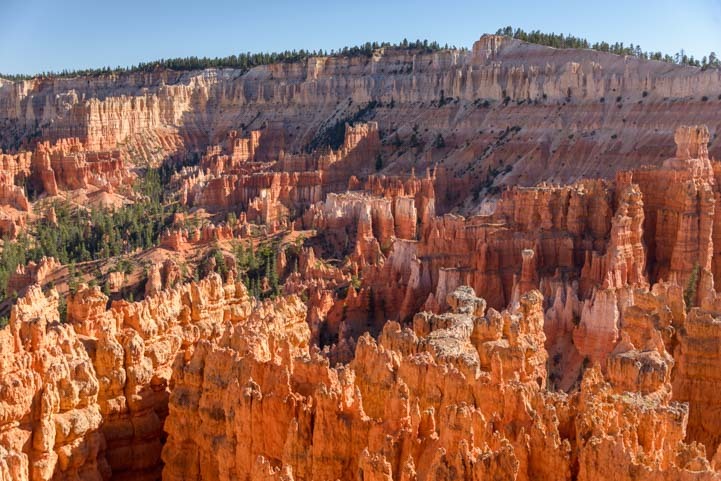 We watched in awe as it hovered over the canyon, and then grew brighter and dimmer at each of its ends, intensifying first on one side and then on the other. 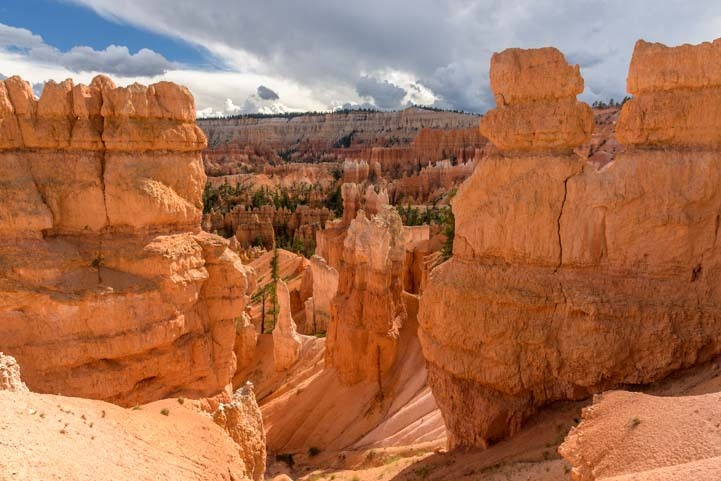 The wild weather we were experiencing at Bryce Canyon National Park was an adrenaline rush, especially as we dashed around from place to place trying to catch the drama in the peak of action. 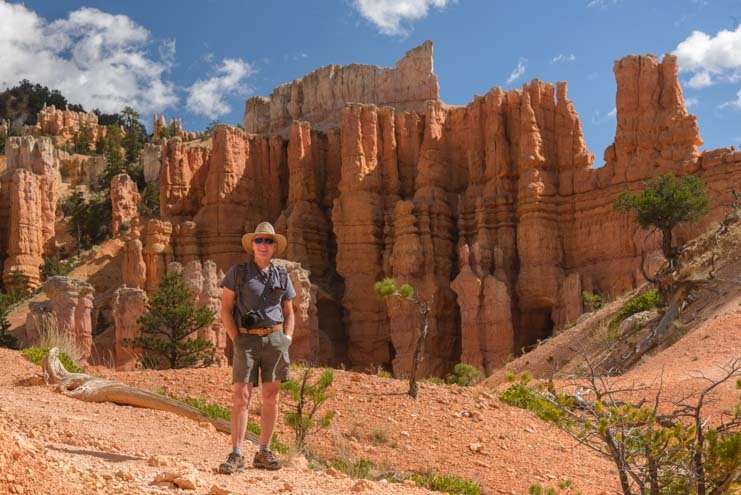 Back on our computers Mark had fun playing with some of his photos in Photoshop Elements. 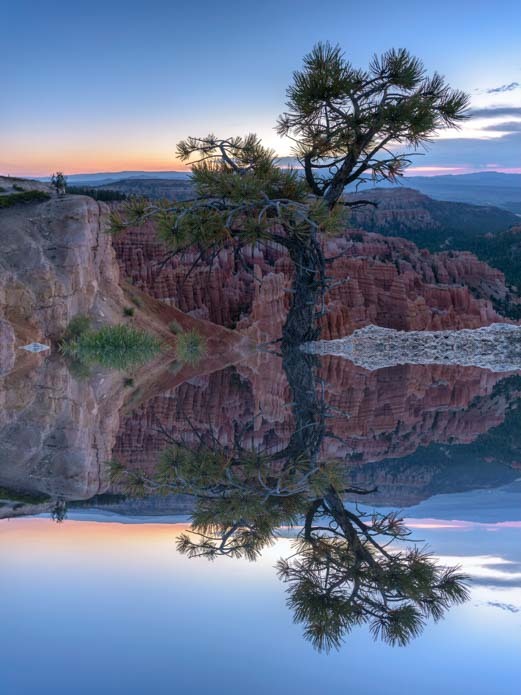 Suddenly a simple image of a tree against the red rocks was mirrored as if in a pond. 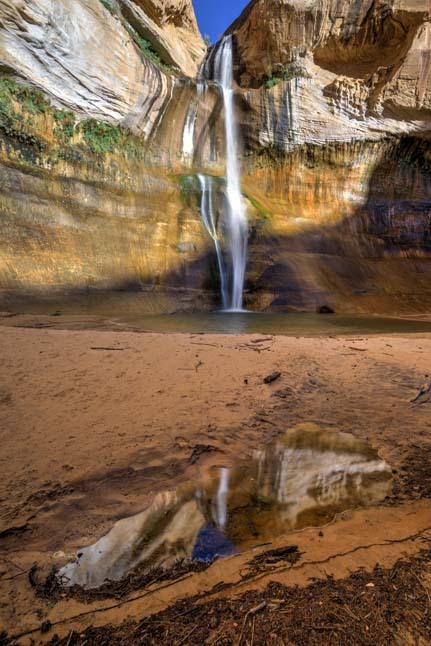 A little wild magic applied later! 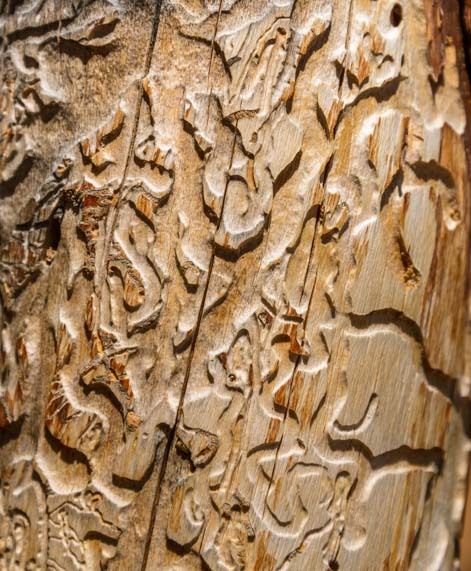 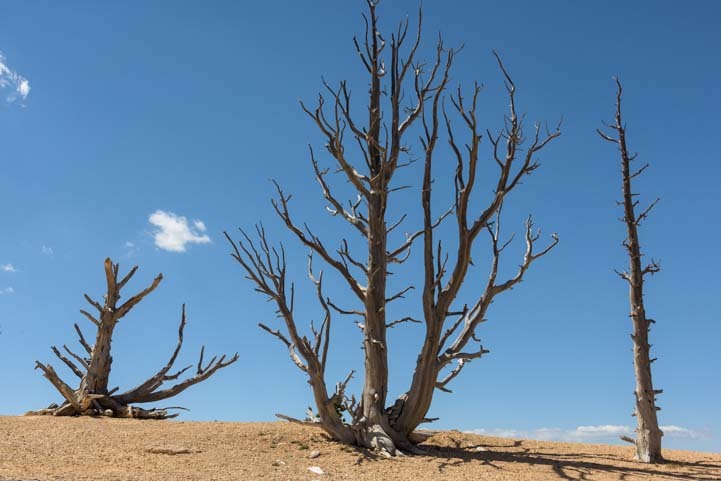 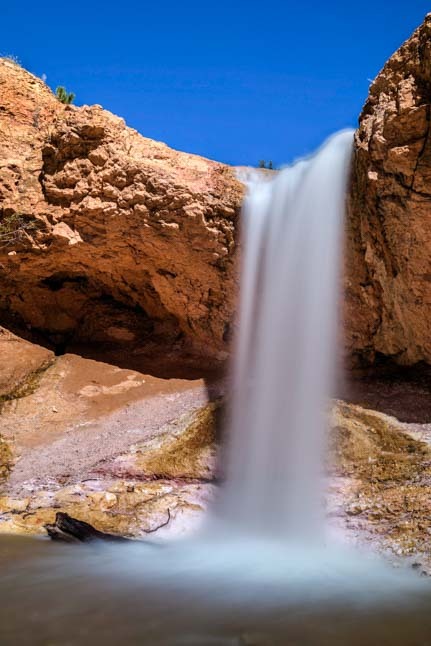 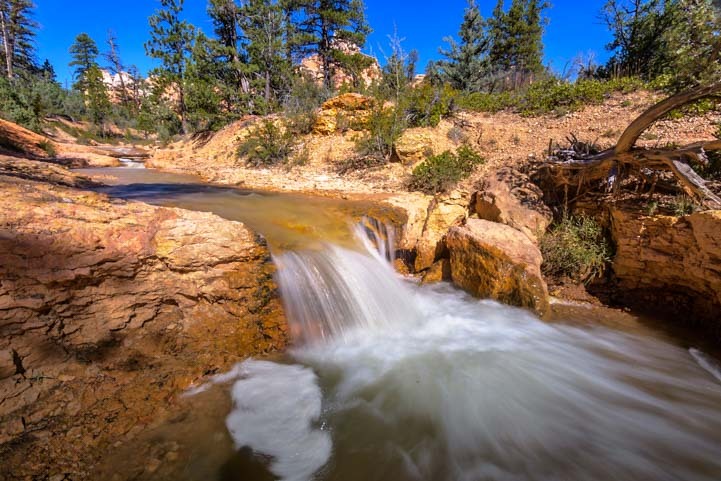 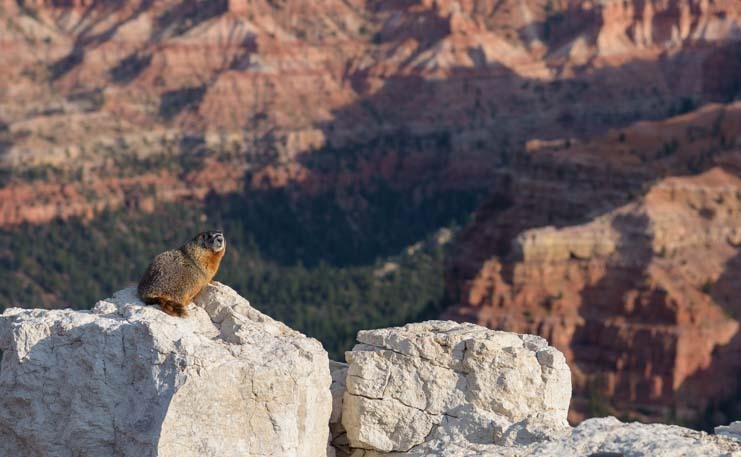 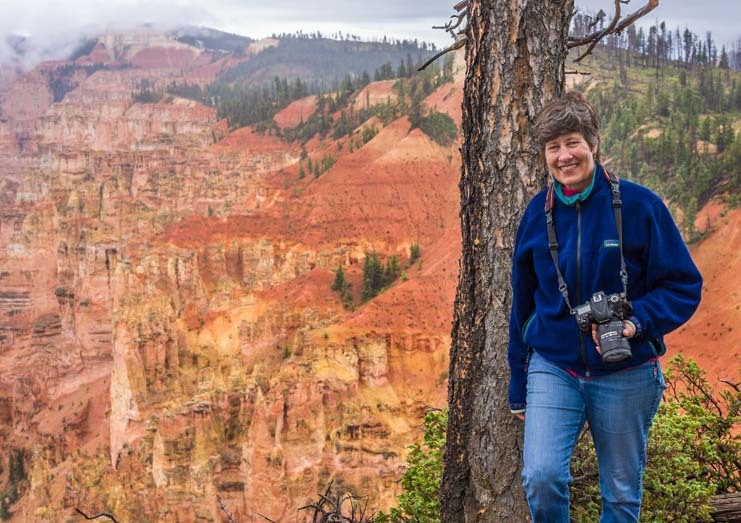 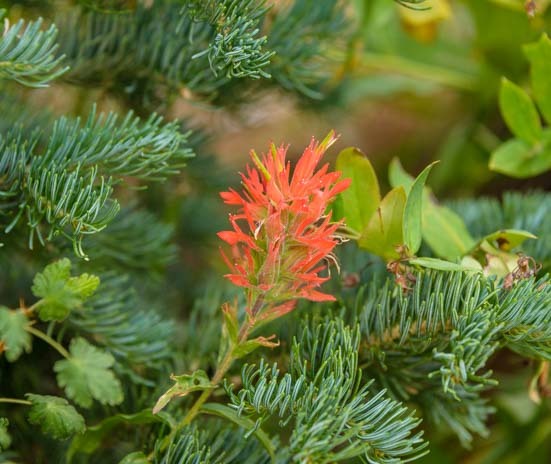 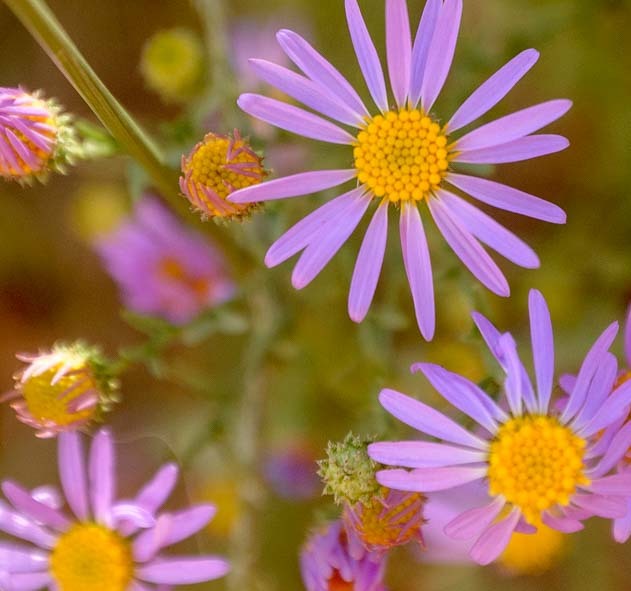 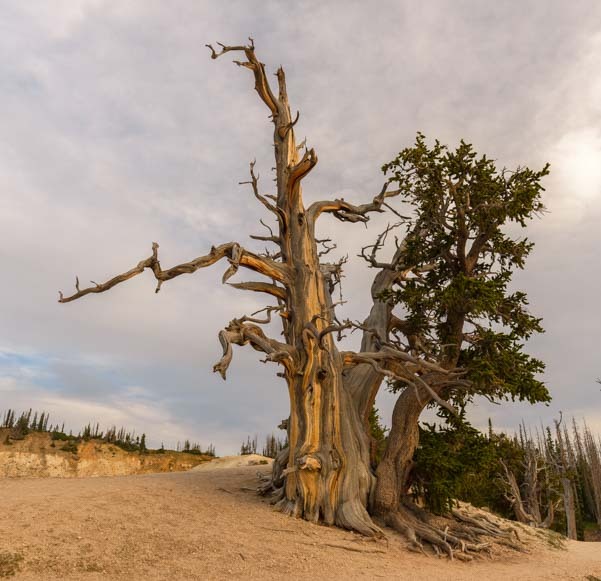 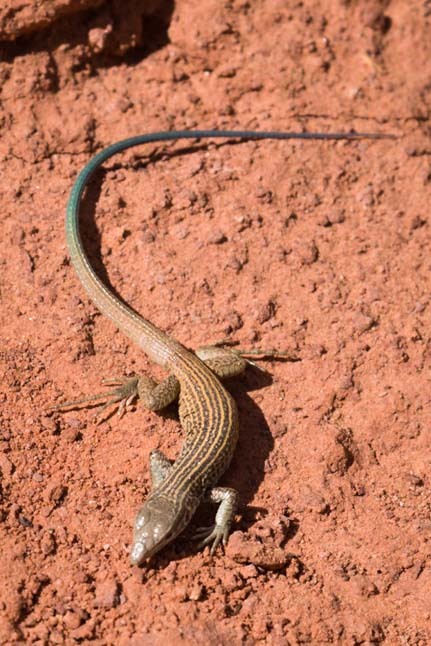 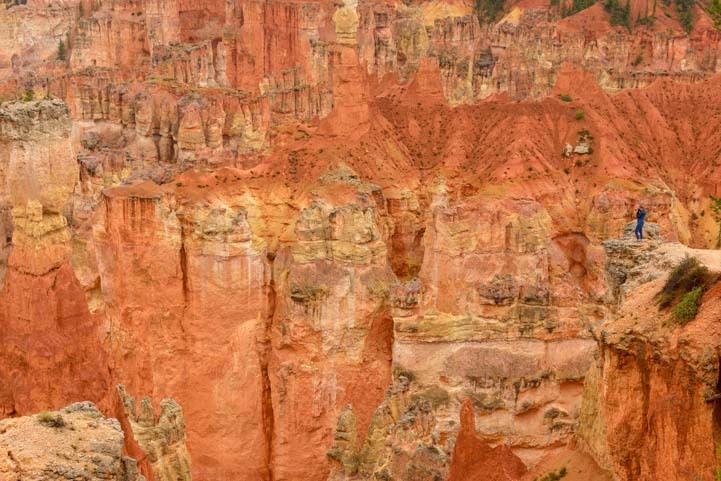 We were loving witnessing “Bryce Canyon Gone Wild,” and we soon saw lots more evidence of this National Park‘s untamed heart as creatures of all kinds wandered in and out of our cameras’ viewfinders. 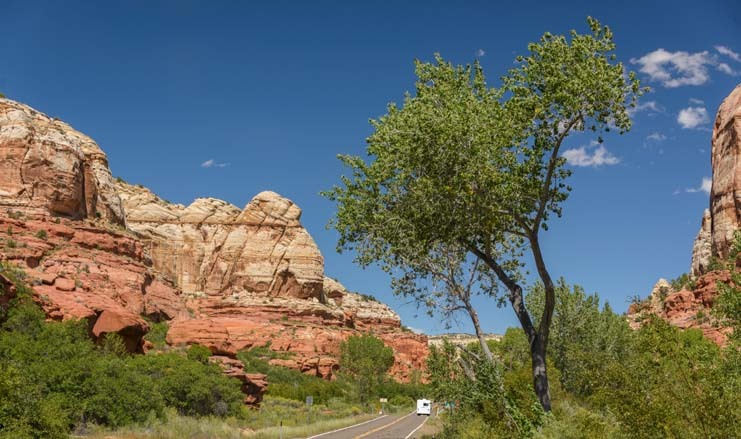 One morning we took our gaze off the stunning red rocks at Sunset Point and noticed a young buck with fuzzy soft antlers peeking over the bushes. 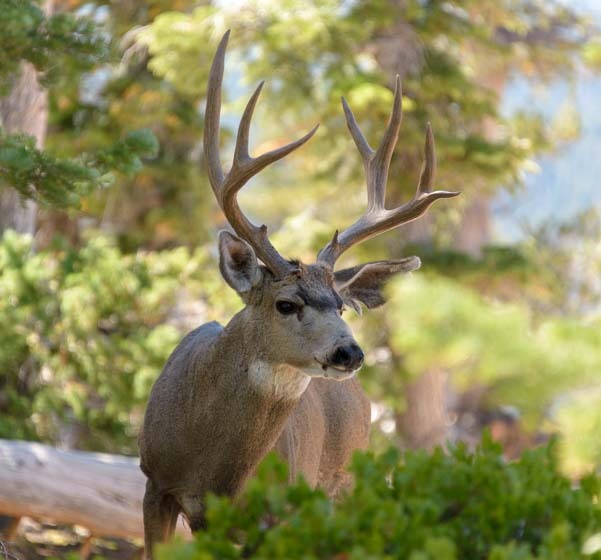 A young buck appears behind the bushes. 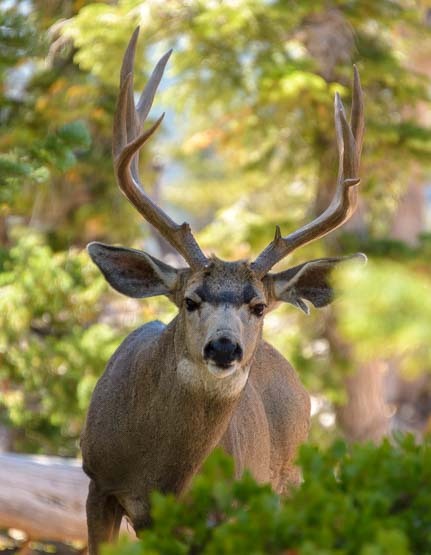 How funny, a week later, to catch a mature buck with a beautiful rack standing in the bushes in almost the exact same pose a few miles away at Rainbow Point! 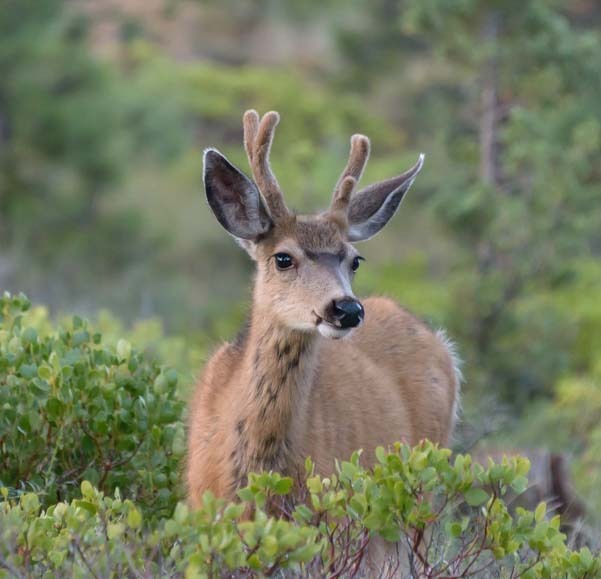 A week later and many miles away another older buck strikes the same pose! 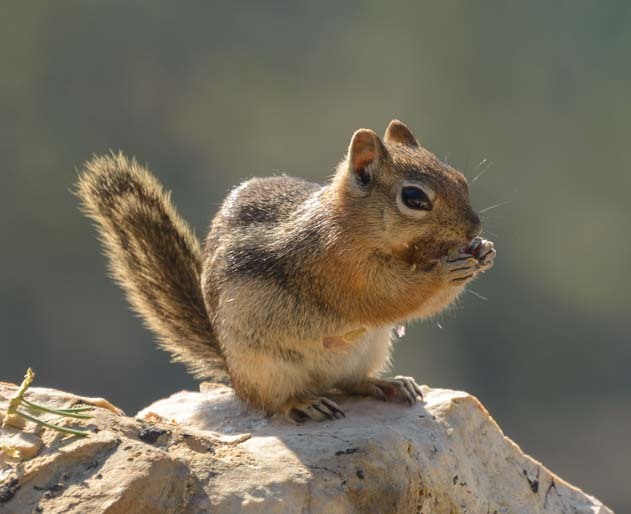 At Piracy Point we noticed a little chipmunk munching away on a pine cone. 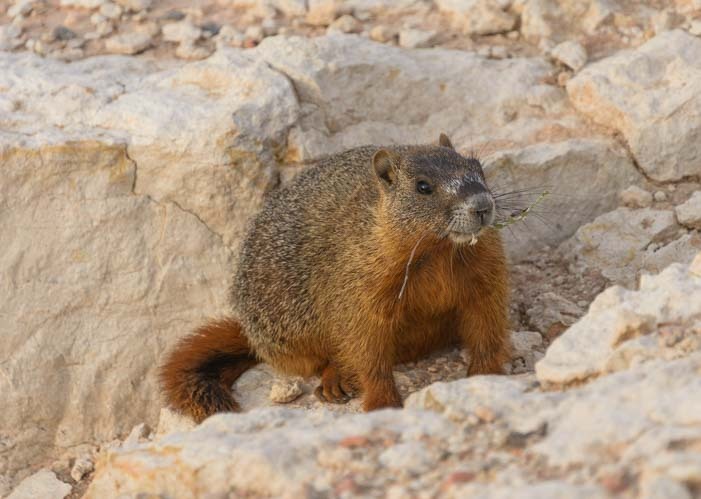 He was making quite a mess and had bits of his breakfast on his whiskers and fur. 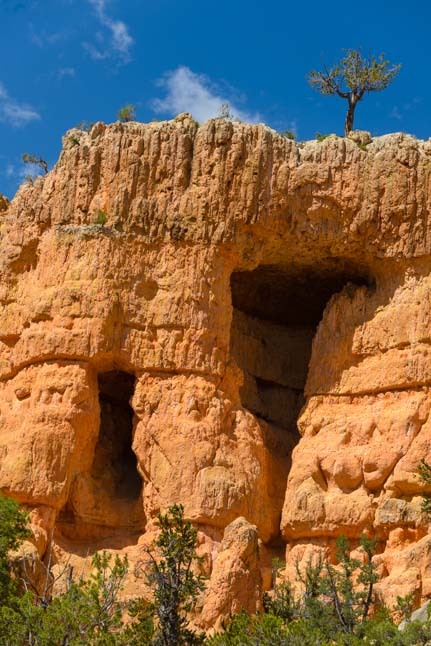 One morning we saw a sweet little face peeking out at us from the front tire of our truck. 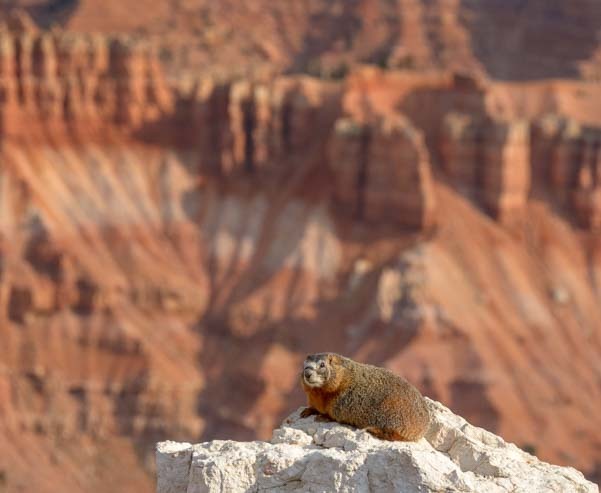 This little guy was the size of a chipmunk, but he was some other kind of critter. 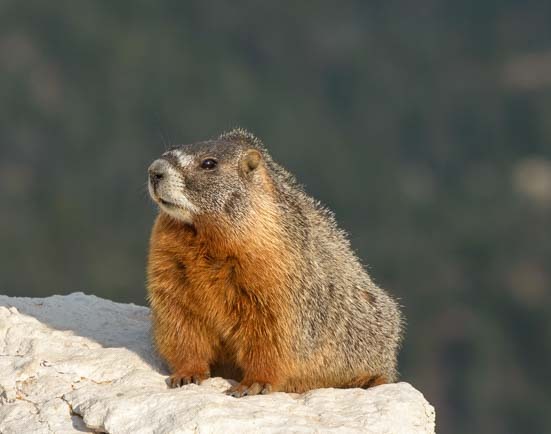 We looked him up online, and discovered he was a little stoat. 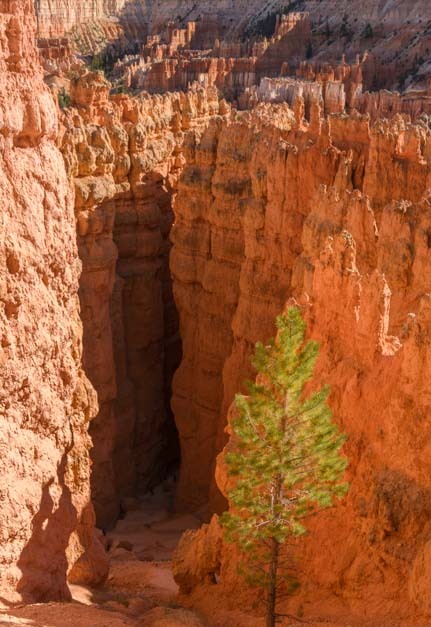 We hoped he’d stick around, but we never saw him again after that morning. 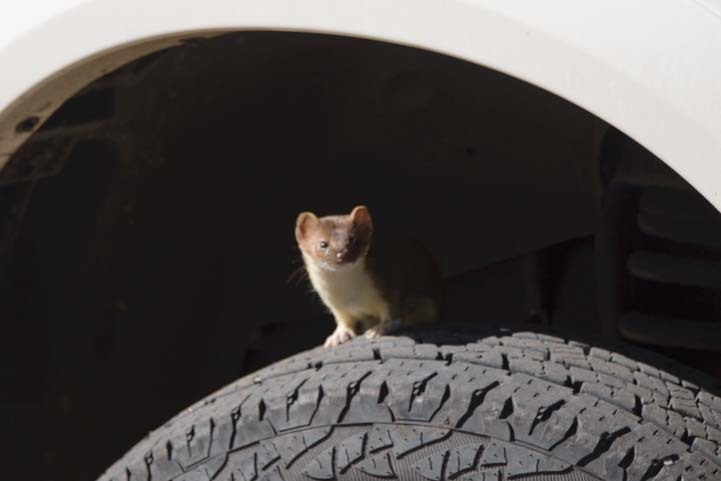 A stoat peeks out at us from the front tire of our truck! 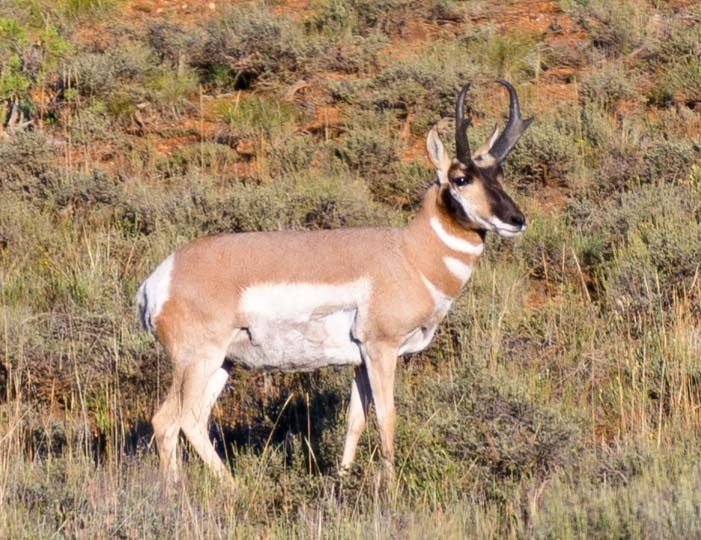 On another afternoon, we spotted a beautiful pronghorn antelope in the grass. 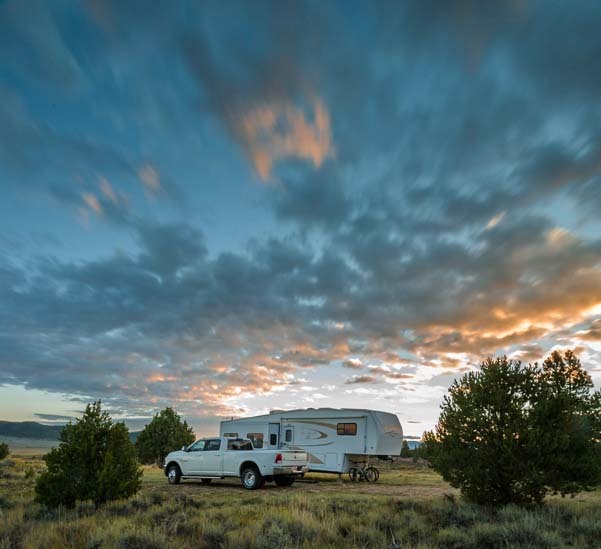 A pronghorn antelope pauses in the grass. 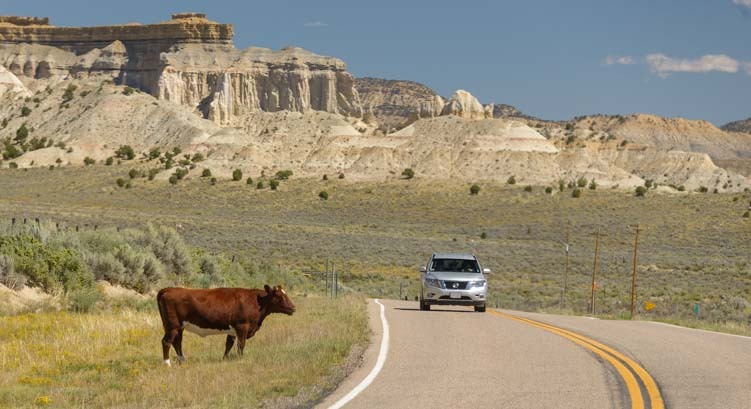 He was part of a small group of pronghorns, and a few minutes later two more ran across the road. 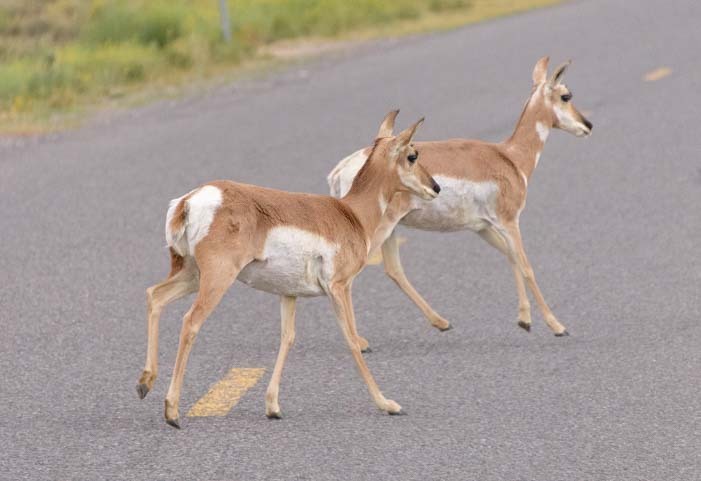 A pair of pronghorn dash across the road. 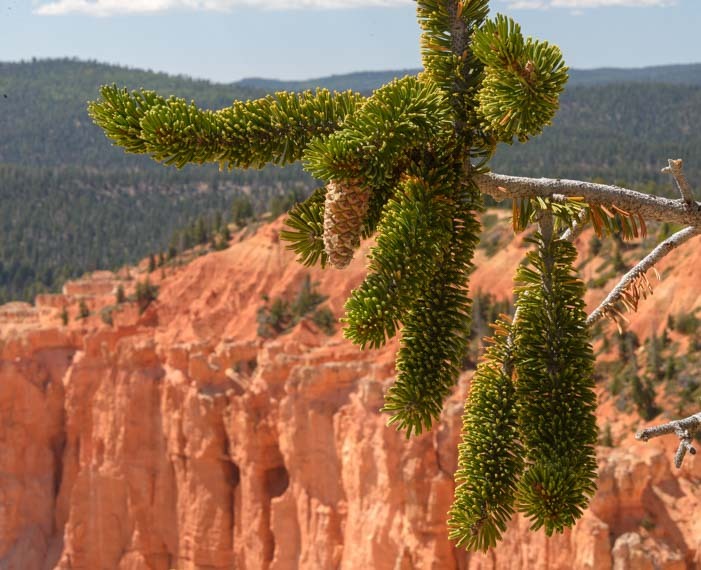 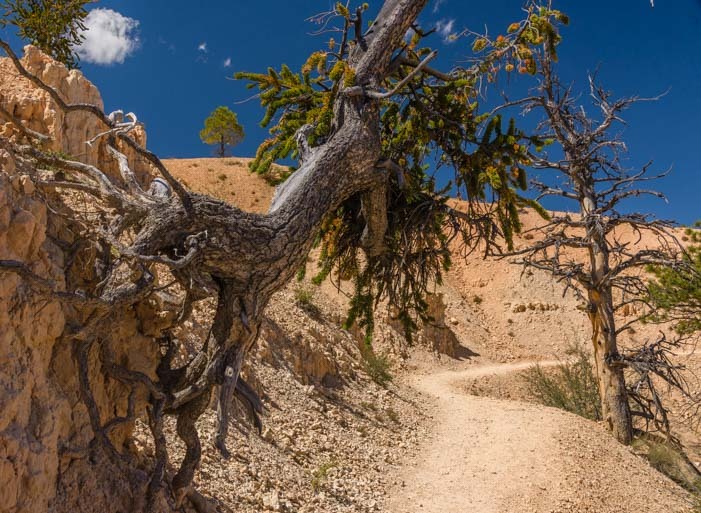 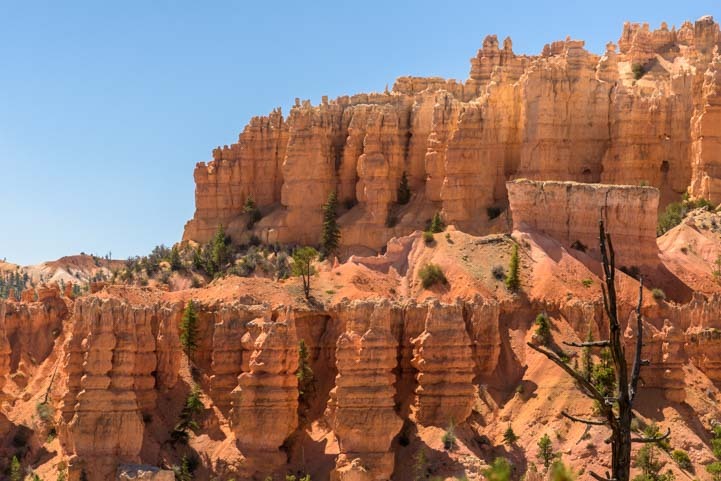 As happens to us on every visit to Bryce Canyon National Park, we were utterly bewitched by everything we saw, from the turbulent weather to the animals that call the place home. 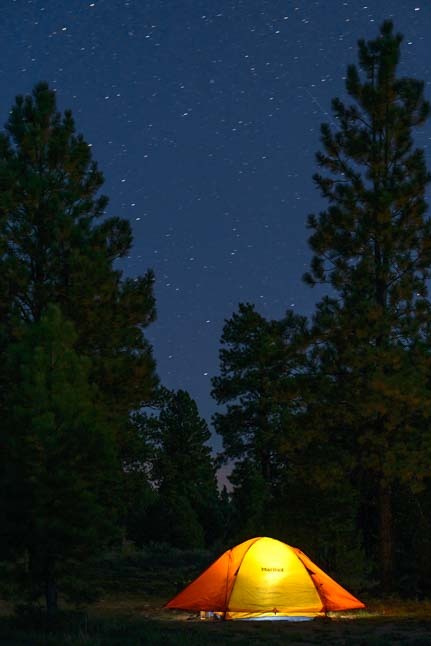 It is pure magic! 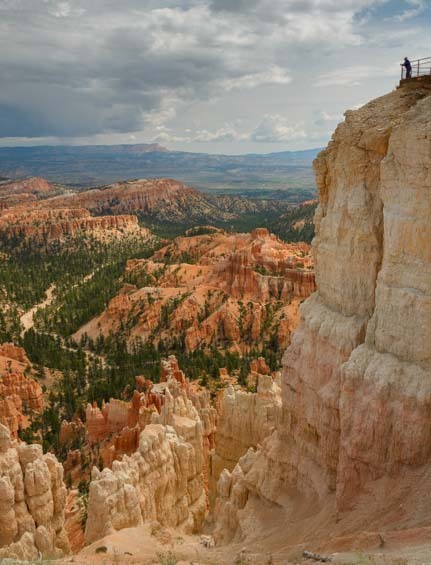 Bryce Canyon National Park – Inspiration Point – OMG! 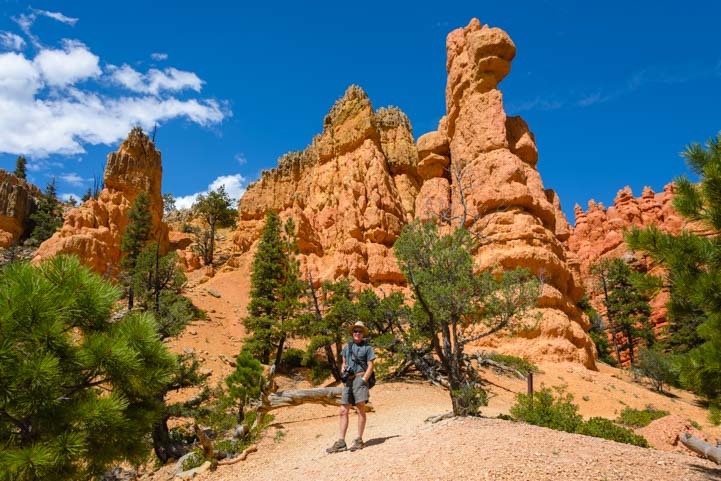 August 2016 – We have been fortunate to visit Bryce Canyon National Park three times in the past, and we often refer to it as our favorite of America’s National Parks. 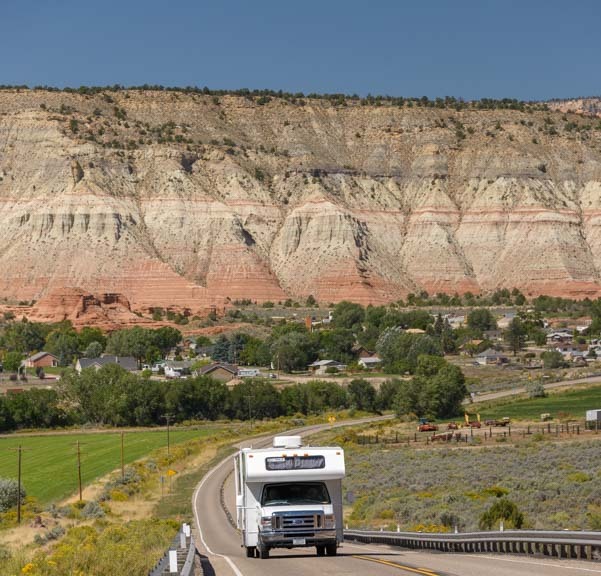 But this fourth visit with our RV was sensational. 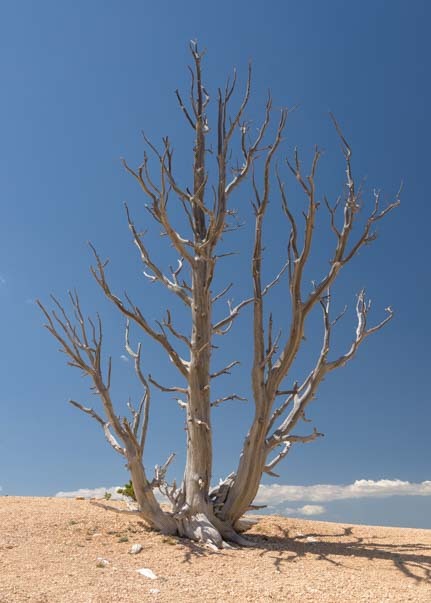 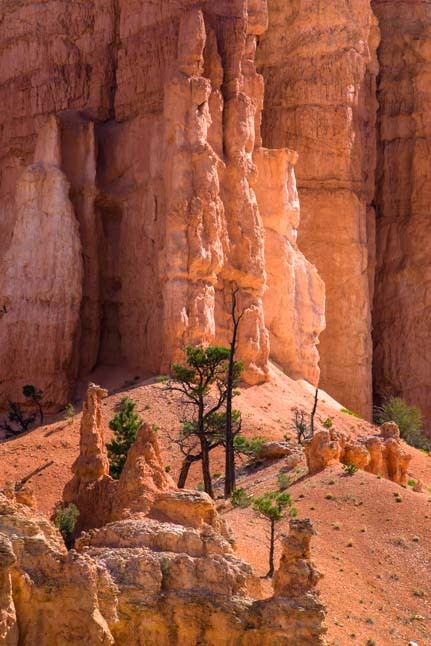 Inspiration Point – Bryce Canyon National Park in Utah. 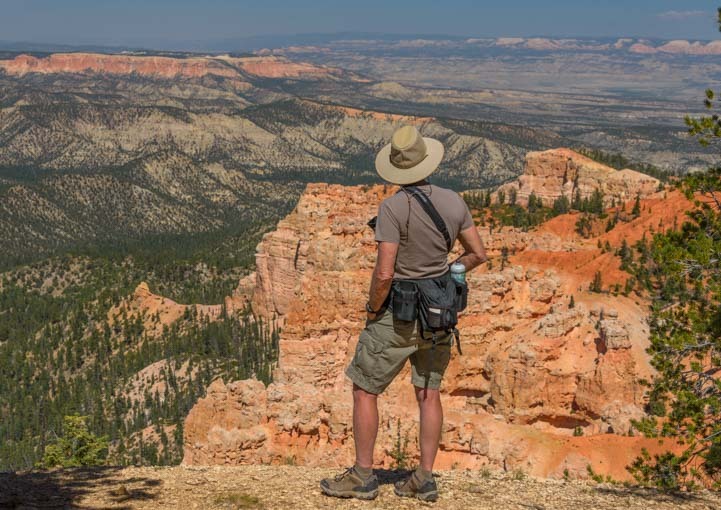 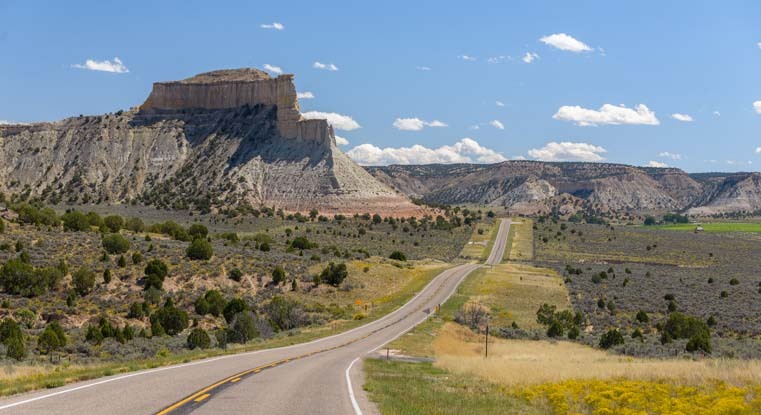 We overheard a ranger telling a newcomer that the best way to see Bryce Canyon National Park is to drive the 20 miles or so straight to the very far south end of the Park at Rainbow Point and then to turn around and drive back slowly, stopping at all the overlooks on the way back. 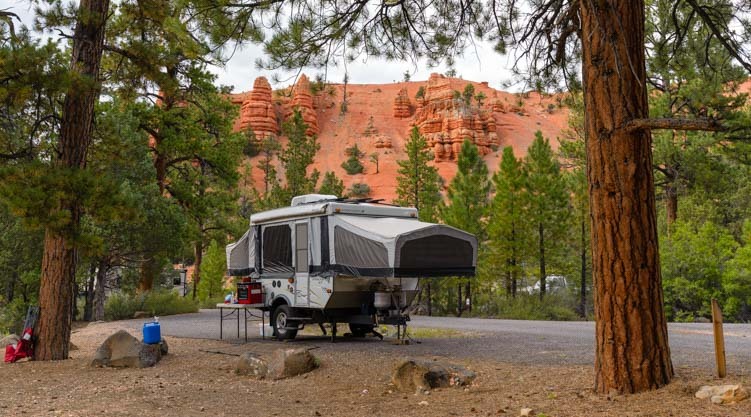 If you are into saving the best for last, then this strategy is fine. 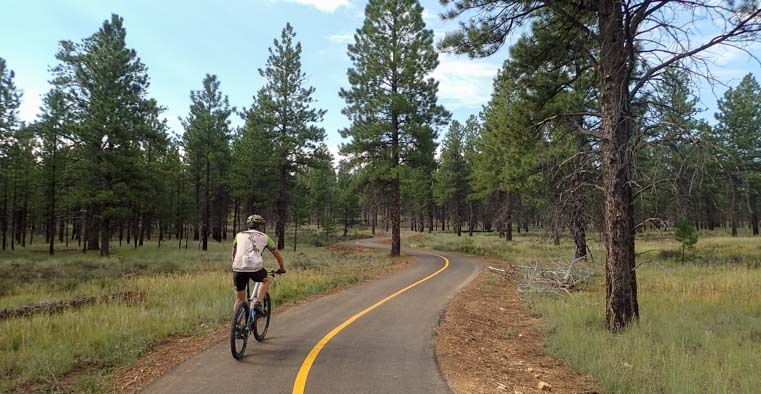 It’s also great for easing traffic congestion at the main part of the park. 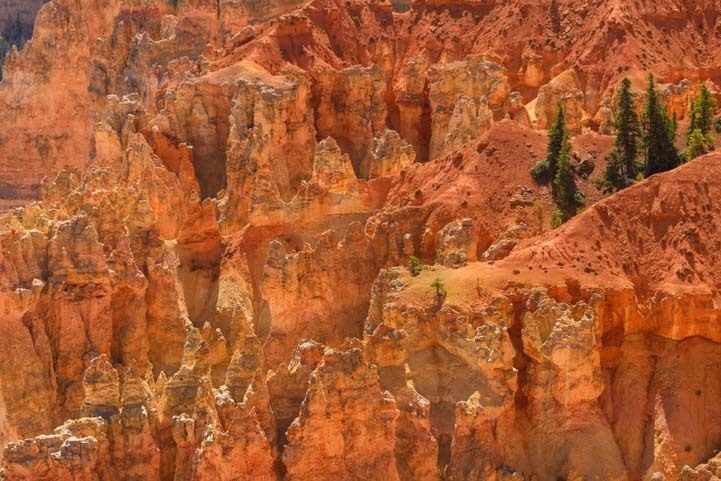 Orange, pink and white spires seen from Inspiration Point. 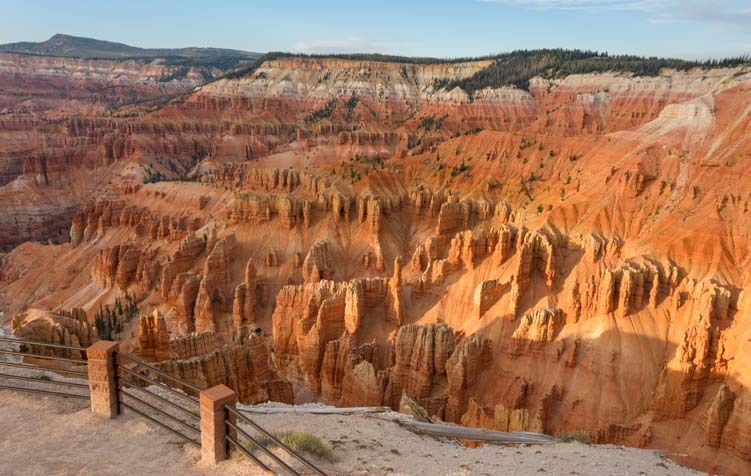 Our suggestion is to drive (or take the Park Shuttle) directly to the Inspiration Point parking lot, walk straight out to the rim, and feel the breath get sucked right out of you as you gape in awe at the wondrous landscape laid out in front of you. 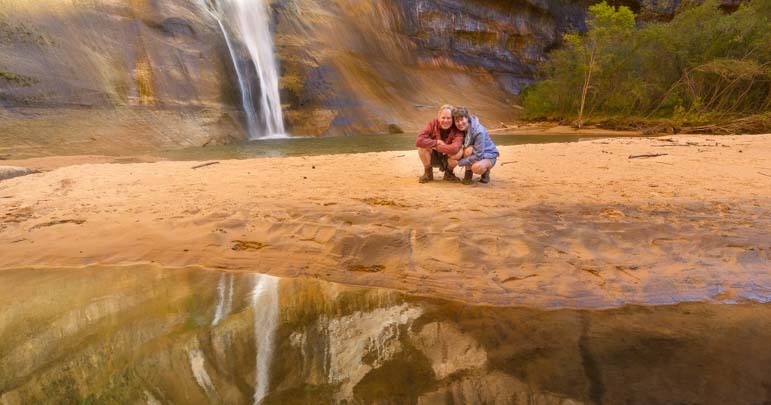 Then, just like every other one of the thousands of tourists alongside you, you’ve gotta get a selfie. 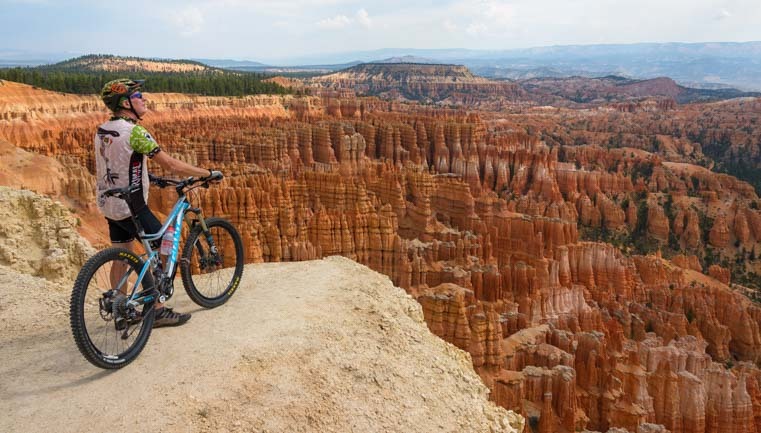 Of all the backdrops for self-portrait, this has to be one of the best. 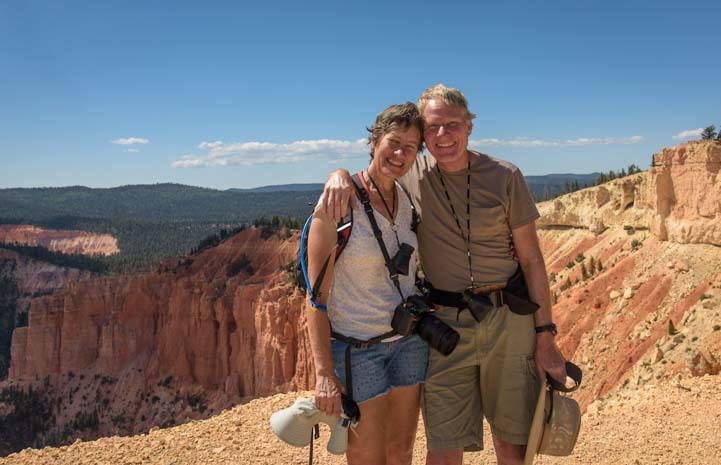 Happy campers at Bryce Canyon. 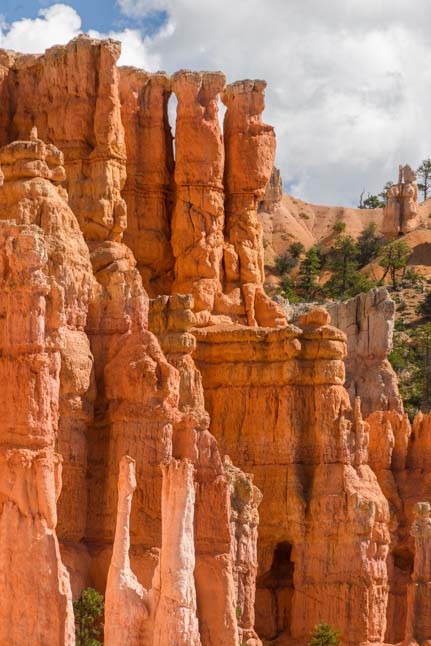 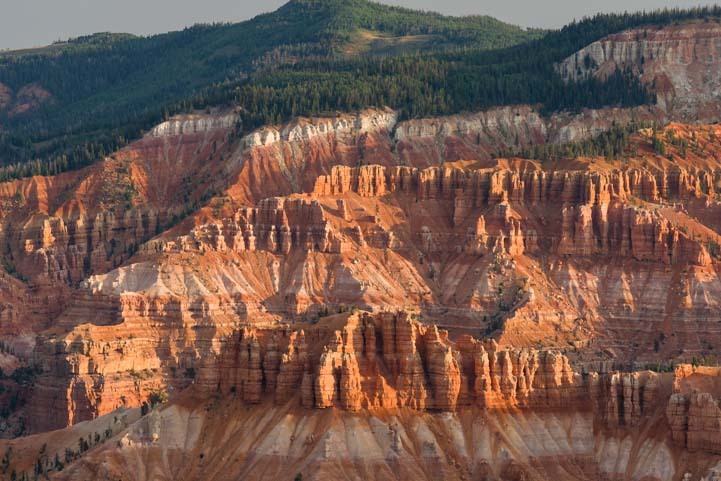 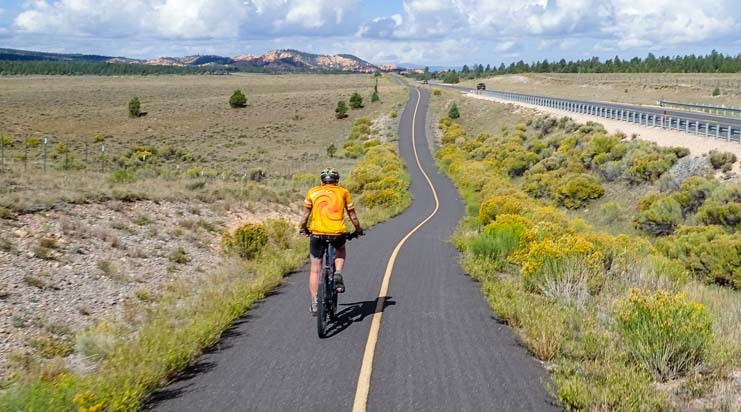 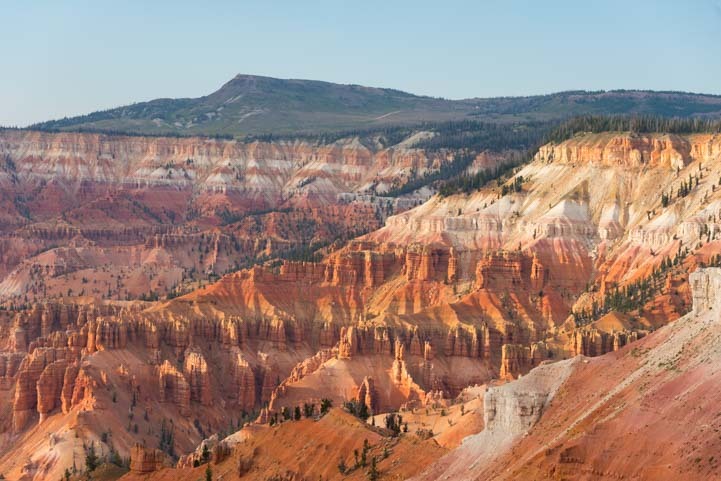 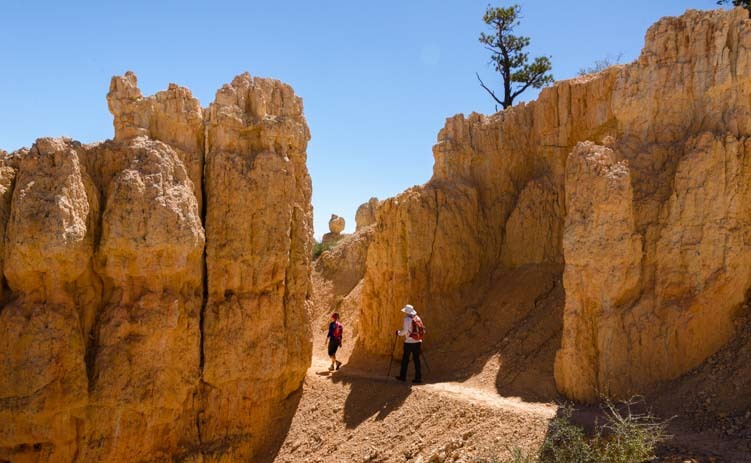 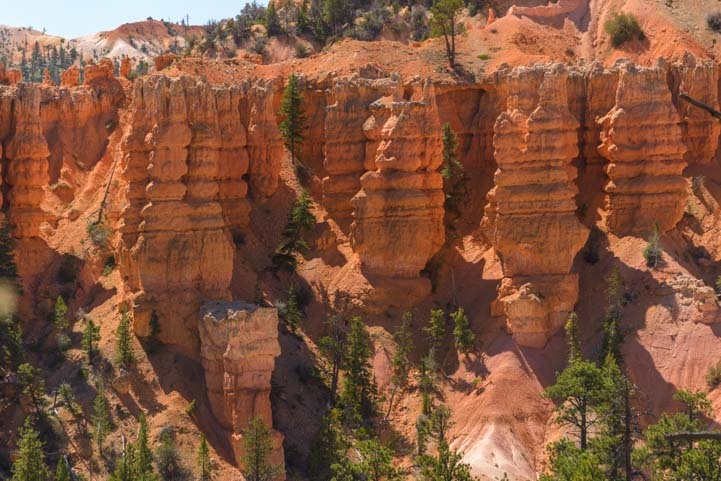 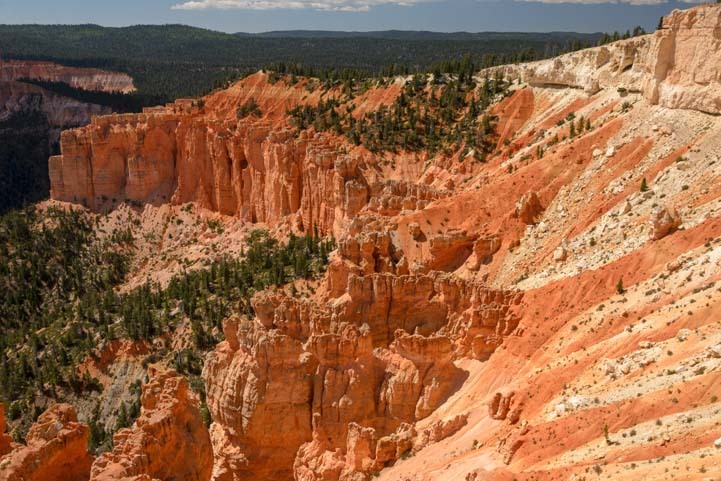 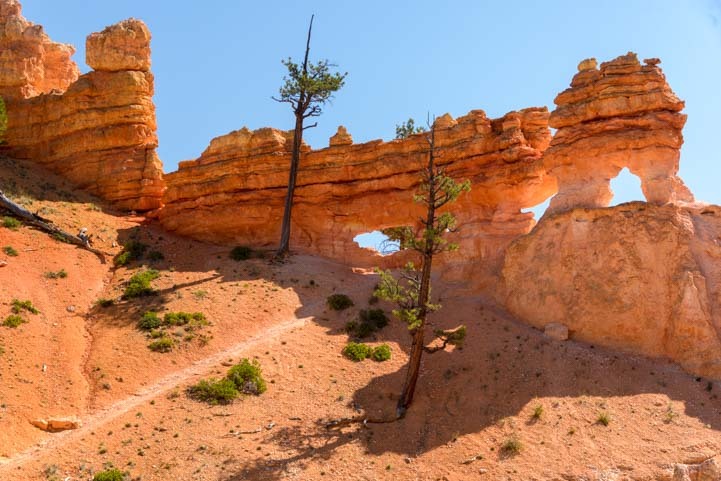 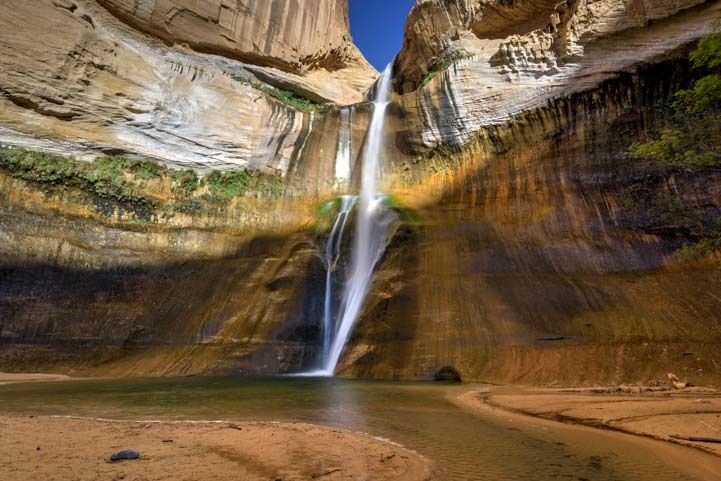 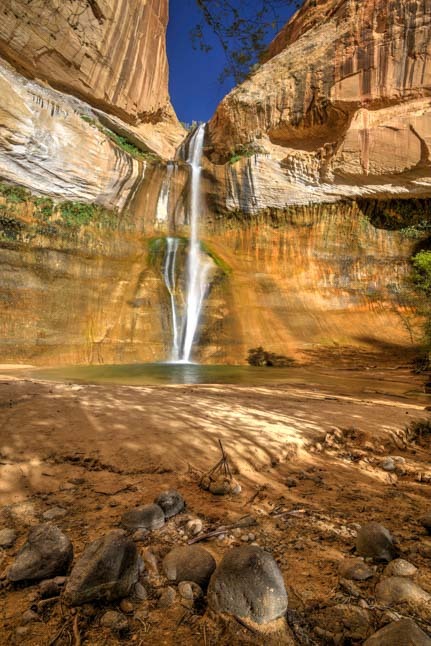 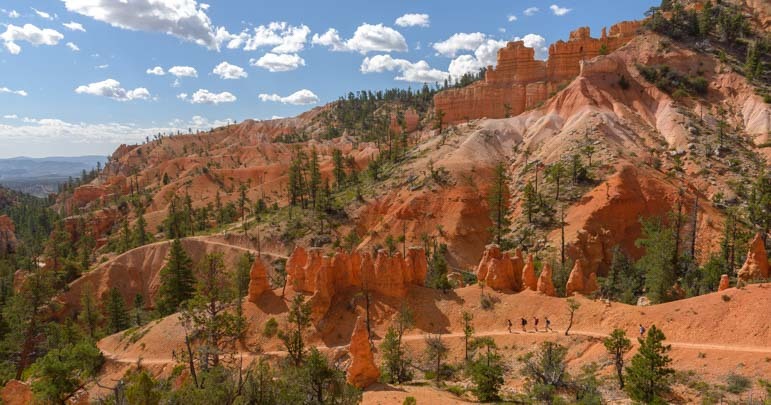 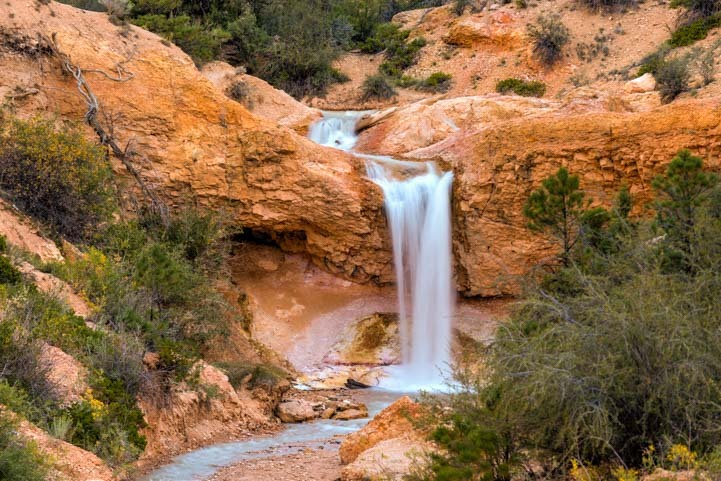 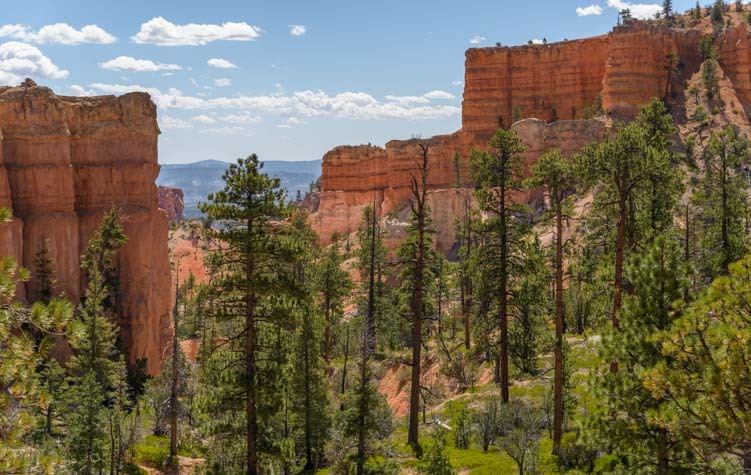 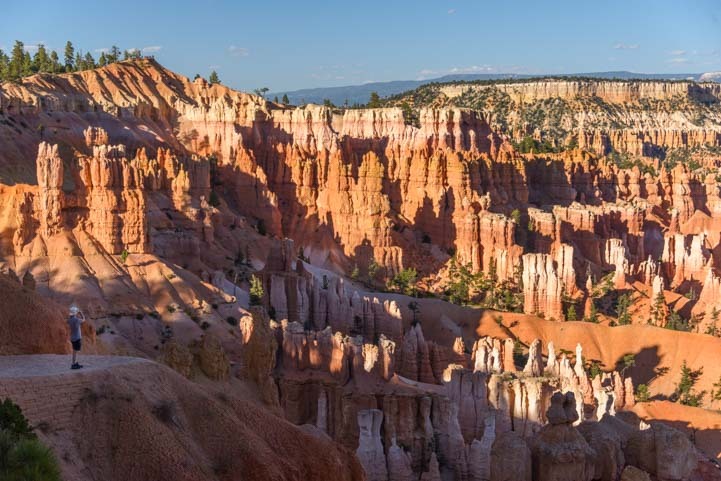 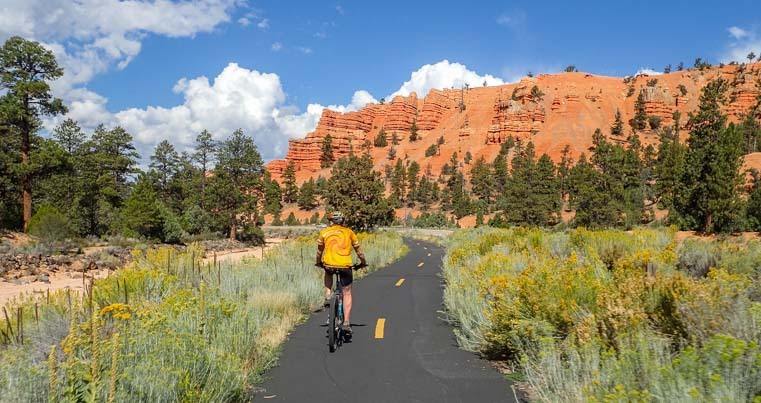 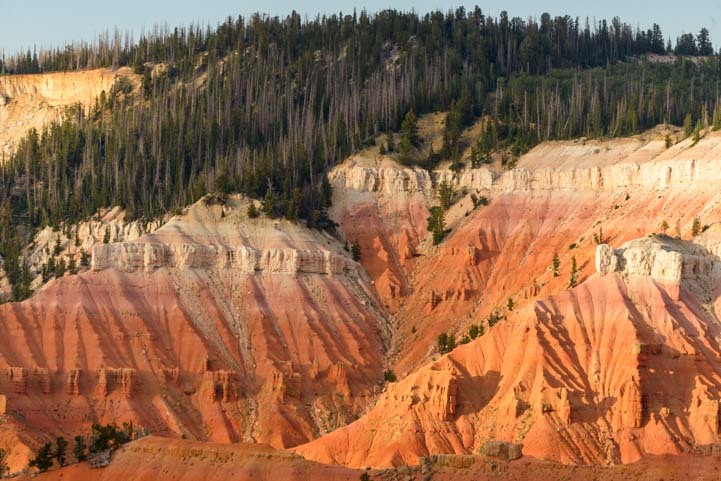 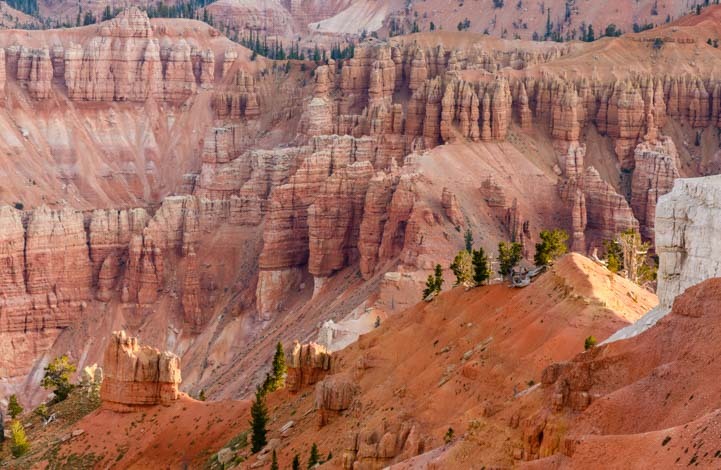 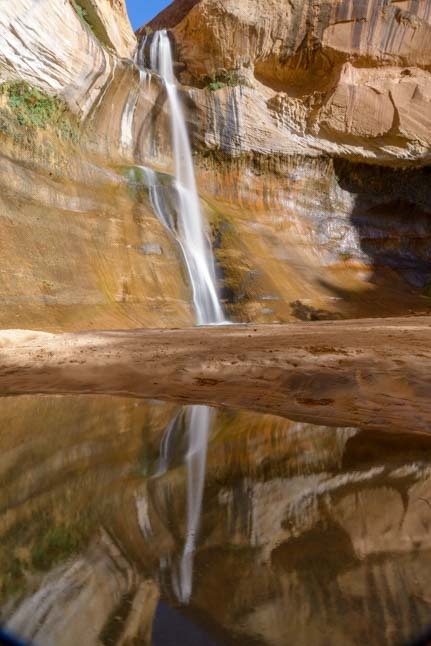 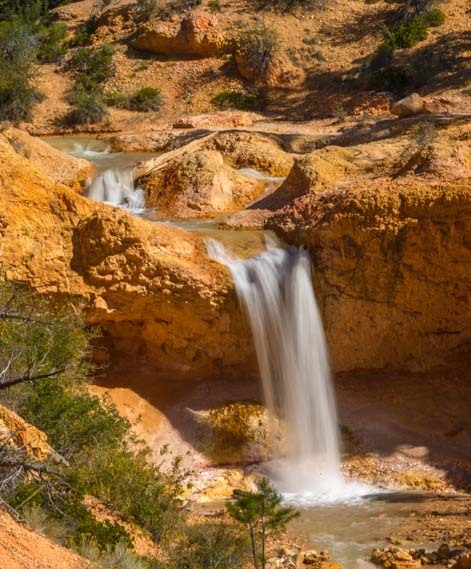 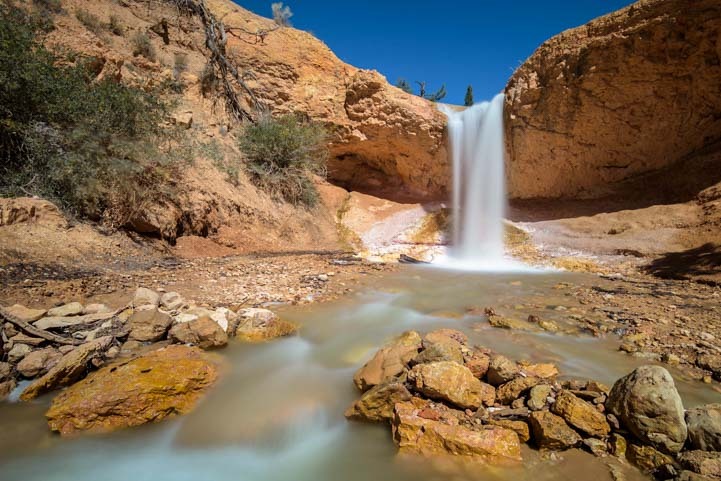 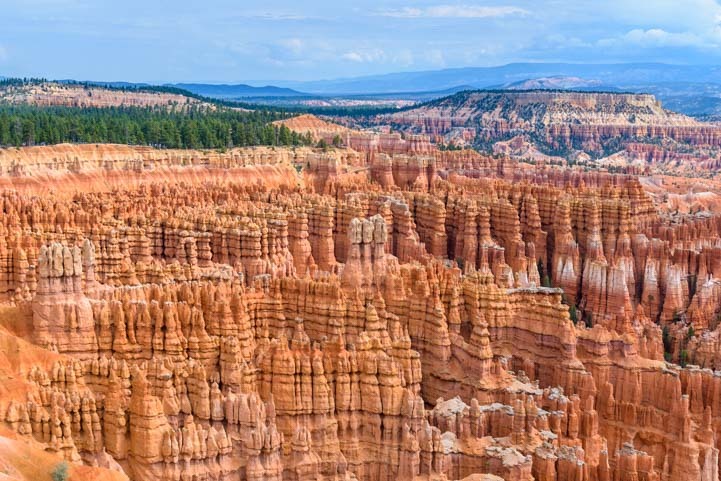 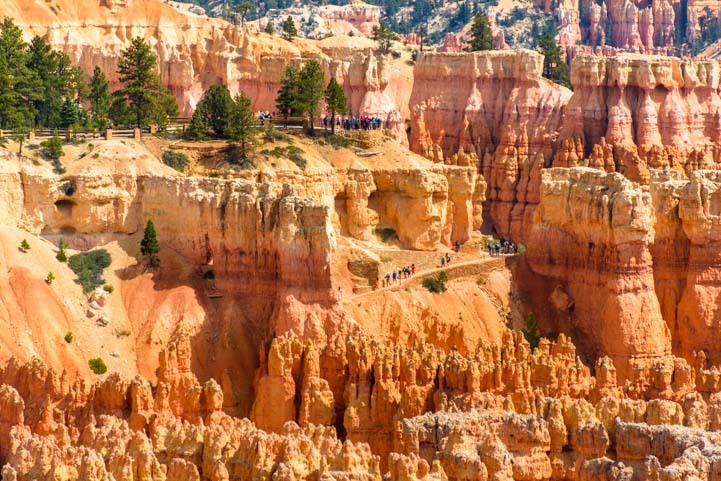 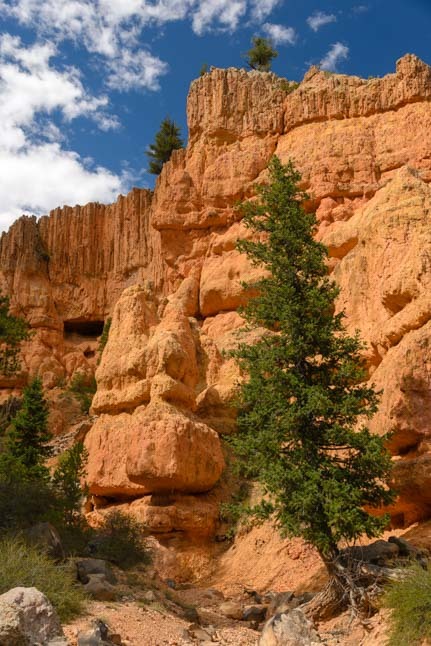 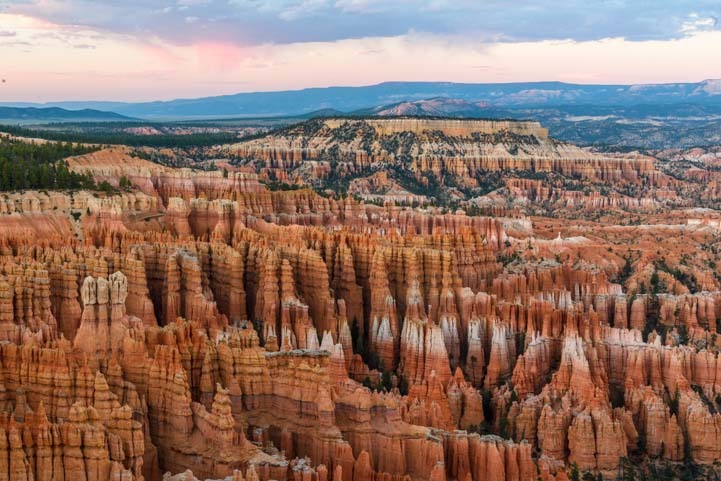 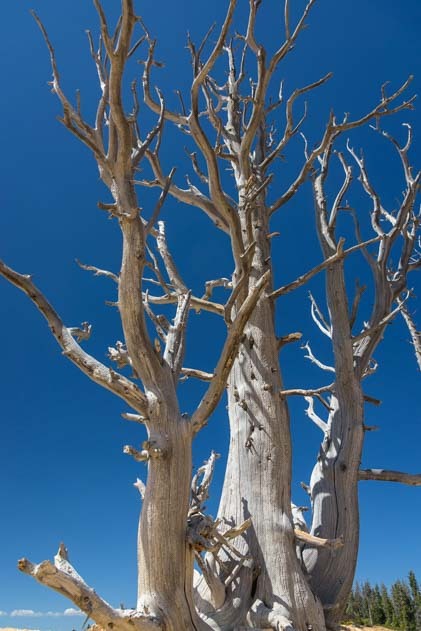 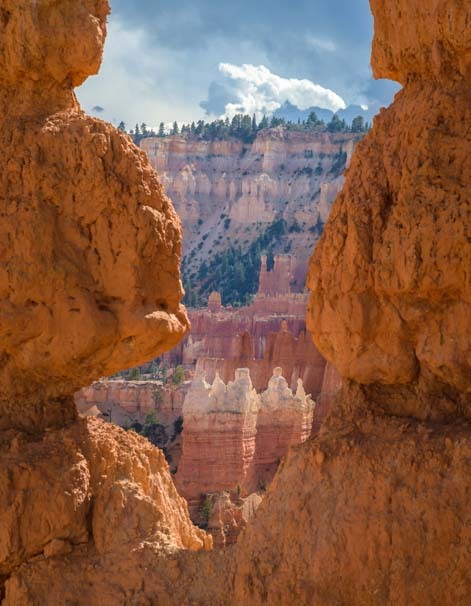 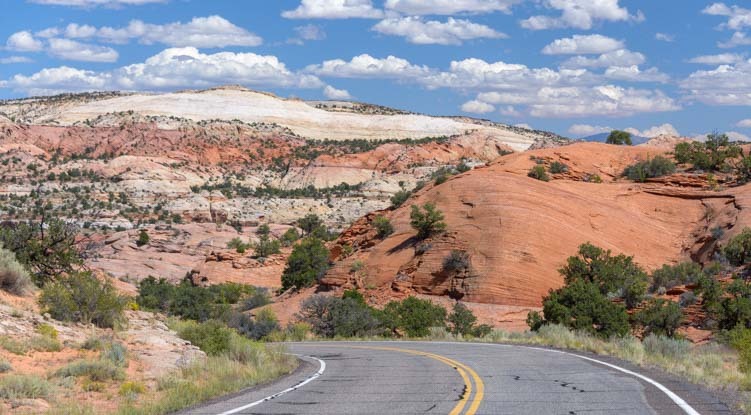 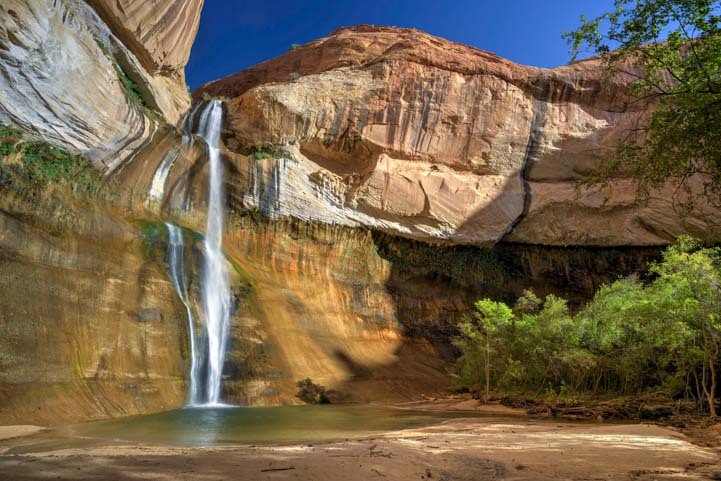 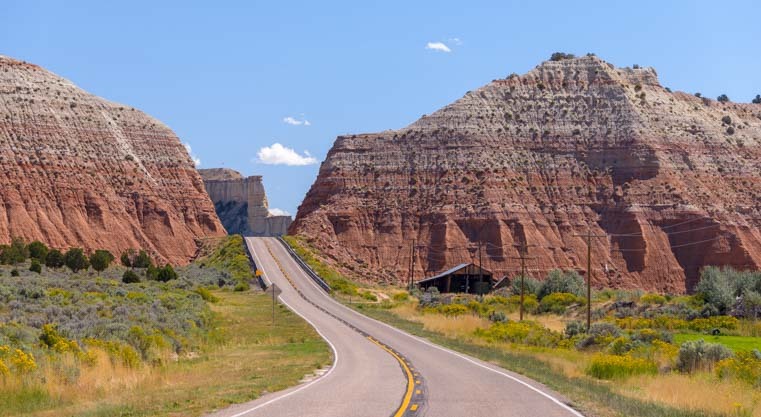 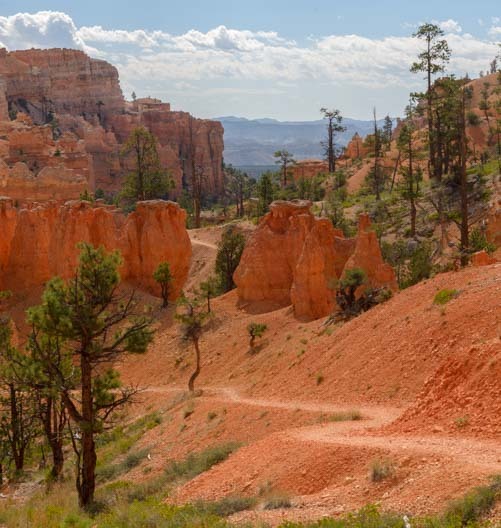 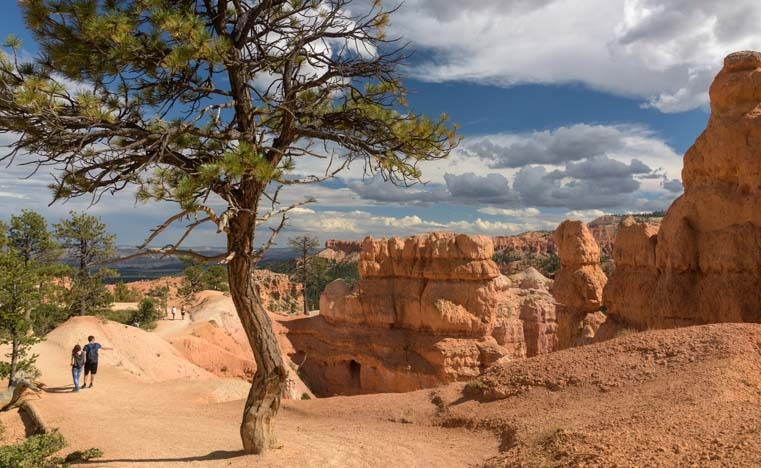 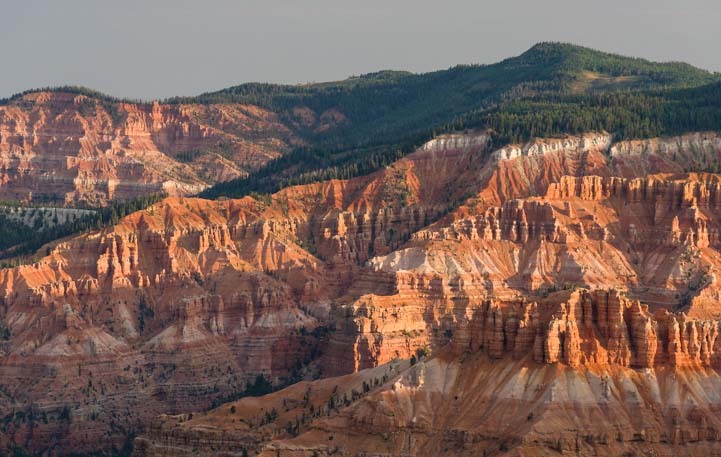 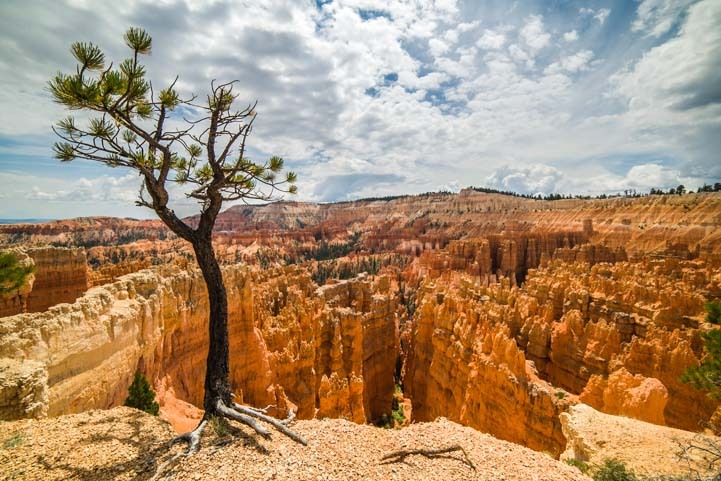 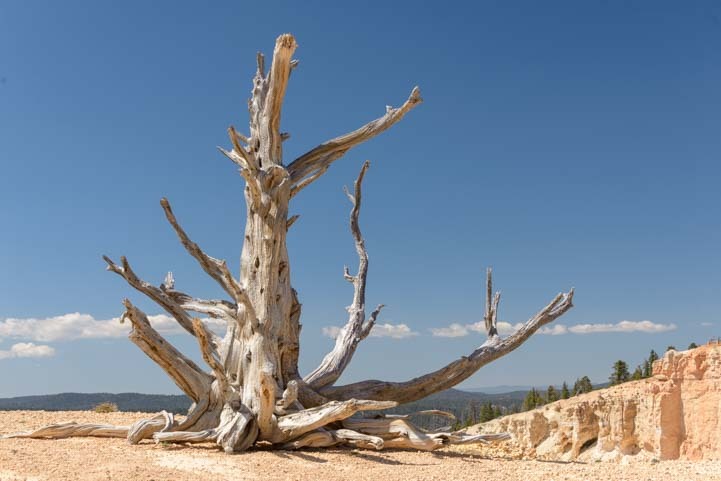 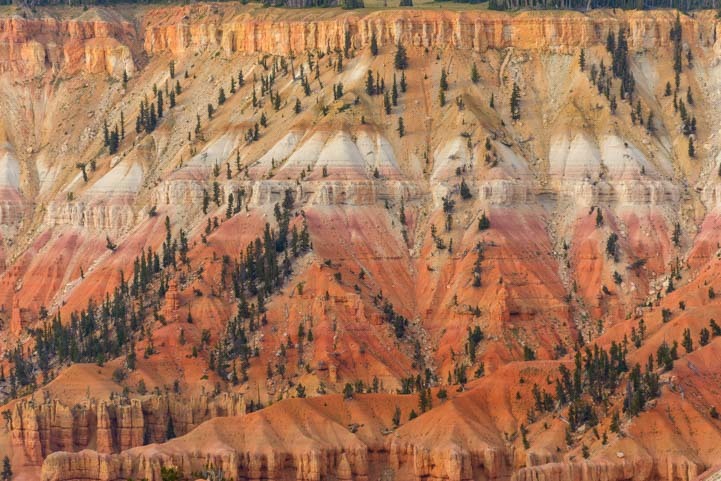 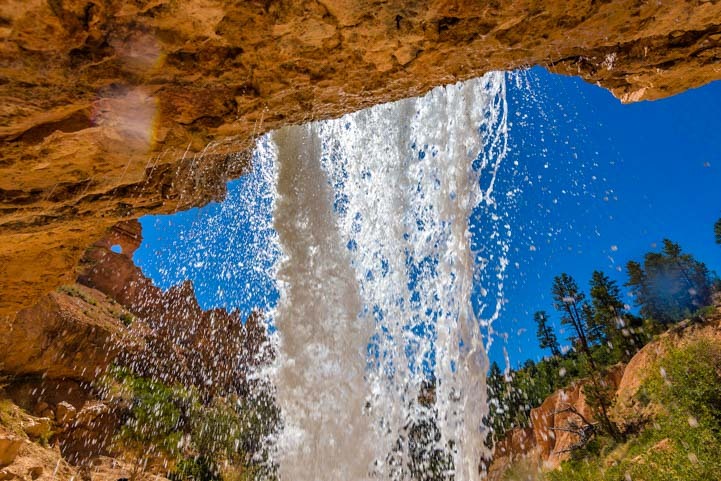 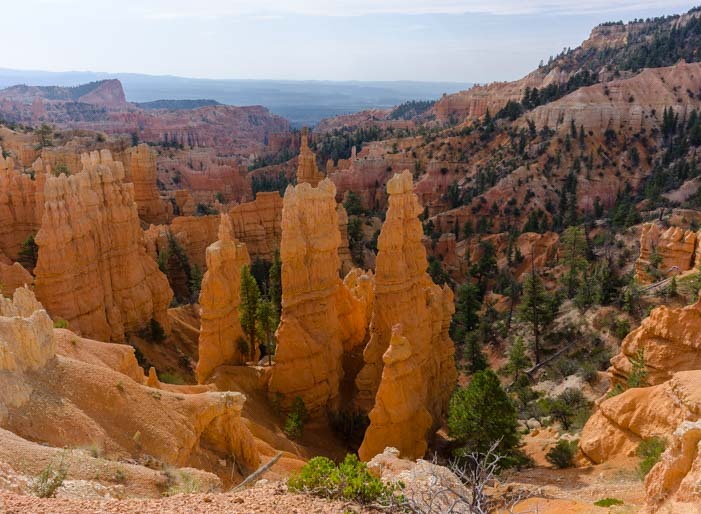 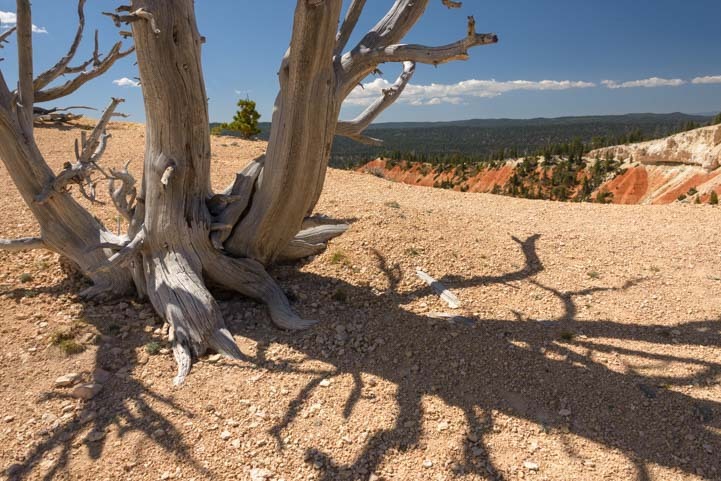 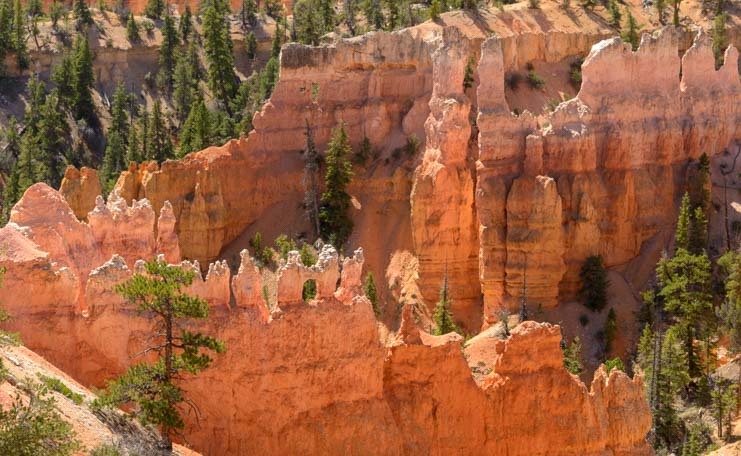 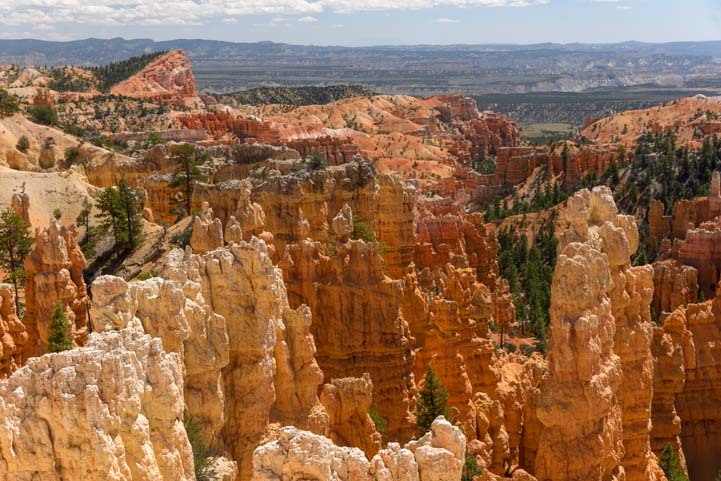 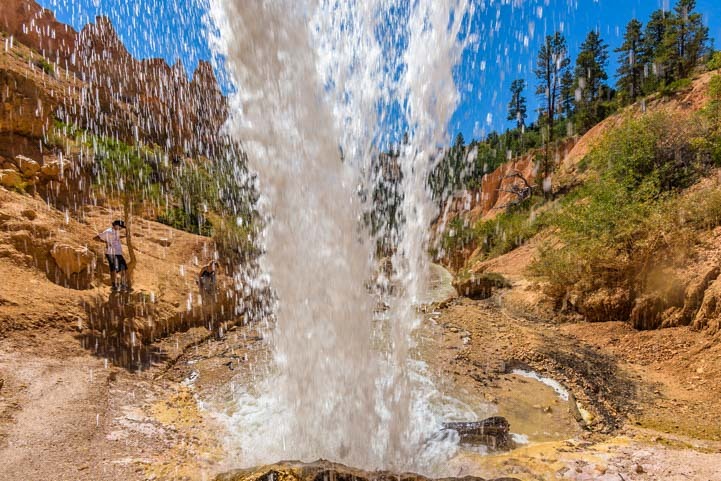 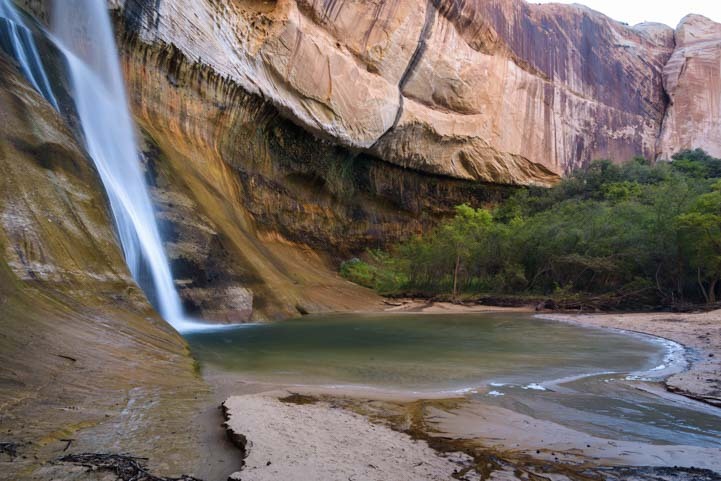 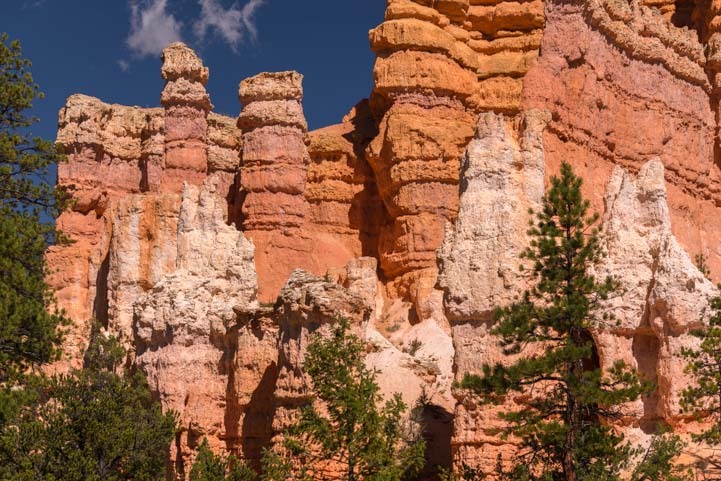 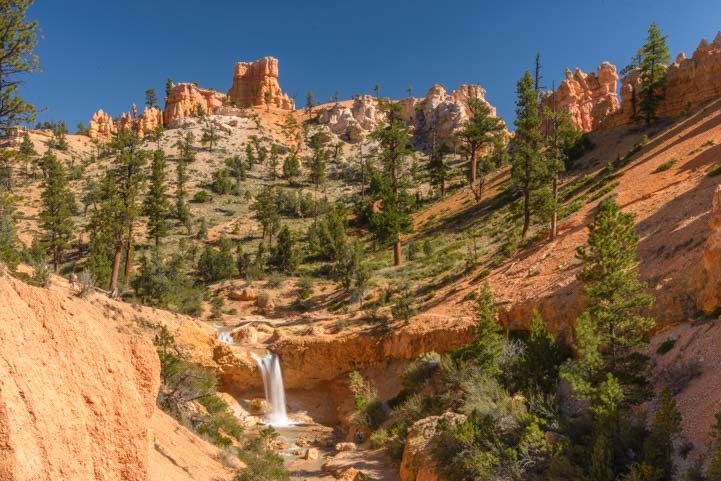 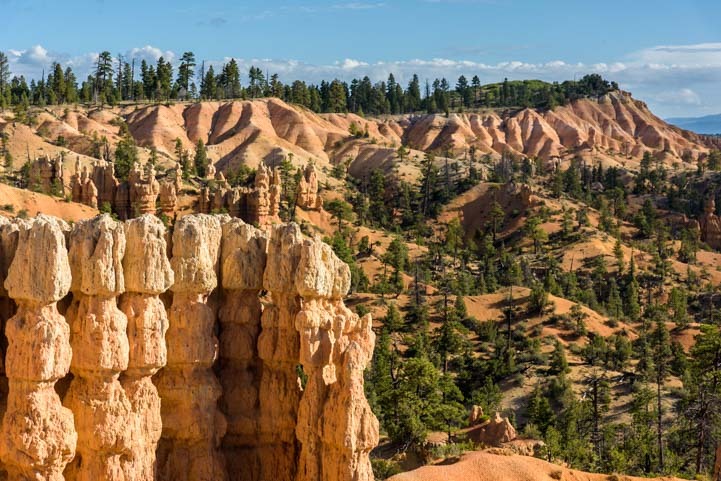 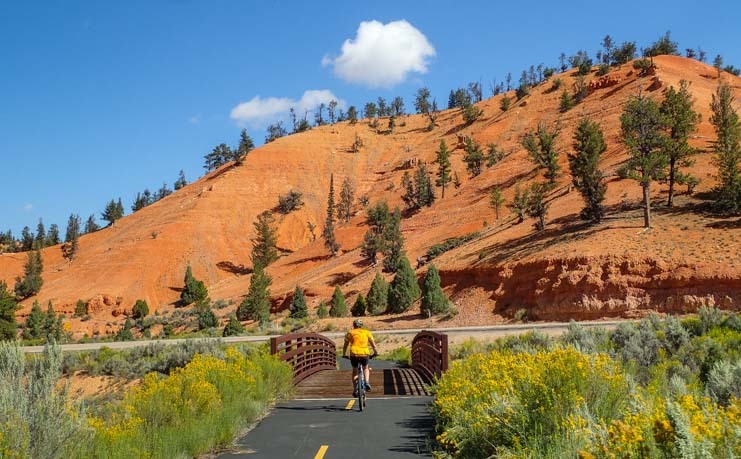 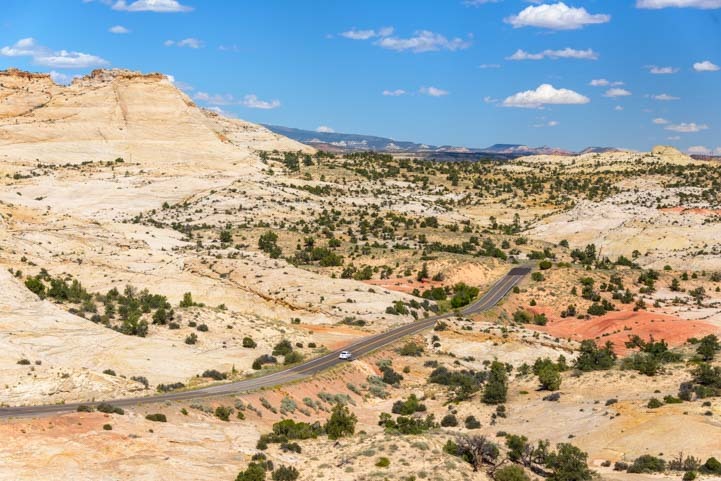 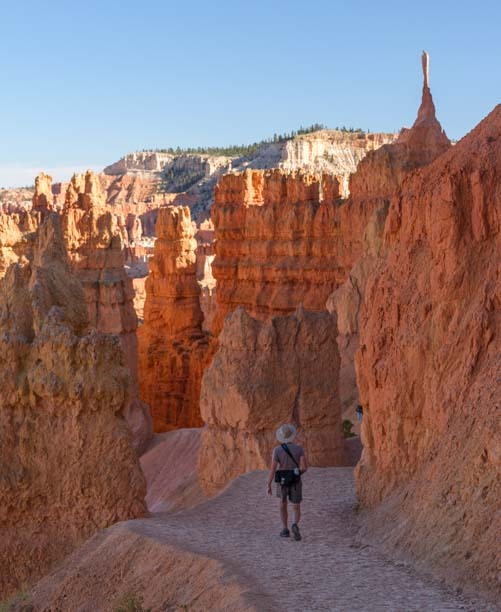 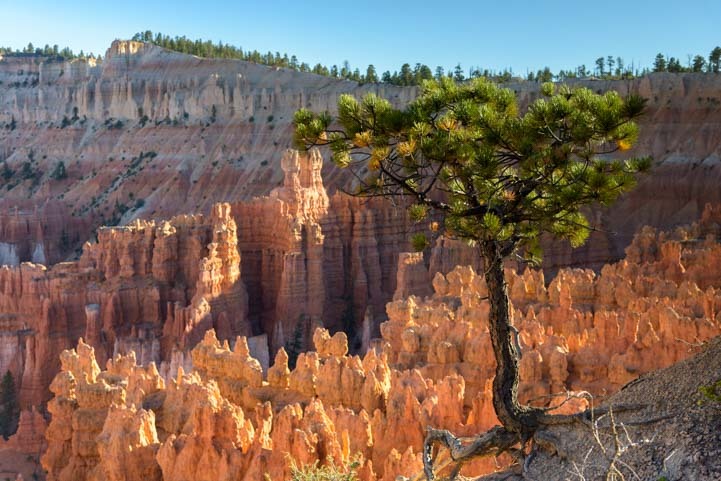 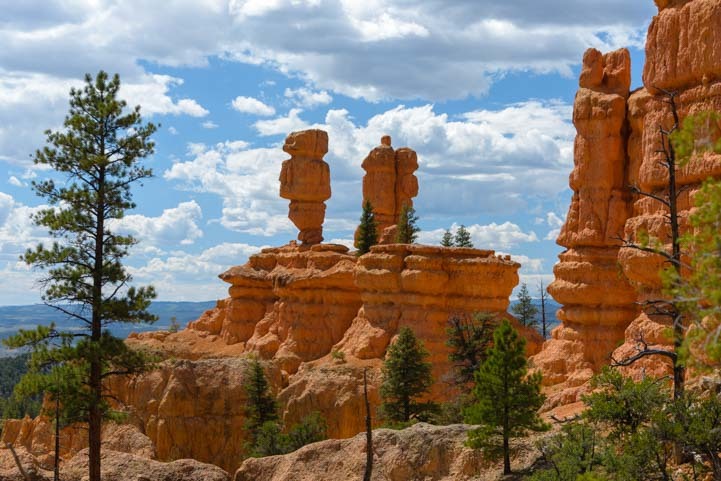 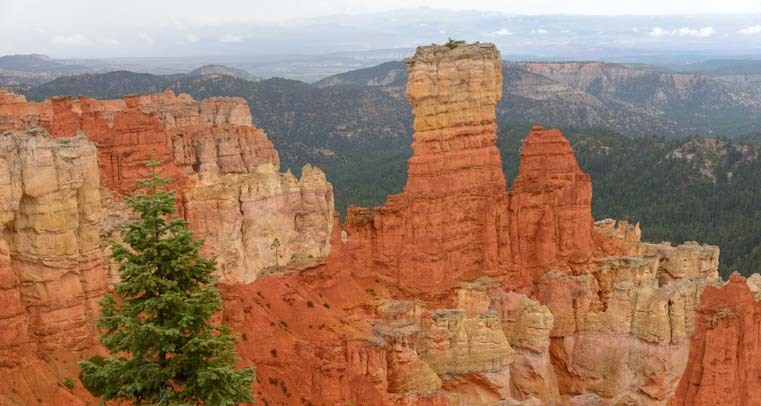 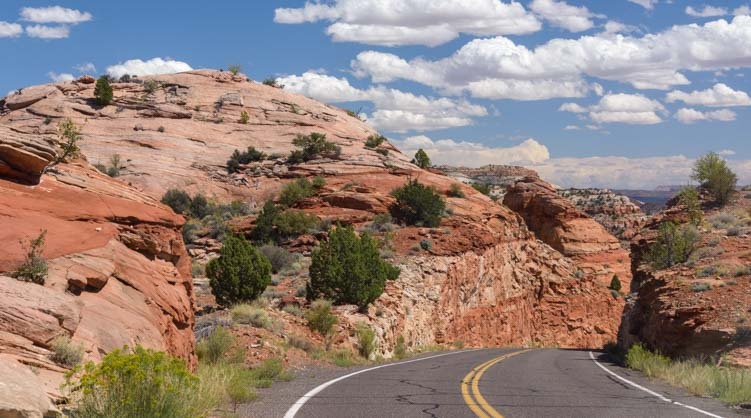 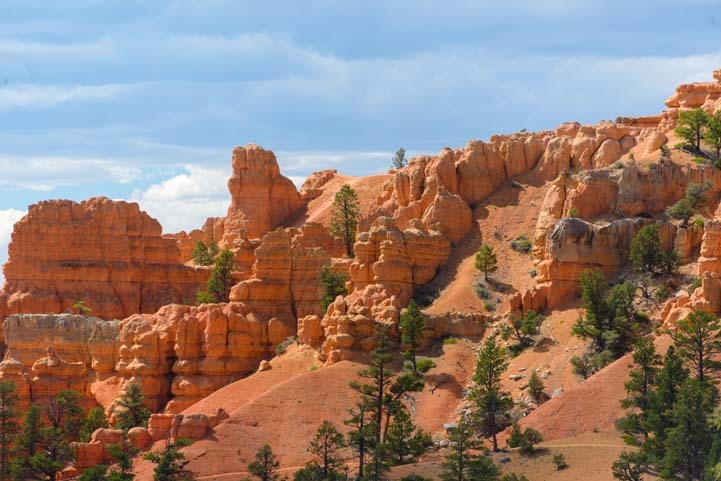 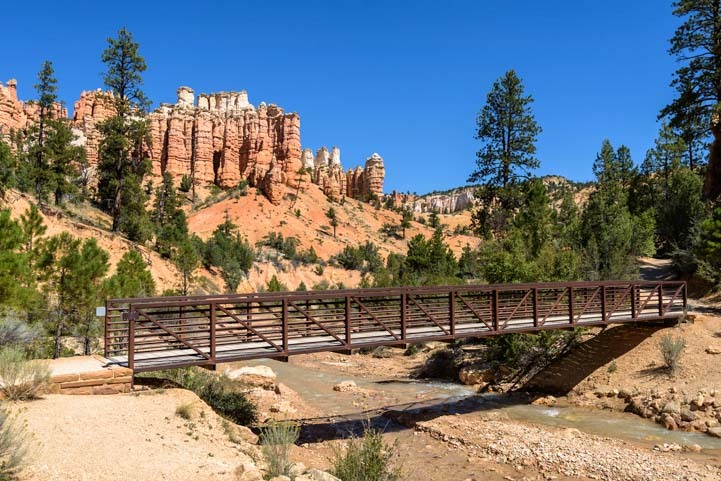 The thing that sets Bryce Canyon National Park apart from all other magnificent, world class canyons, including its nearby little sister, Cedar Breaks National Monument is the jaw-dropping symmetry of the red rock formations. 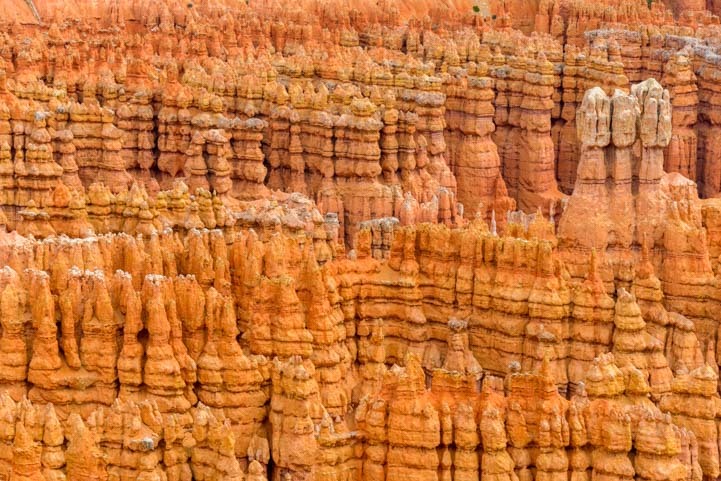 That wind and rain can join forces to carve sandstone into rows and rows of nearly identical pinnacles is extraordinary. 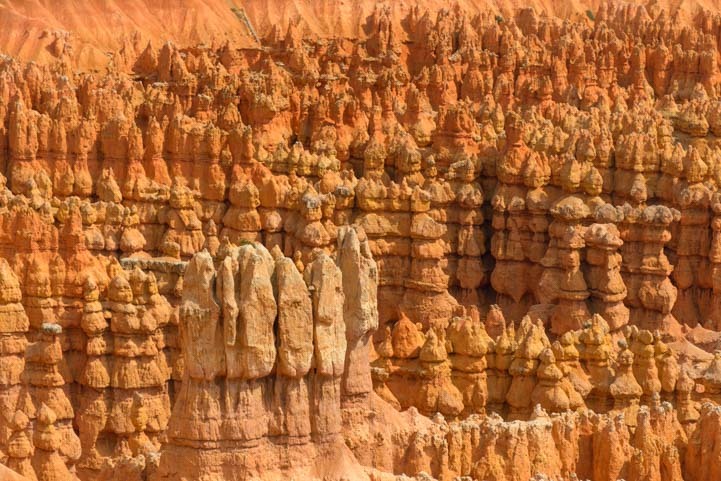 There are legions and legions of hoodoos in this red rock army!! 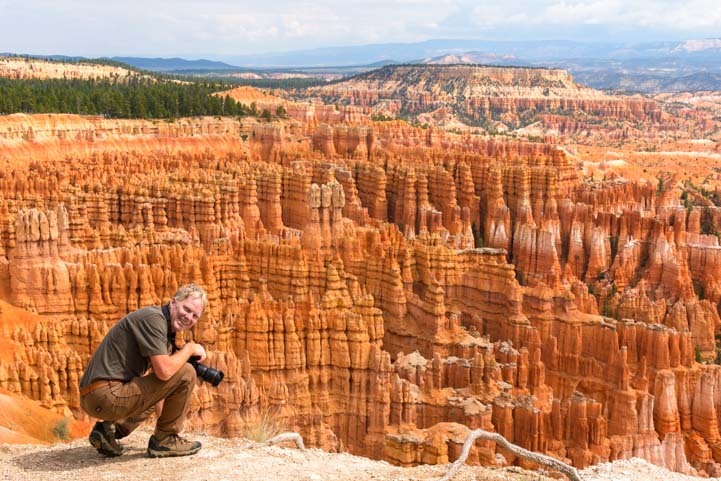 Bryce Canyon National Park is a fantastic area for photography, and we shot five thousand images between us during our stay. 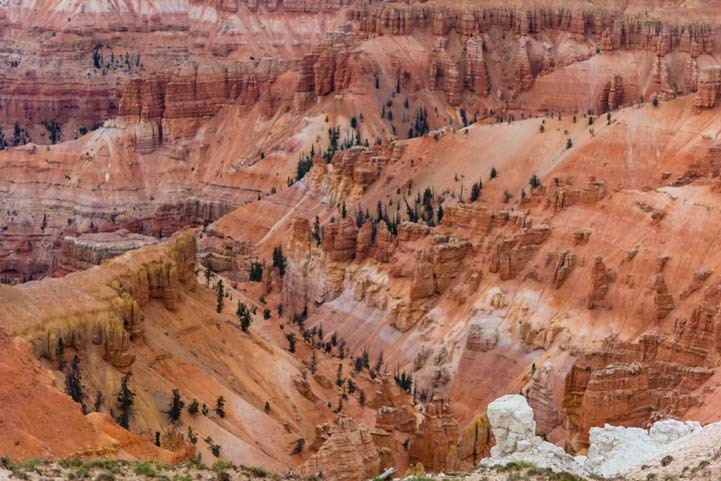 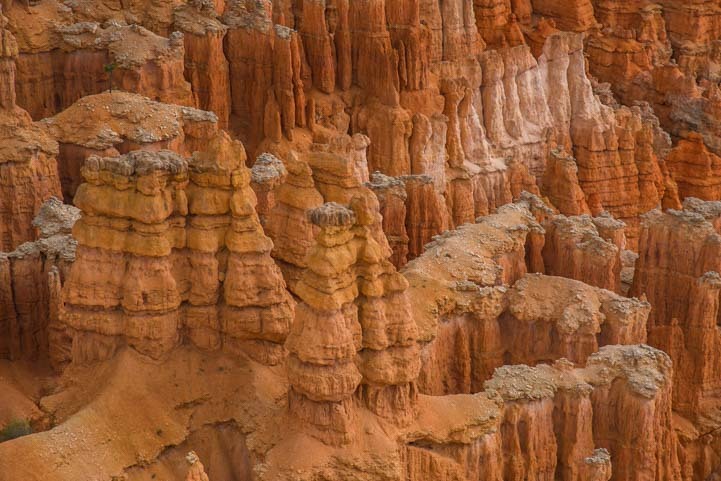 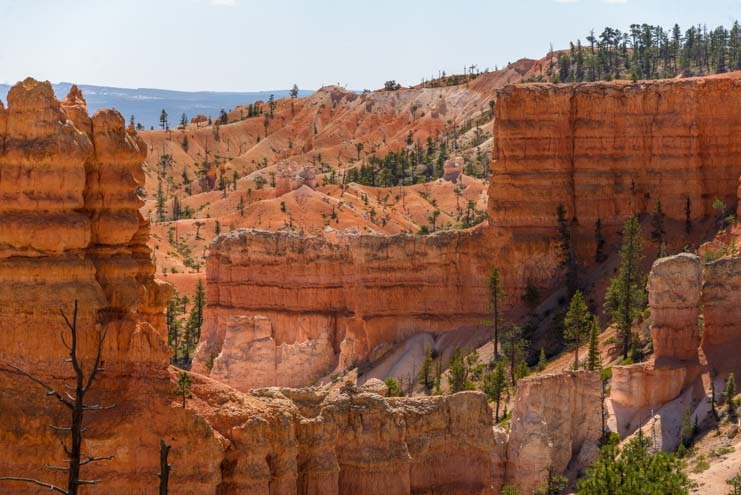 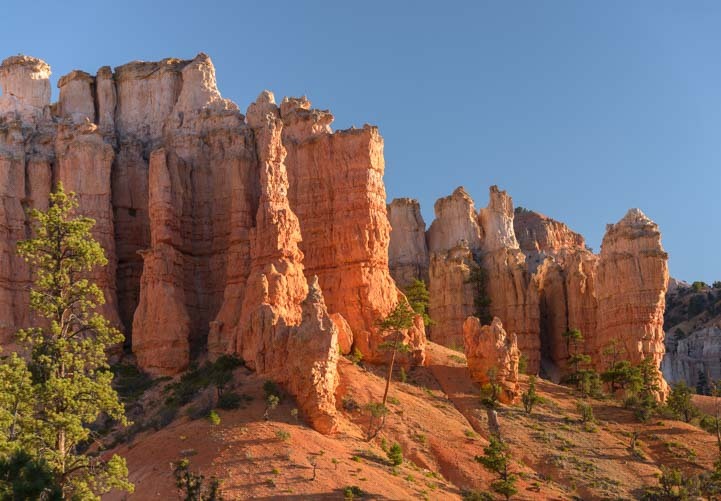 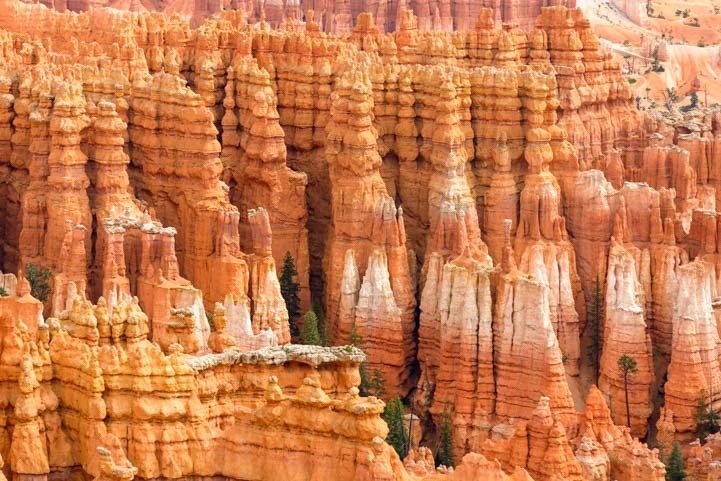 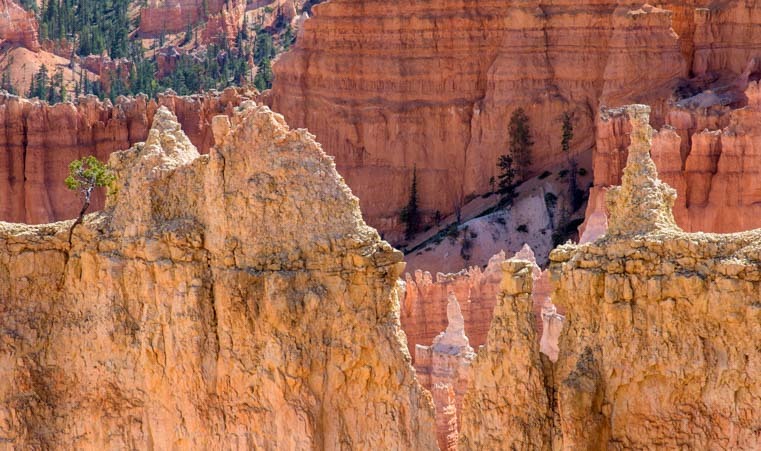 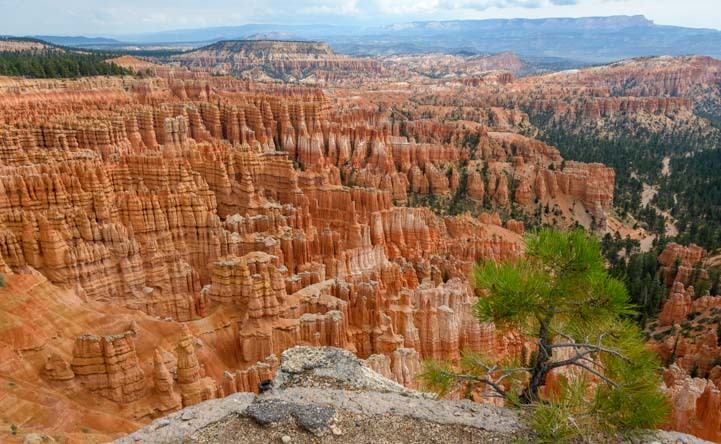 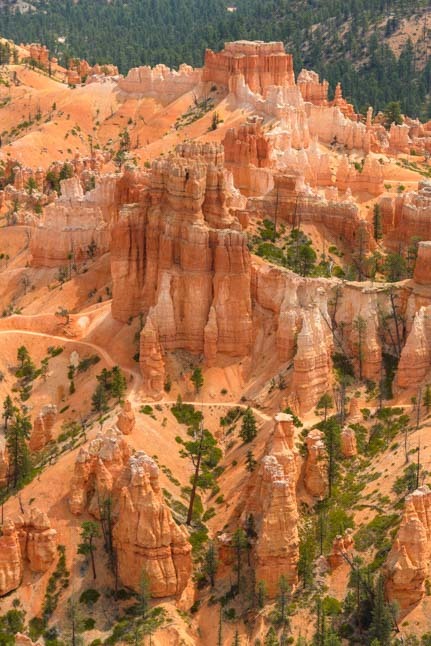 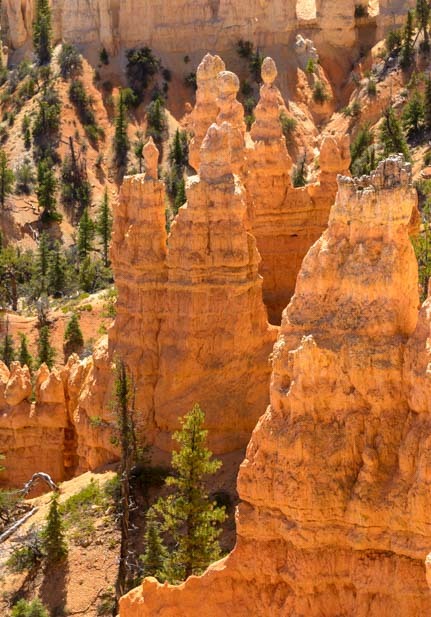 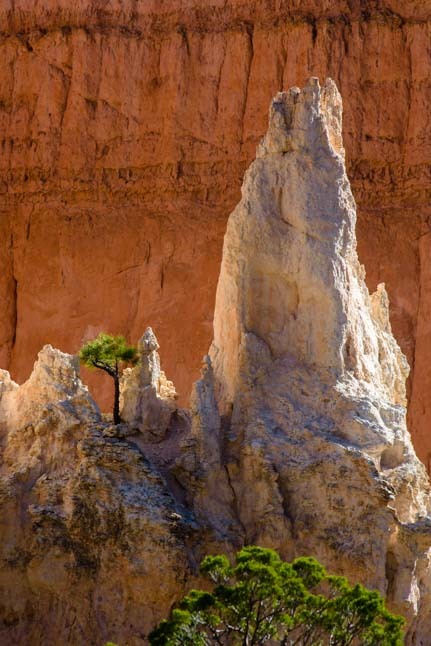 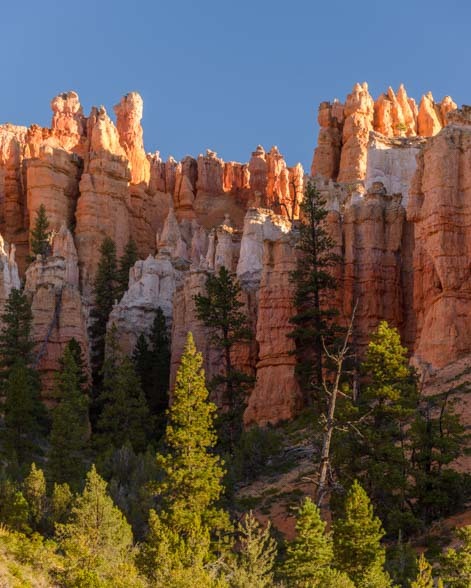 Bryce Canyon National Park is a massive amphitheater of red rock pinnacles and pink and white striped spires. 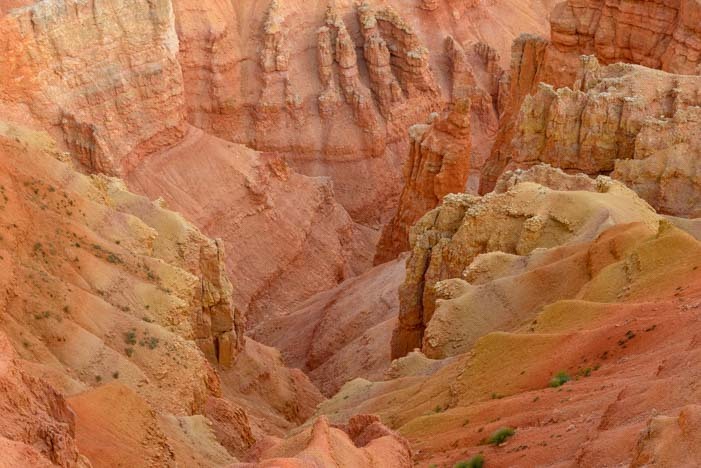 It’s as if the gods were playing on a huge red sand beach and created a million giant dribble castles. 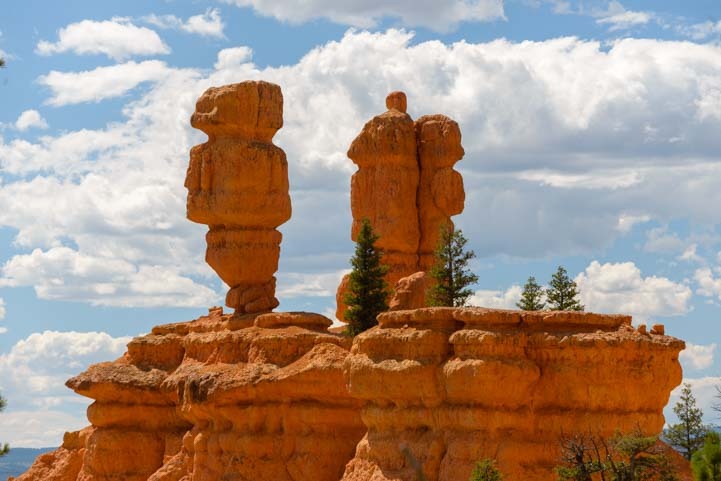 These are hundreds of feet tall! 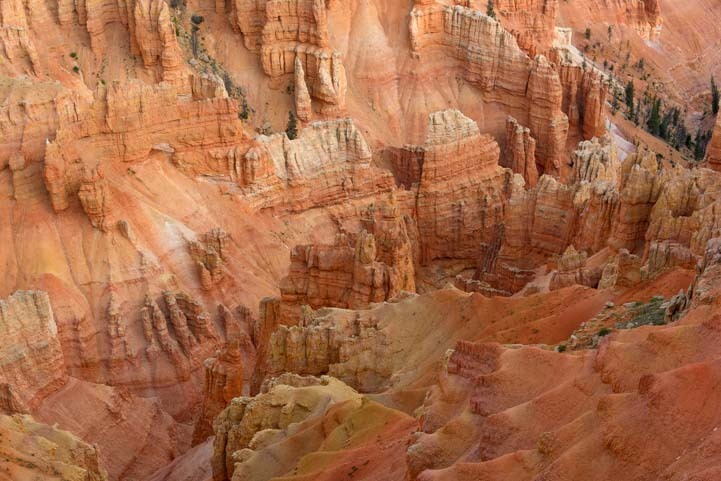 A person would be a mere speck. 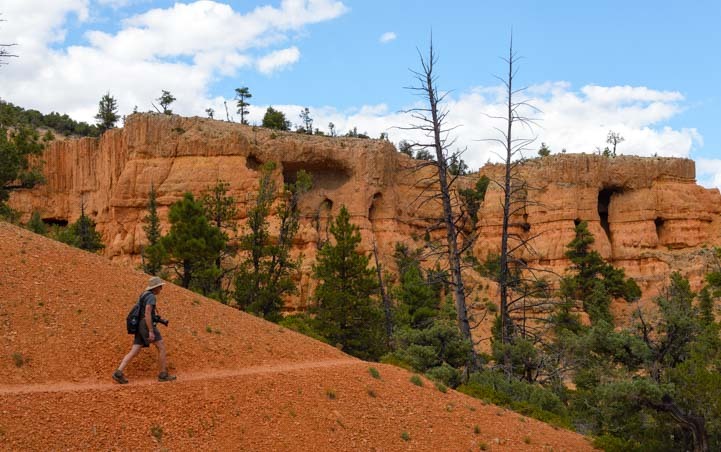 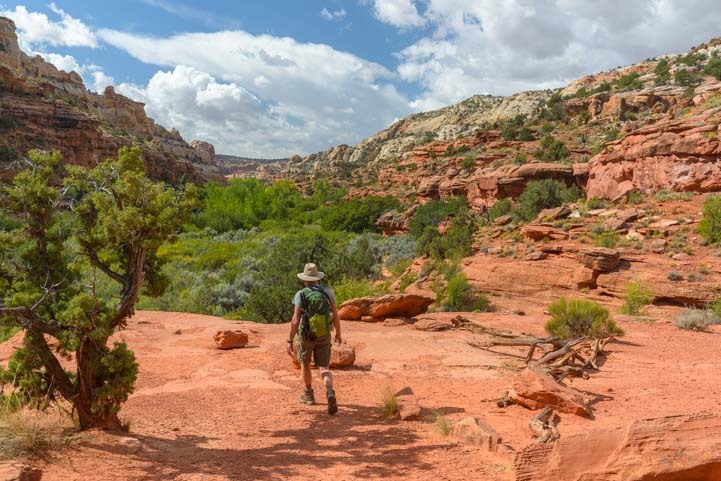 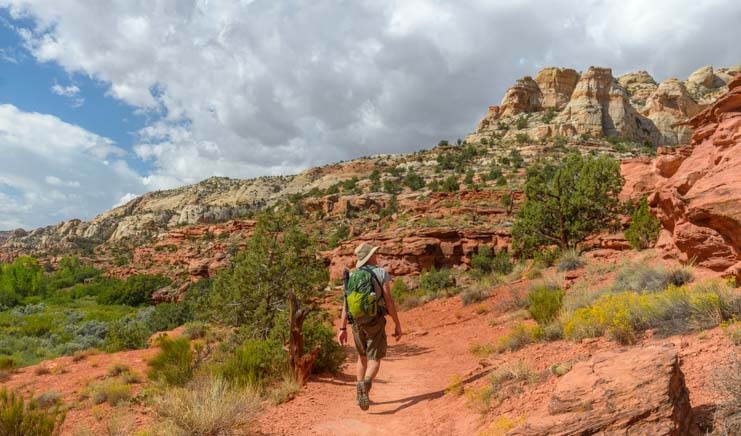 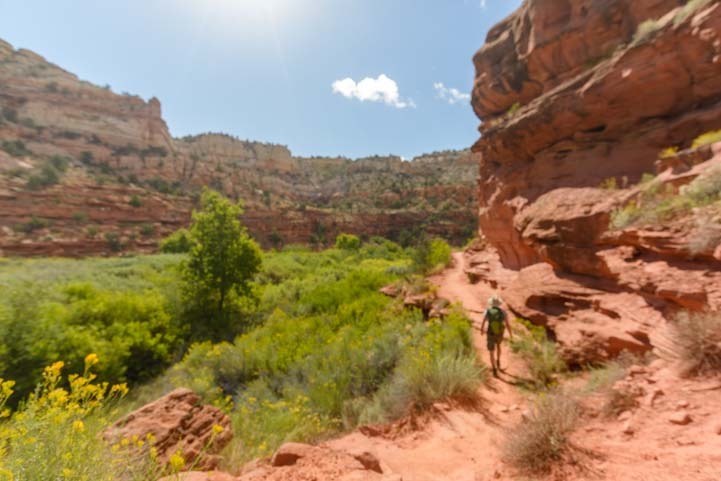 There is a wonderful trail along the rim of the canyon that is wide and smooth and easy to walk on. 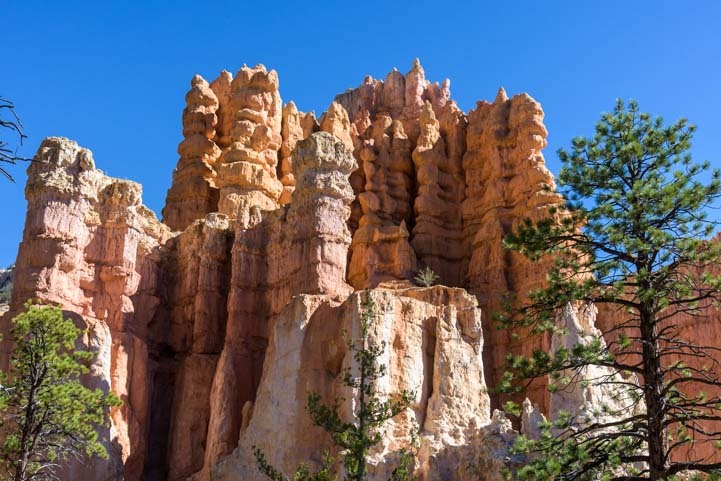 There are also many hiking trails into the heart of the canyon where you have a view from the base of these towers looking up towards the sky. 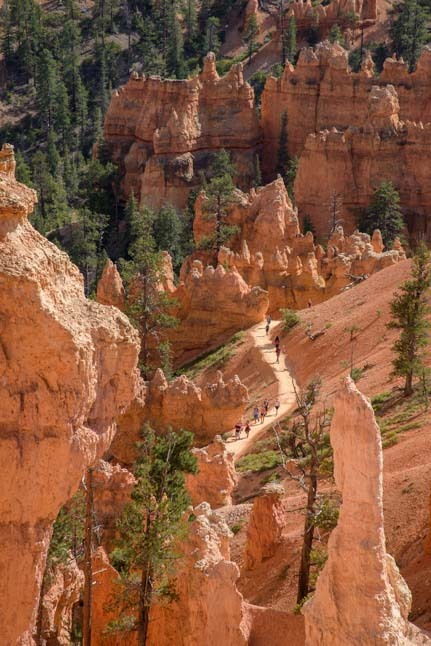 From Inspiration Point we could spot a few of these trails in the distance. 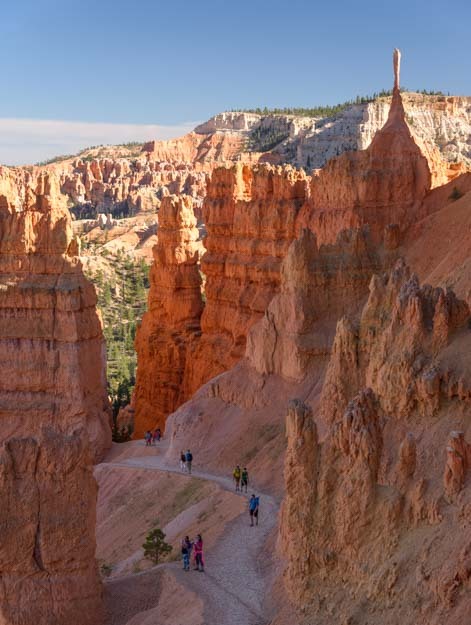 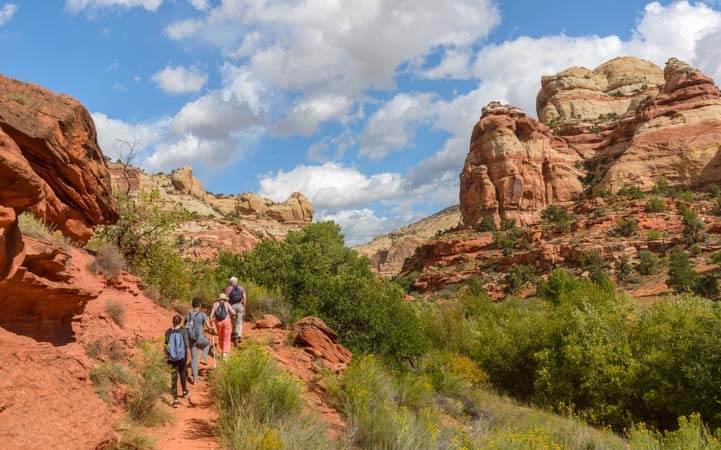 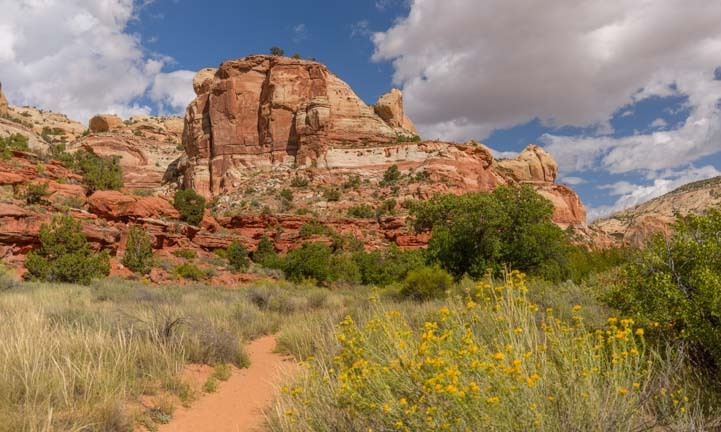 A hiking trail weaves between the spires. 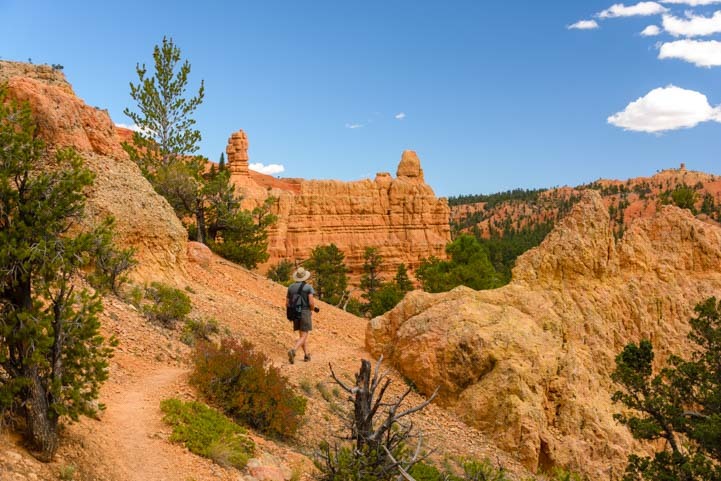 Some of the hikes are really popular and we could see people starting their hikes on the far side. 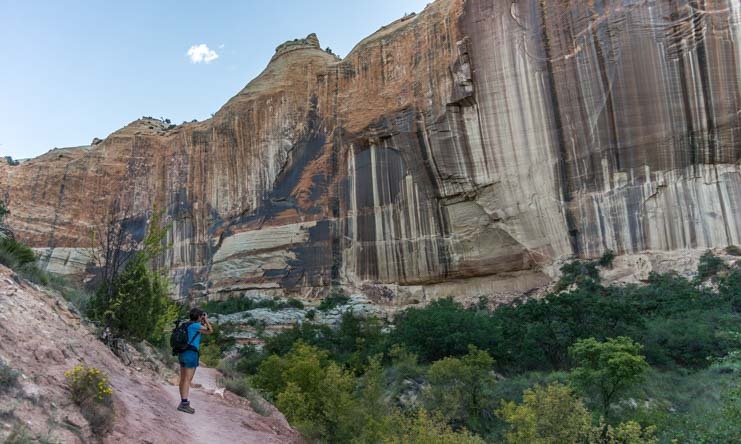 People head into the canyon on a hike. 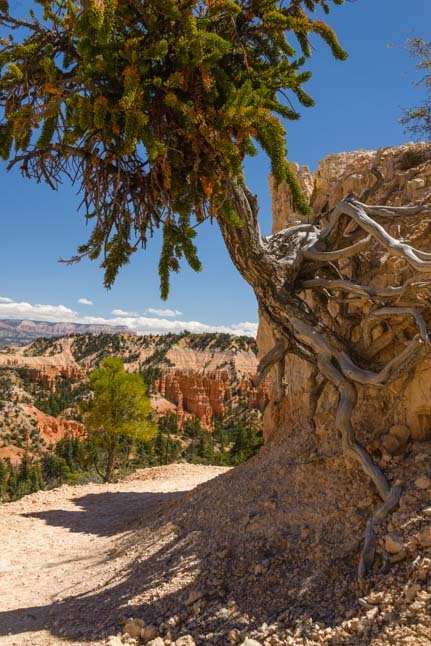 Here and there on the rim, a pine tree clung to the edge with a tenacious grip. 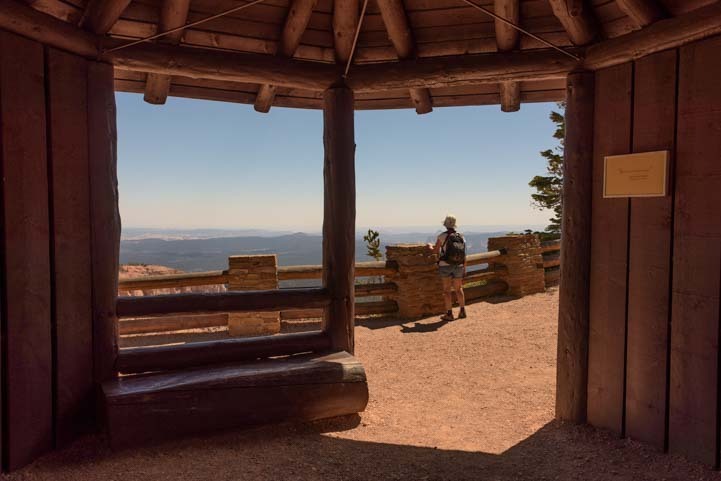 Following the Rim Trail up a steep climb past a series of overlooks, the final overlook is on top of the world and has a view across the entire canyon to the mountains, cliffs and valleys beyond. 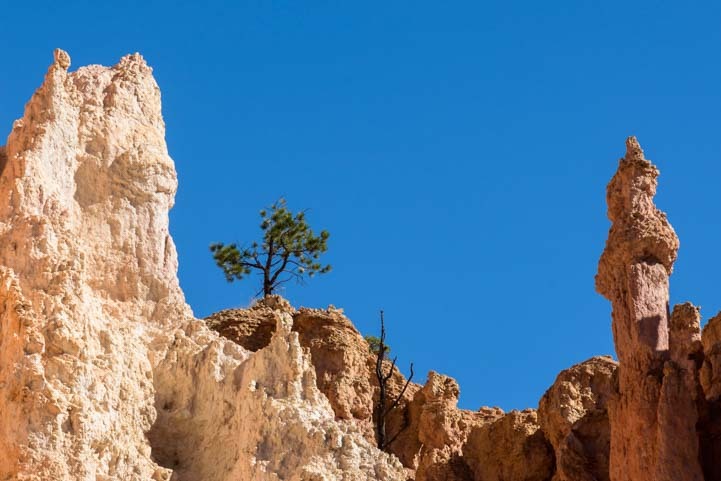 What a place to spot a soaring eagle! 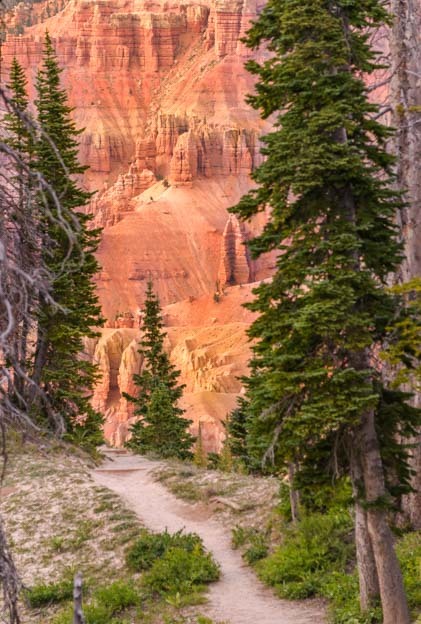 We are morning people, and we love getting out on the trail at dawn. 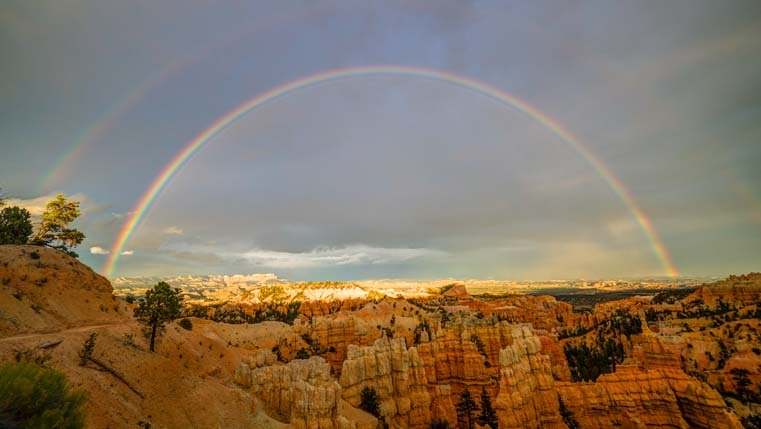 One morning, the sun peaked through storm clouds in dramatic fashion. 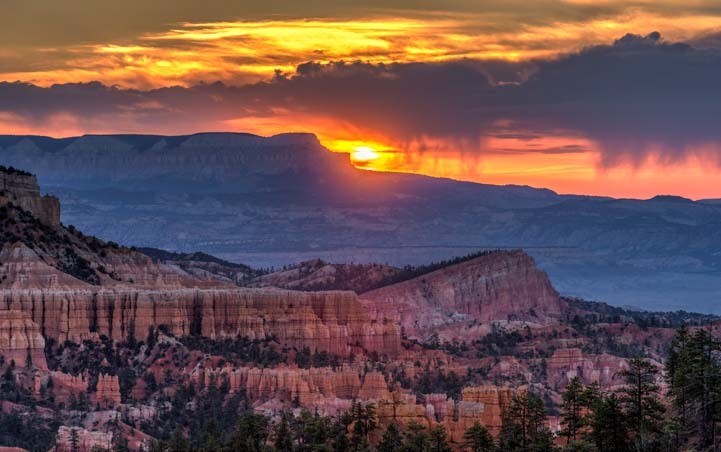 The sun works its way through storm clouds at dawn. 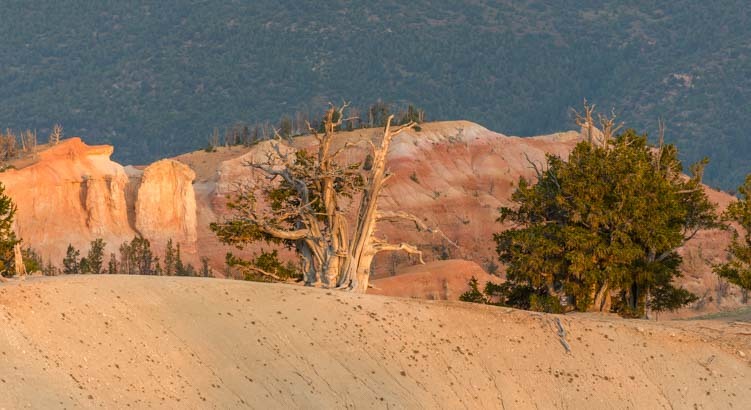 The rising sun lit a ponderosa pine in beautiful shades of vivid orange. 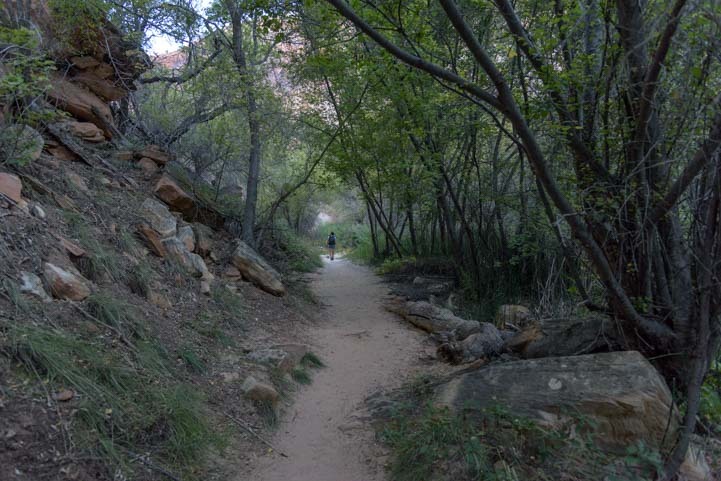 Even at this early hour, we were far from alone on the trail. 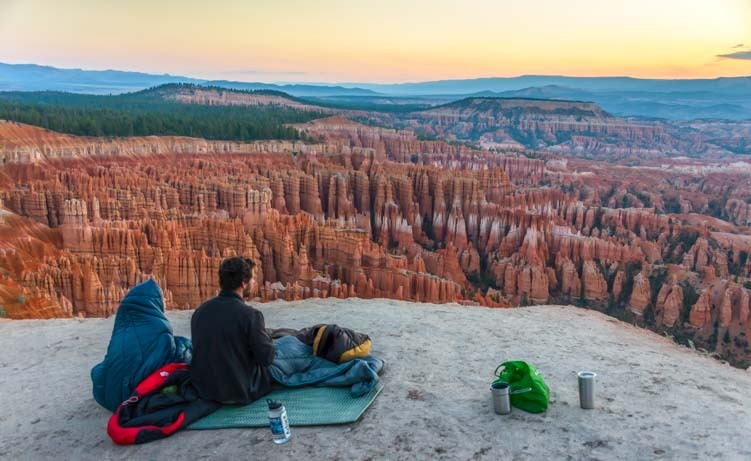 Some people brought cups of coffee and wrapped themselves in blankets to see the sun rise. 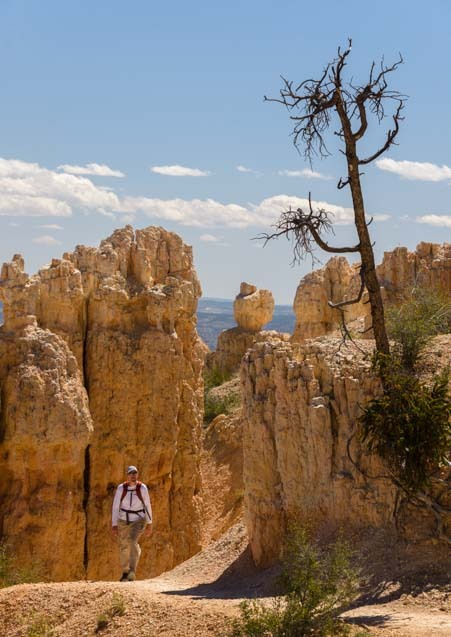 Others brought fancy cameras and tripods and staked out spots for beautiful photos. 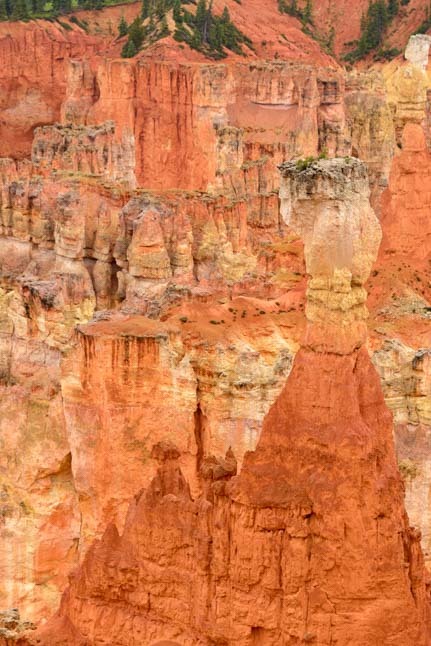 All of us lined up and faced the far side of the Canyon, which is due east, like little birds sitting on a telephone wire. 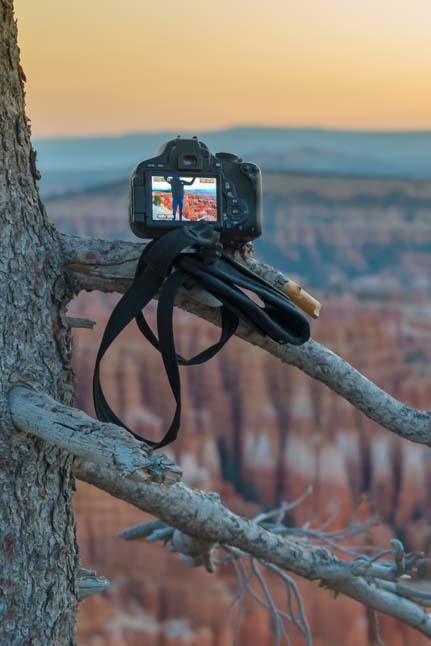 As I walked along the rim enjoying the glow of the sunrise light, I noticed a camera sitting on a tree branch. 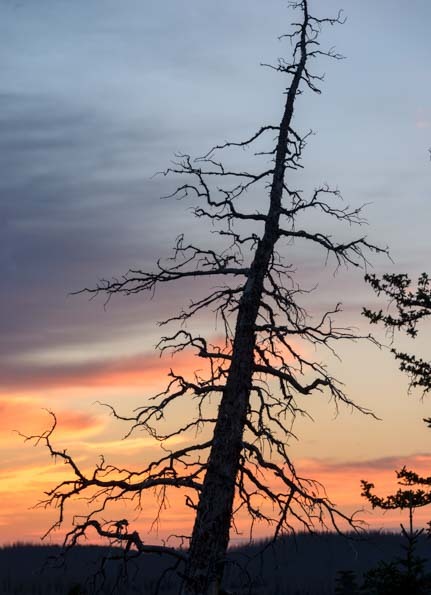 It was still displaying the image of a guy holding his hands out towards the rising sun. 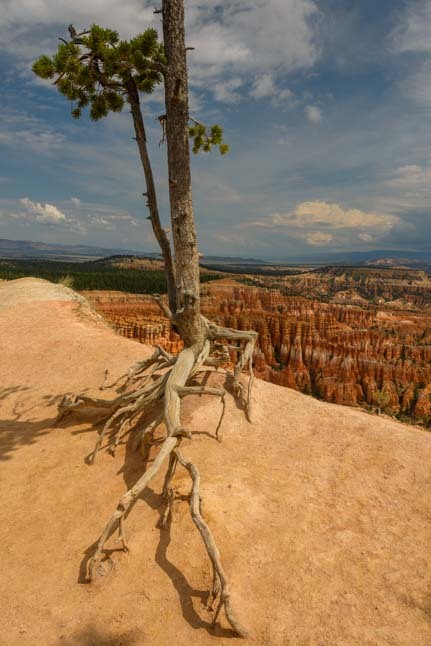 But the guy was nowhere to be seen! 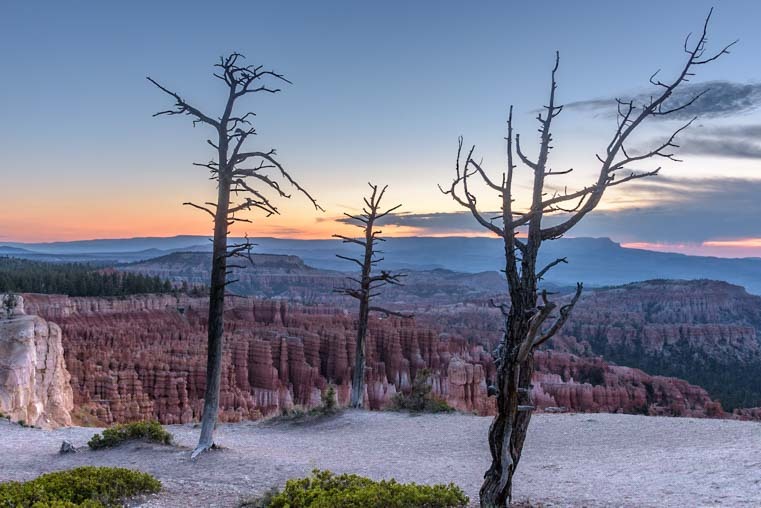 When the final shades of pink faded to gray and the sun peeked over the horizon, everyone at the rim seemed to let out a collective sigh and begin to chat with each other. 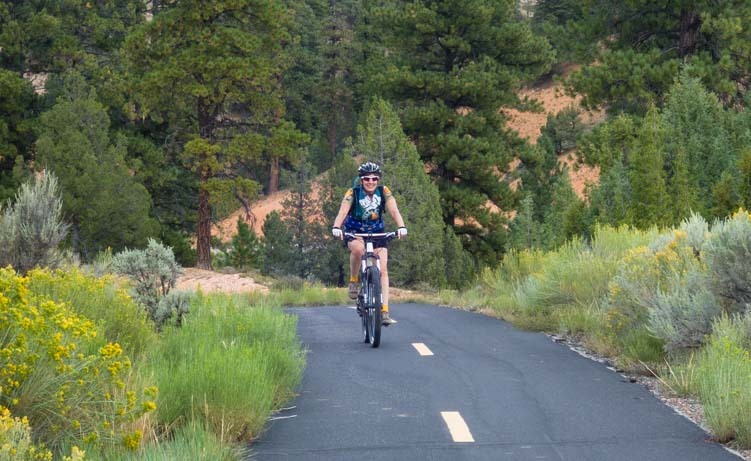 There were smiles all around. 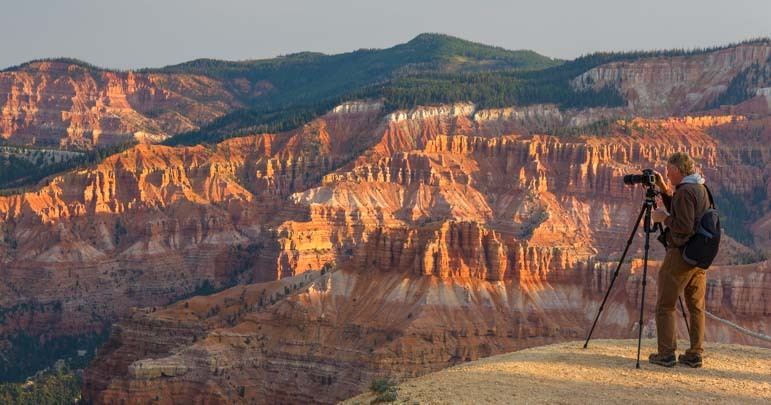 The Rim Trail goes both north and south from Inspiration Point, and a walk in each direction is worthwhile, especially when the sky lights up at sunrise. 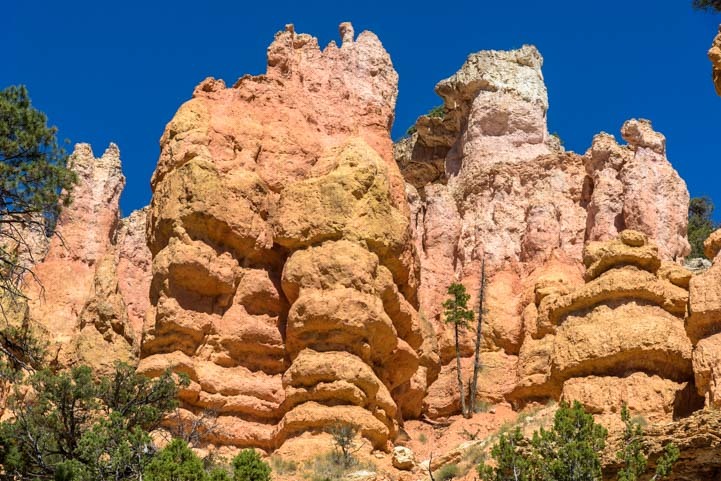 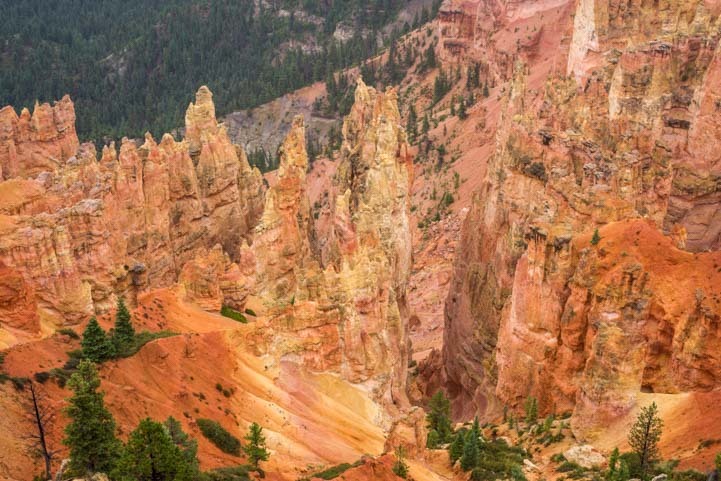 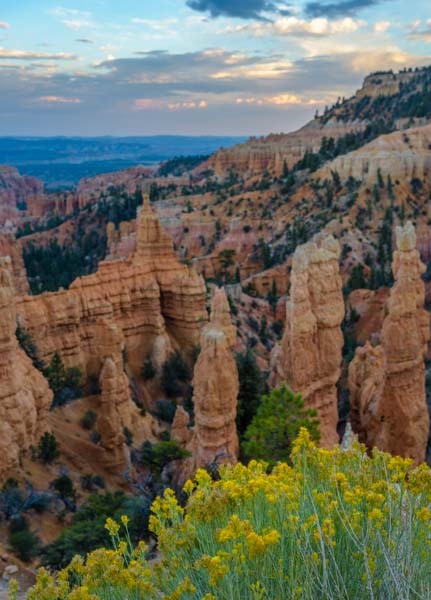 Of course, Bryce Canyon National Park is all about vivid color, and the oranges, pinks, yellows and whites of the sandstone blending together in mesmerizing patterns. 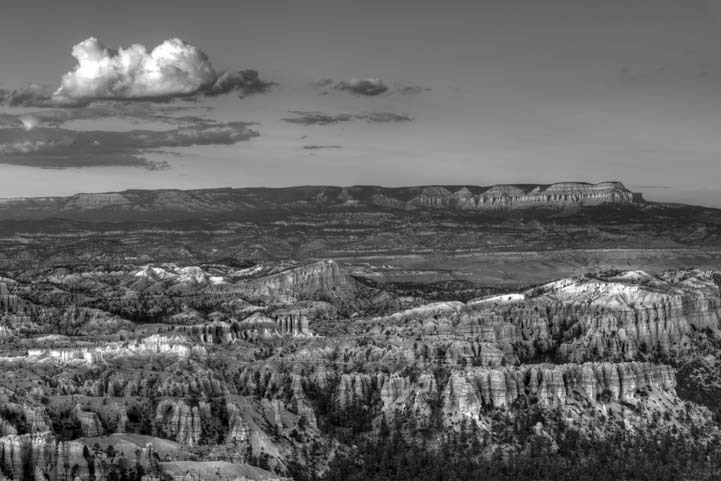 But even when the color is taken away, a black and white image of the Park is alluring. 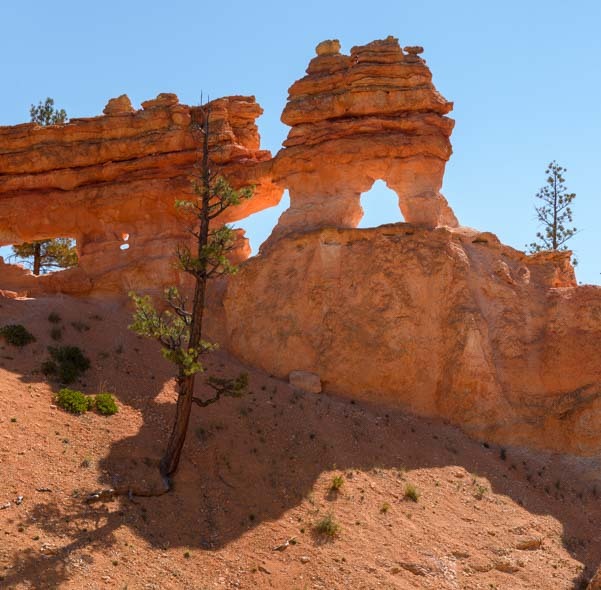 Heading south a few paces from Inspiration Point one afternoon, we came across a different kind of red rock hoodoo than the precision cut ones seen in the views as you face north. 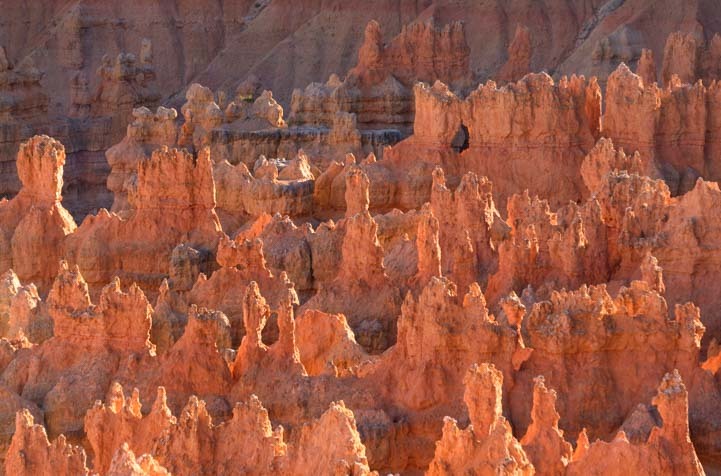 These were more haphazard and jagged and they glowed in the afternoon light. 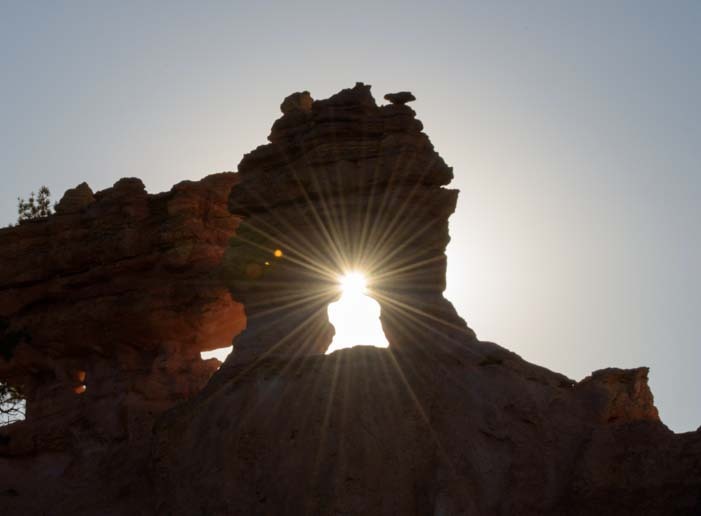 As the sun lowered in the sky, the craggy rock formations seemed to be lit from within. 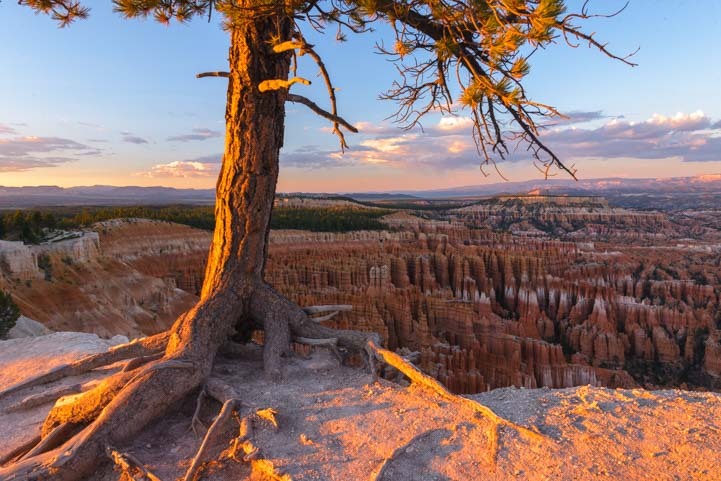 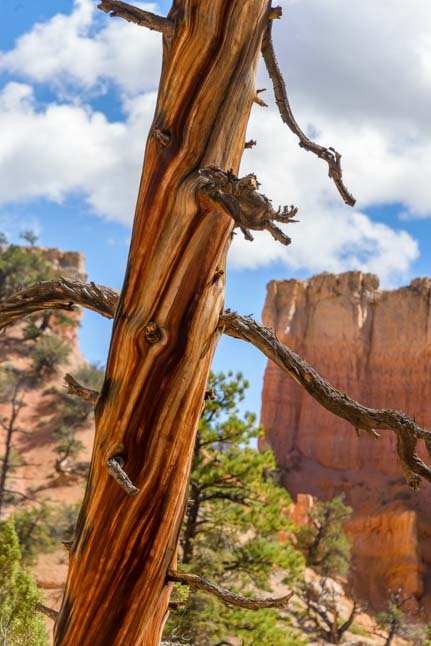 In the same way that sunrise casts an angelic glow across Bryce Canyon in the morning, the light in the late afternoon becomes a rich orange, and it lit up the backside of a pine tree perched on the rim. 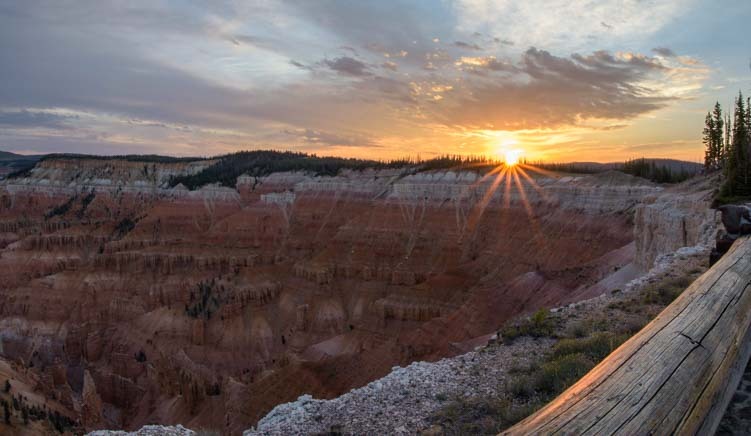 The sun sets behind the Canyon, that is, it sets behind your back as you face Bryce Canyon’s views. 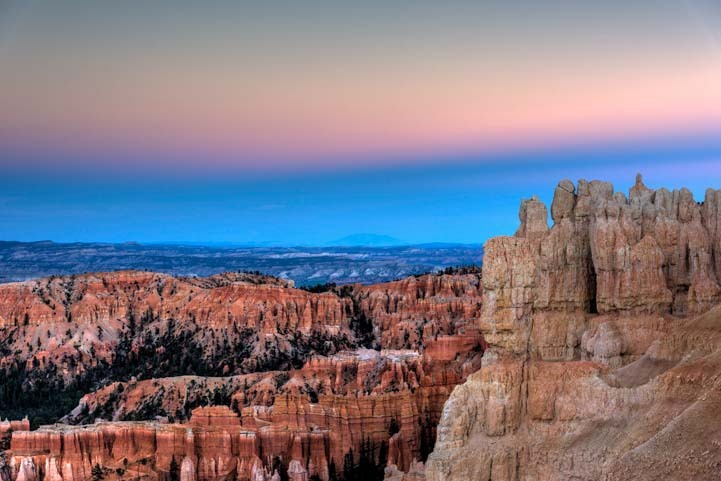 But once it has sunk below the horizon, the eastern sky takes on the unique pink and blue hues of dusk in the desert. 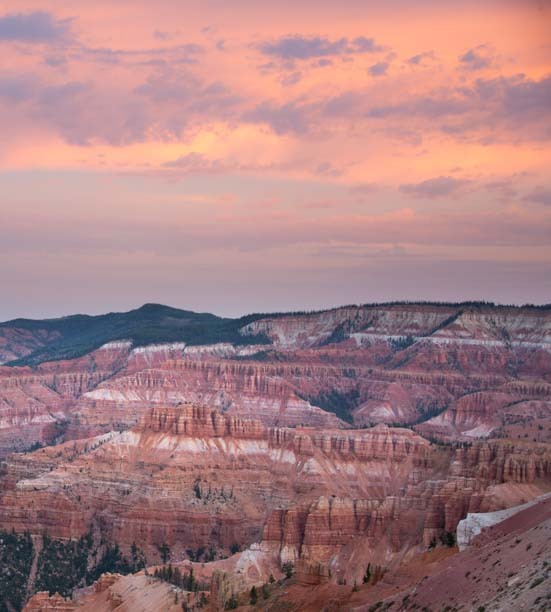 The desert sky turns pink and blue at twilight. 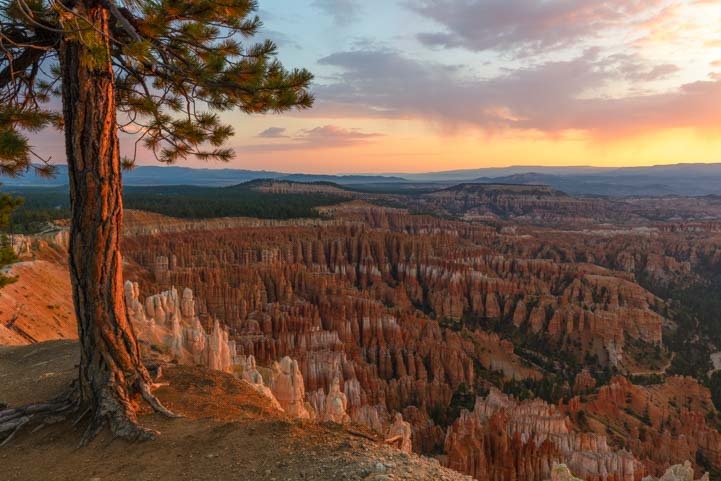 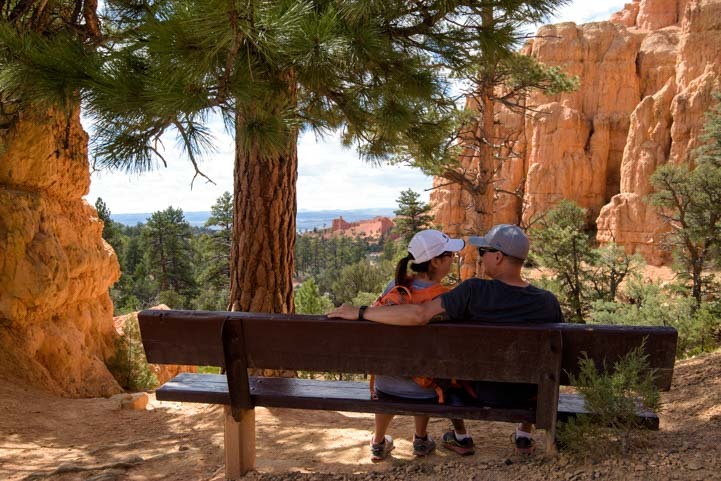 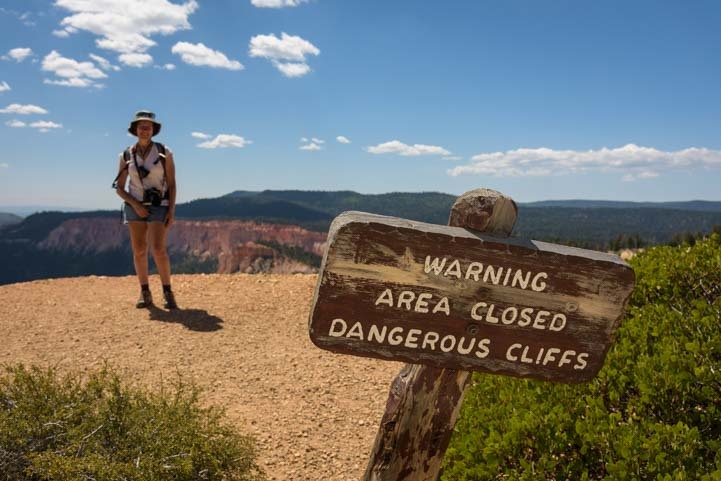 Inspiration Point is truly the most dazzling part of Bryce Canyon National Park, and whether you have three hours or nearly three weeks to explore the Park, as we did, it is a thrilling place to start. 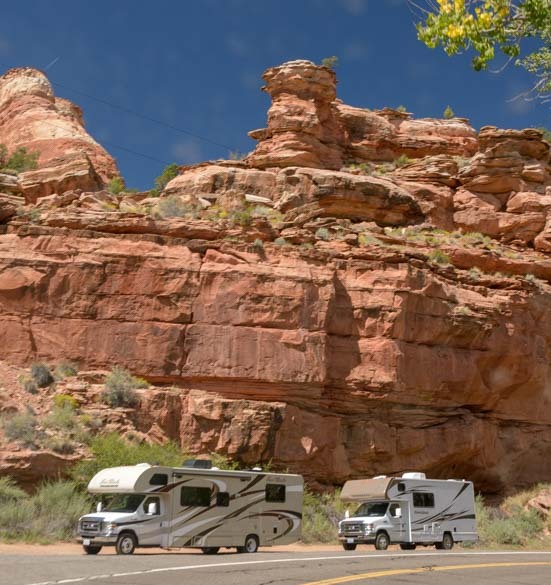 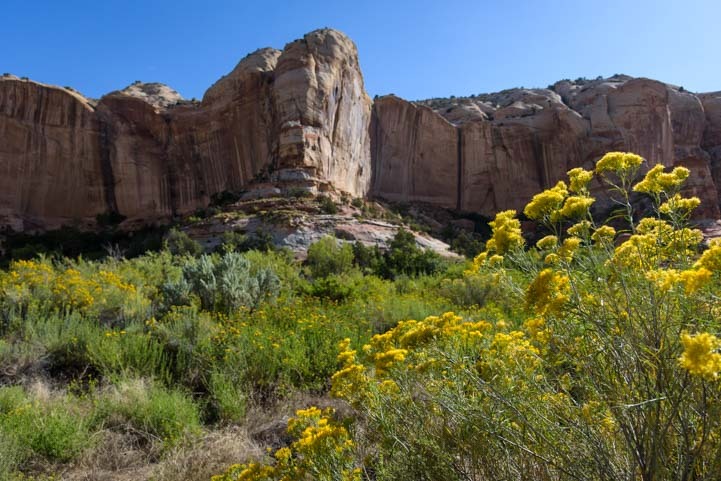 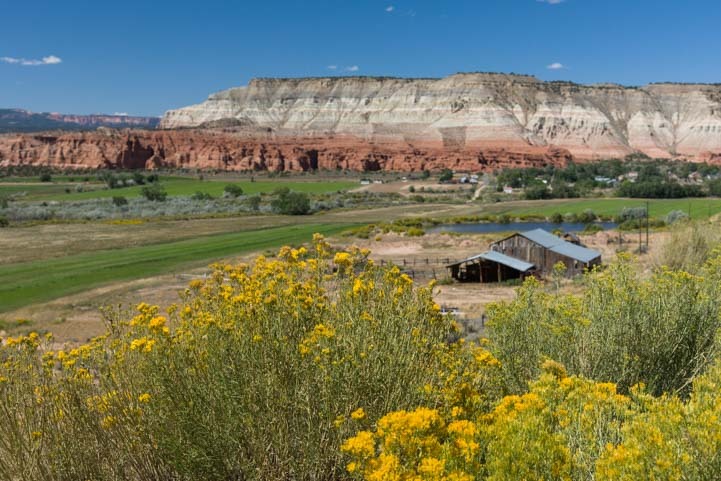 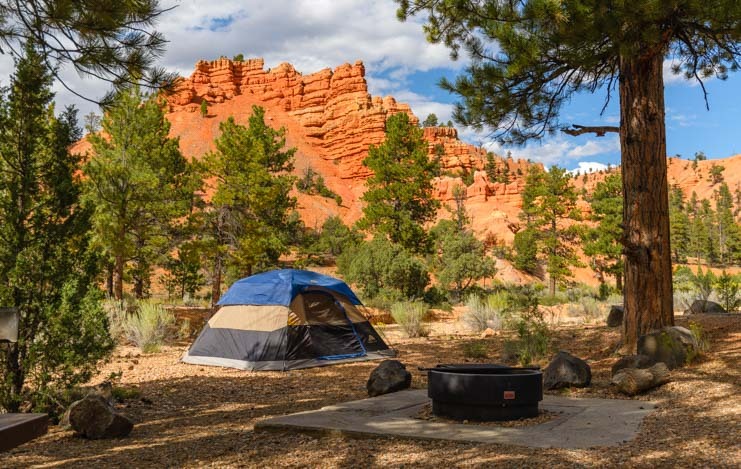 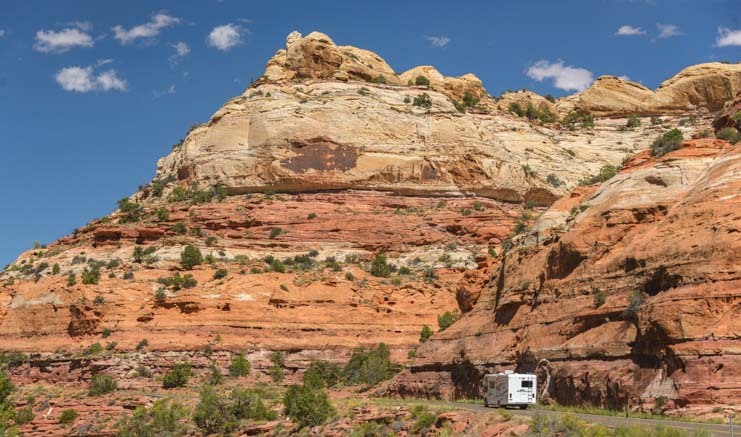 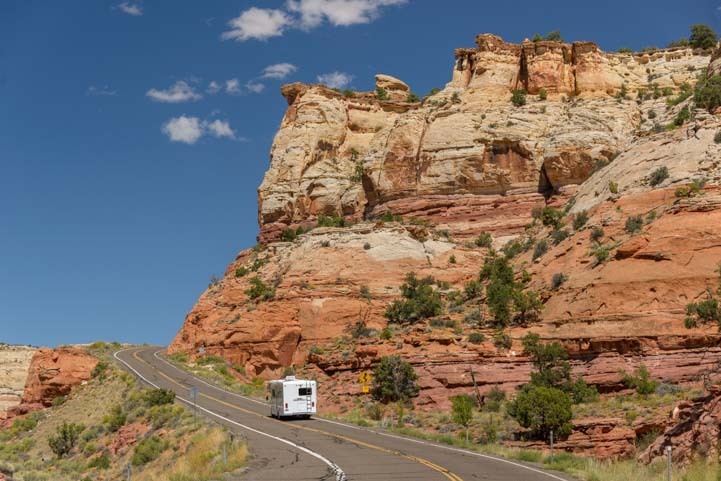 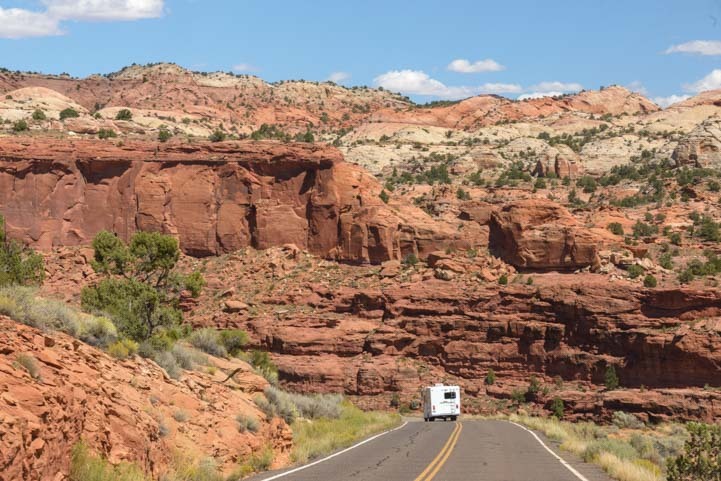 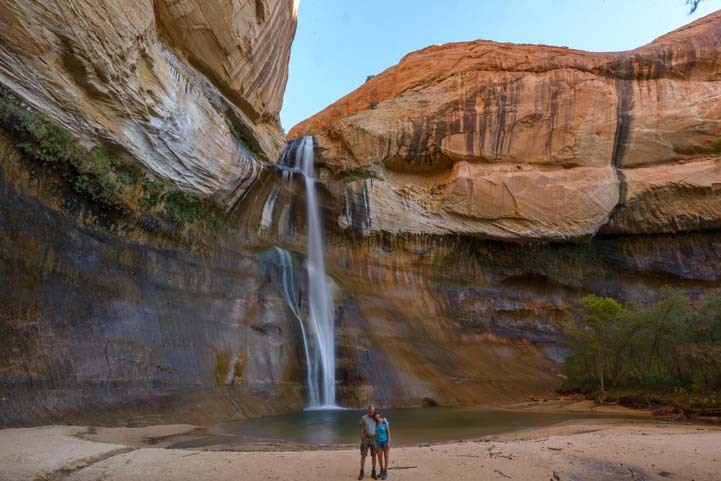 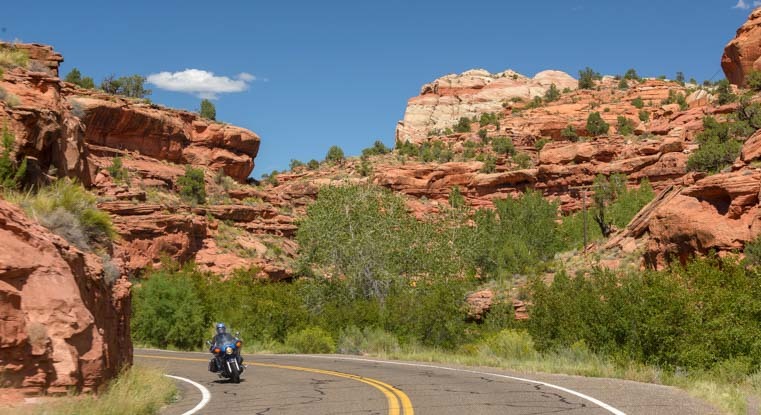 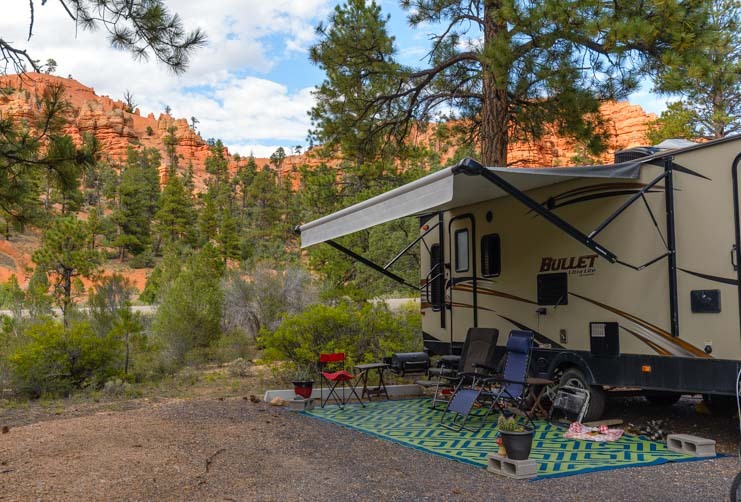 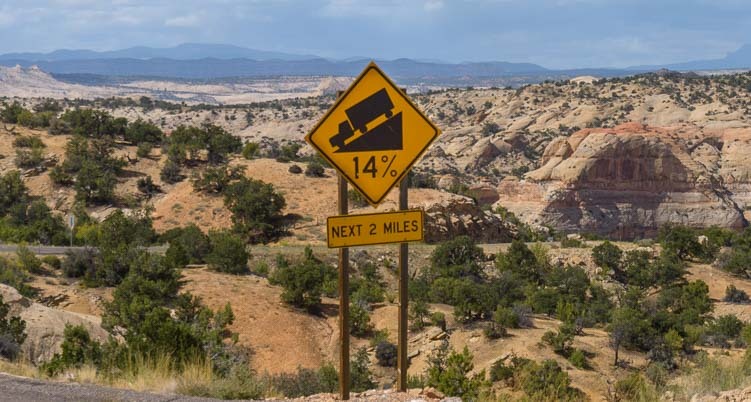 Red Canyon Campground – Beautiful dry camping with 6-8 campsites big enough for our 36′ fifth wheel trailer. 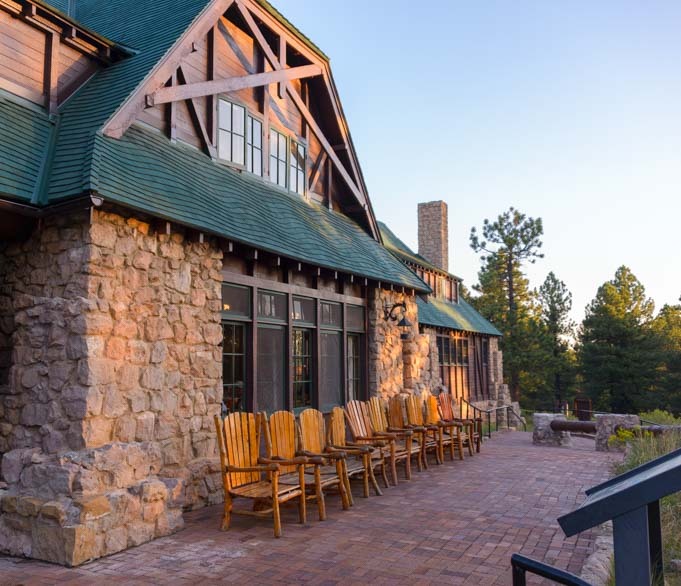 Several were available during our stay.